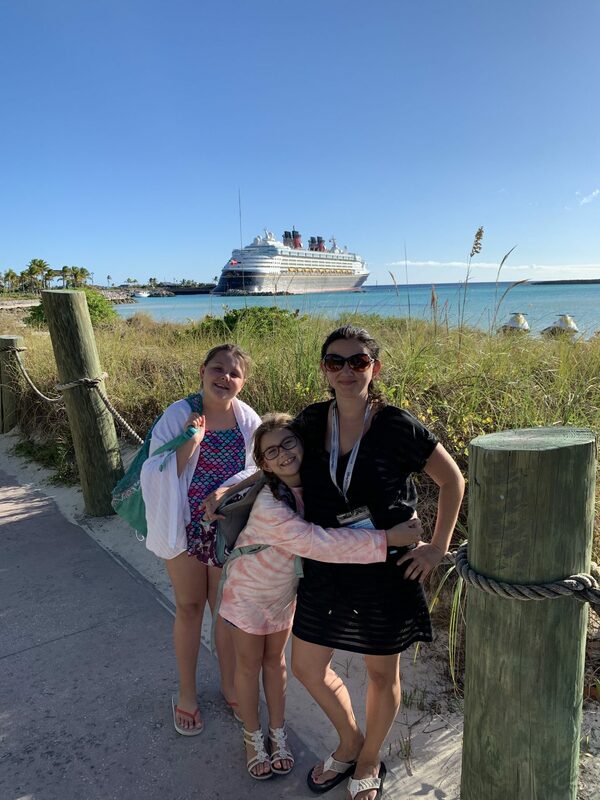 Disney’s Castaway Cay is my absolute favorite day when sailing with Disney Cruise Line and easily my favorite private island! My feelings are not alone! 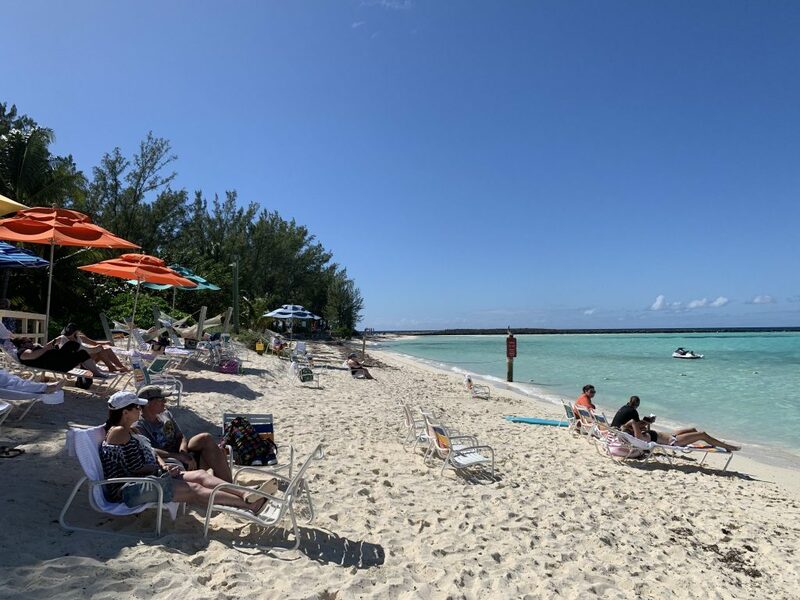 In fact, so many cruisers love Castaway Cay that Disney Cruise Line occasionally offers 2 stops at Castaway Cay on the same sailing. 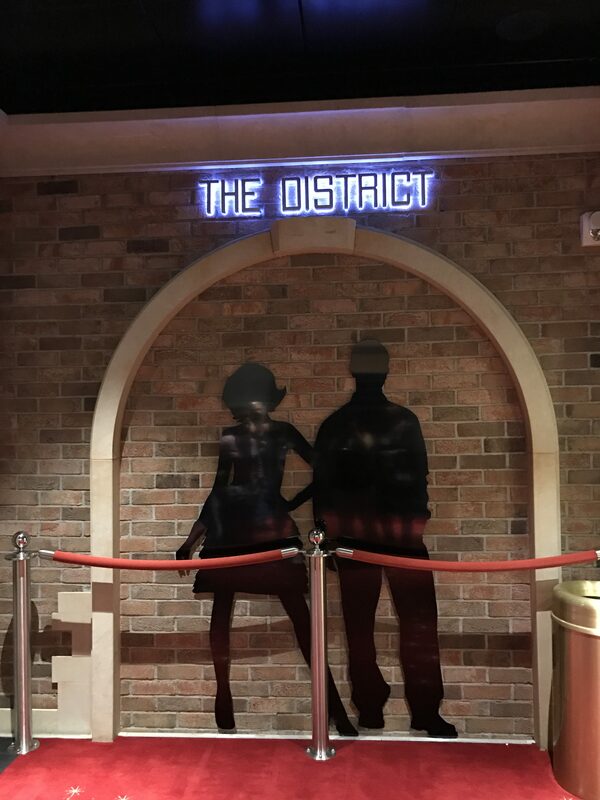 We call this the “double dip”! 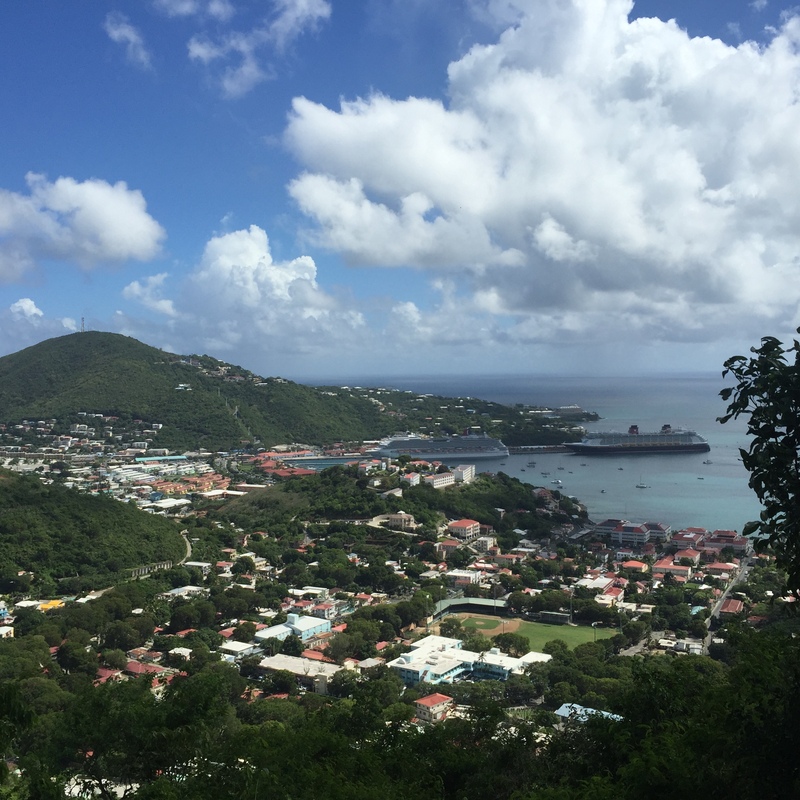 Read on to find out all about the island and what you should not miss while visiting! 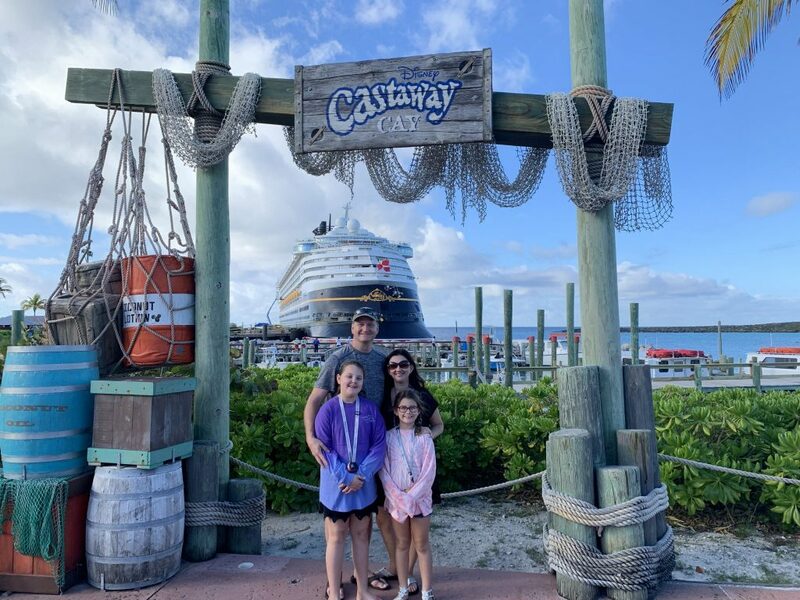 What is Castaway Cay (key)? 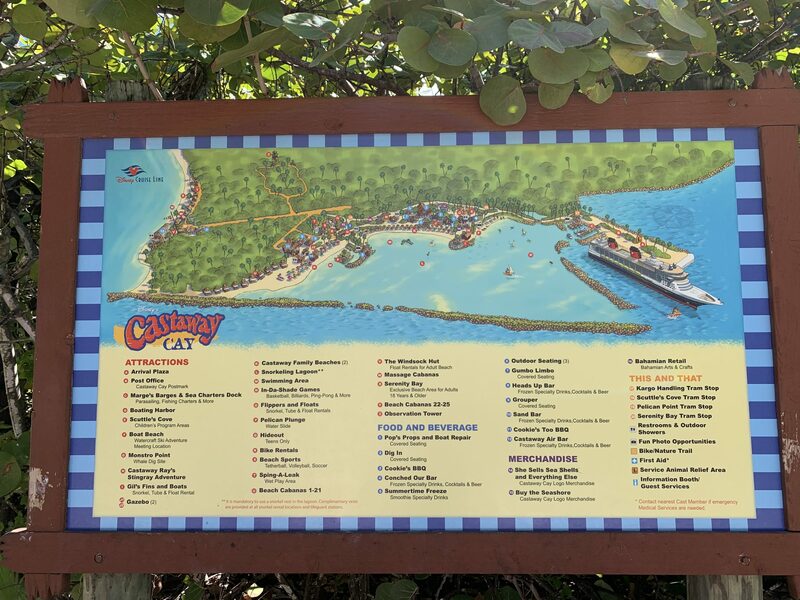 Castaway Cay is Disney Cruise Lines private island that is a one day stop for most of their Bahamas and Carribean sailings. 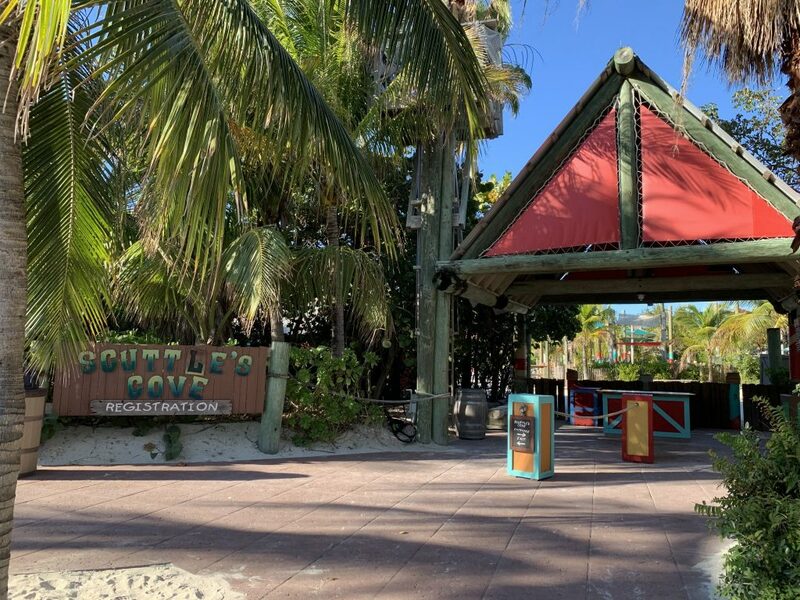 It’s the first of Disney’s private islands, the second has yet to be named or any announcements made on when it will be ready for guests. Which side do you dock on? 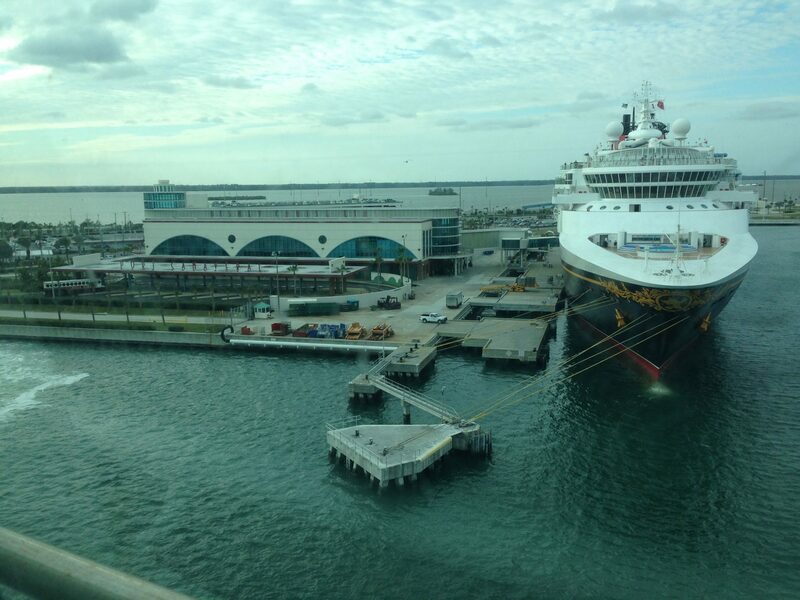 Disney backs the ships into port so the Port side ends up looking at the dock and the Starboard side at the island. There really isn’t a bad view it just depends on what you prefer to look at. 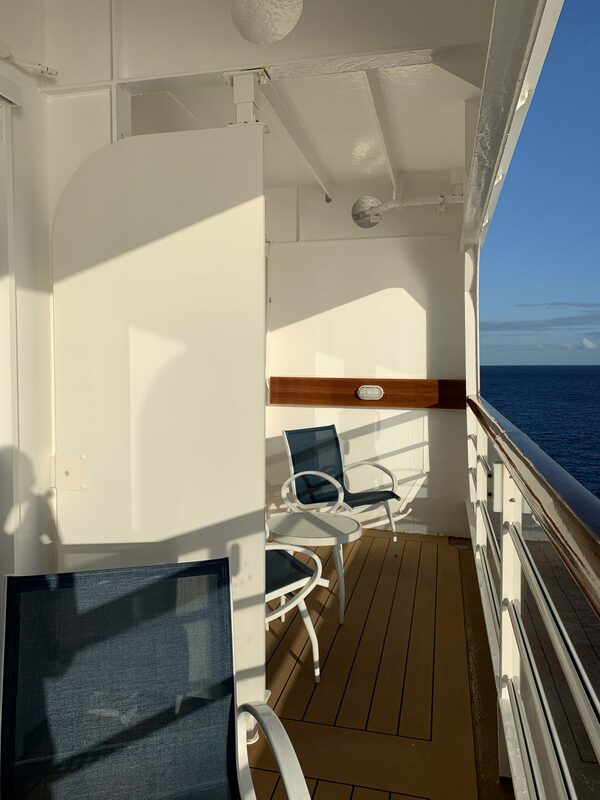 Many guests in a verandah stateroom enjoy having the island to look at while others enjoy watching the hustle bustle of the crew preparing the island as soon as you’re in port. It’s quite a scene watching crew members unload the ship for the day’s activities. All of the food and beverages for the day are unloaded when the ship arrives. It’s literally a catered meal on the island. 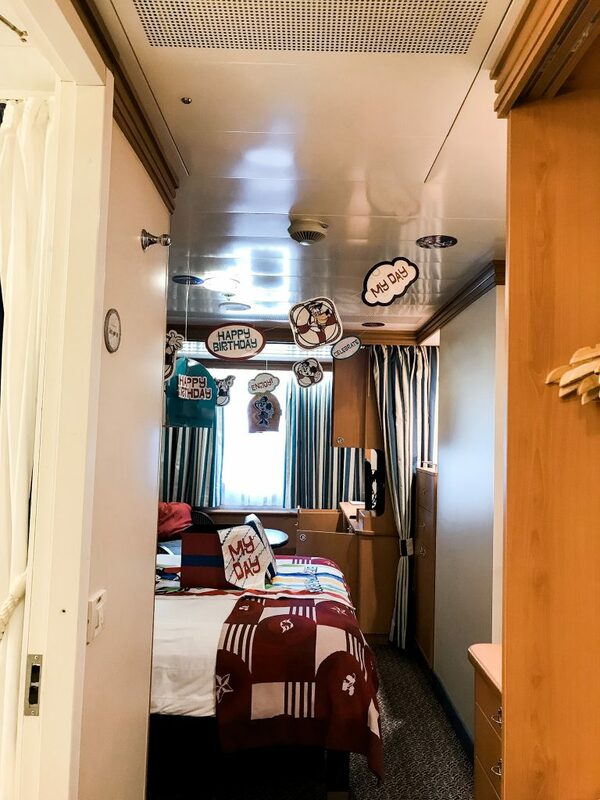 At the end of the day, the crew loads everything back onto the ship including all of the towels that guests use on the island during the day. 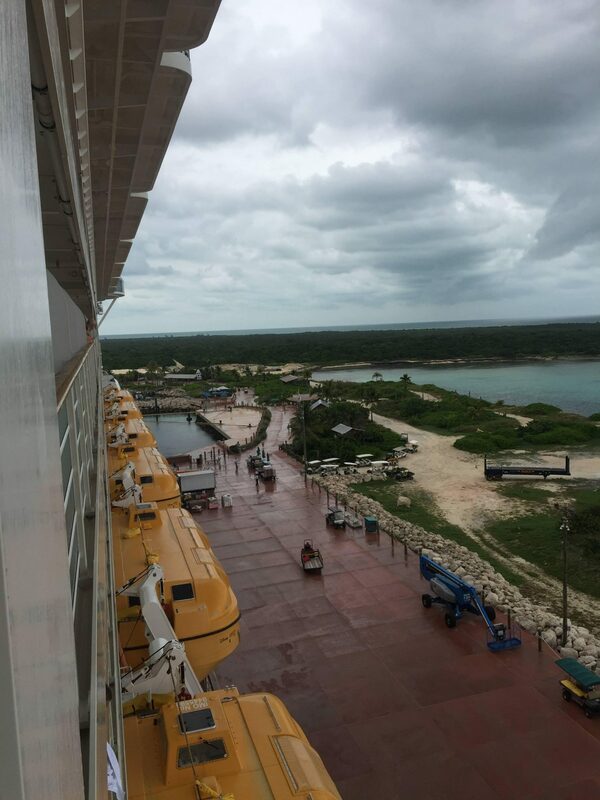 For most itineraries the ship will dock at Castaway about 7:40 am. 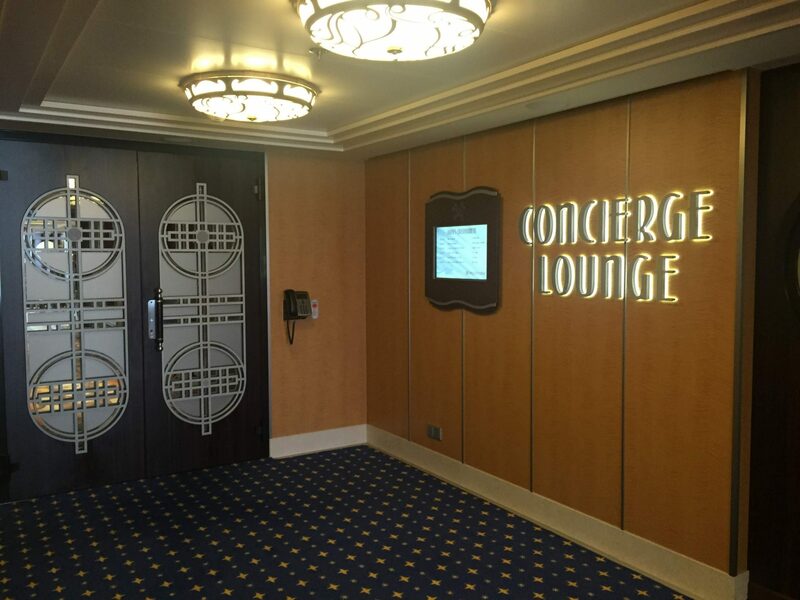 and guests will be able to disembark the ship at 8:30 am. 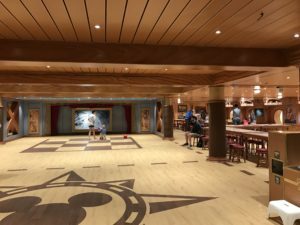 Guests signed up to do the Castaway 5K will be the first off the ship. 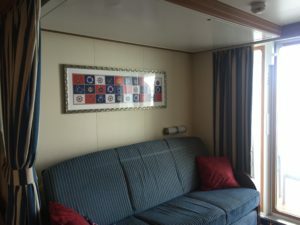 The easiest way to understand what’s included on the island is to think about what’s included on the ship. 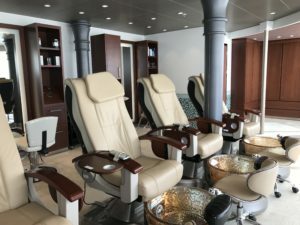 The island is essentially an extension of being on the ship so that included amenities are the same. 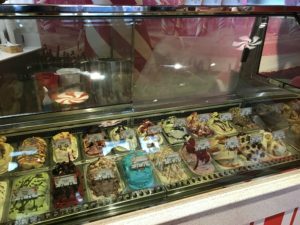 All of your food which includes a BBQ lunch and ice cream all day, plus fountain beverages are included. Extras like excursions, alcoholic beverages, bikes, snorkel and fins, and other rentals are not included. 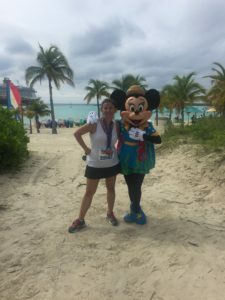 One of the biggest extras included on Castaway is the 5k. Yep, it’s true! The 5k is free on the island! This is about a $100 value. 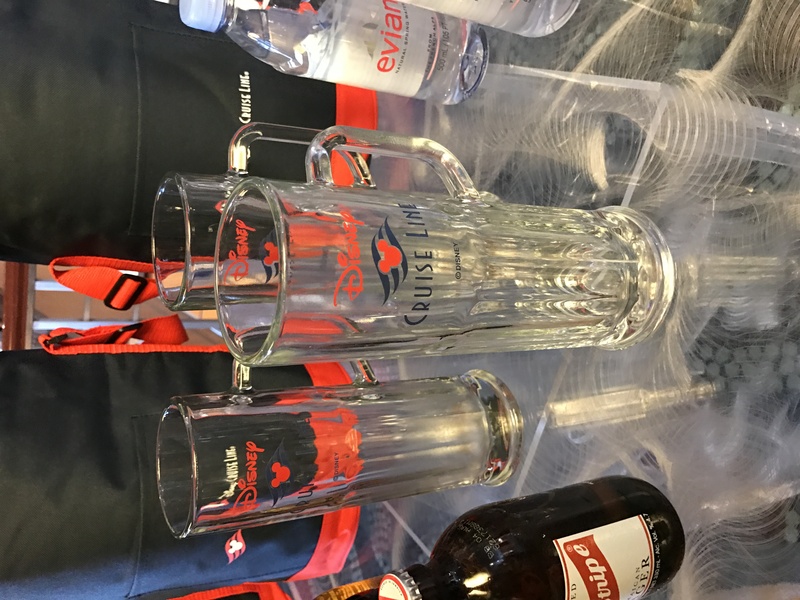 Guests do need to register for the race prior to race day at the shore excursion desk. 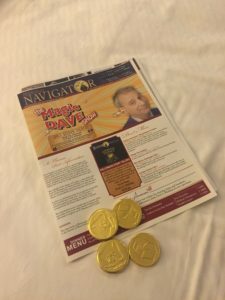 How much should I expect to spend on Castaway? You could literally spend nothing although I don’t necessarily recommend this. You should explore the island and that will require a little spending. We love to rent bikes and ride around the island. There are great bike paths and a lookout tower on the far side of the island. 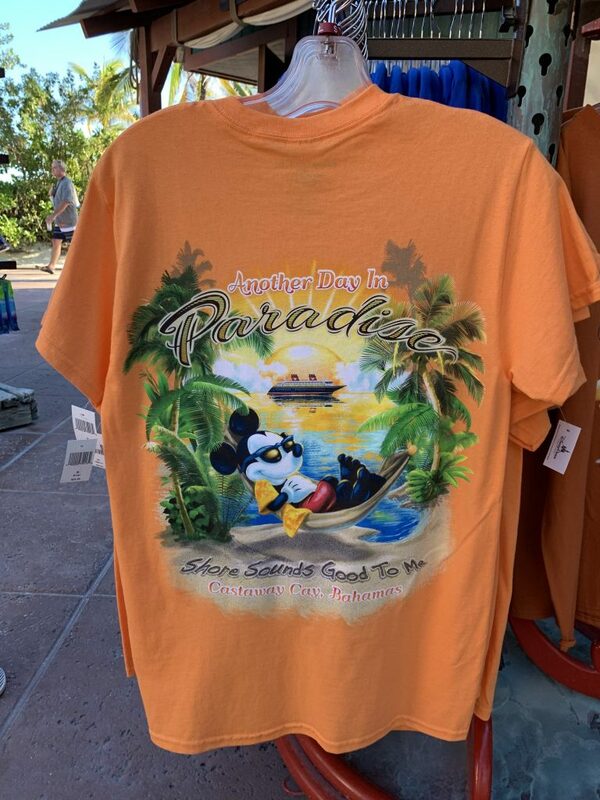 It’s really interesting to see what a small portion of the island has been commercialized and what the island looked like prior to it being made guest ready. Bike rentals are $13 per person and available in all sizes. We also love to snorkel and see the “shipwreck” and sea life creatures in the ocean. 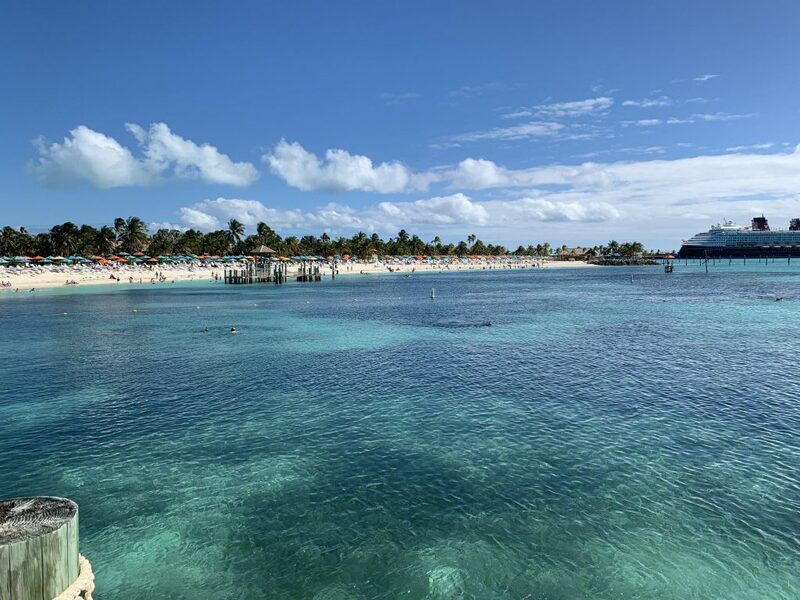 You can bring your own snorkel gear to avoid the rental expense (we do) or rent while you’re there. 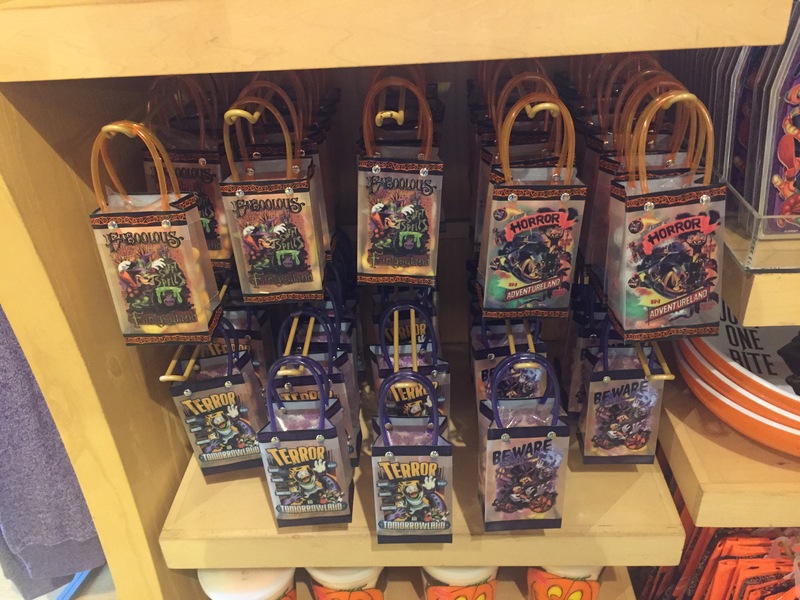 Life vests and snorkel vests are available for free to all guests and should be used! 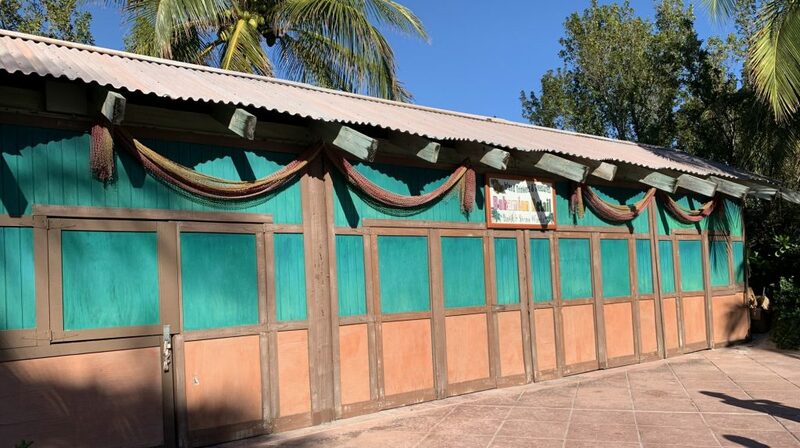 In addition to shore excursions, you can also rent a Cabana for the day. 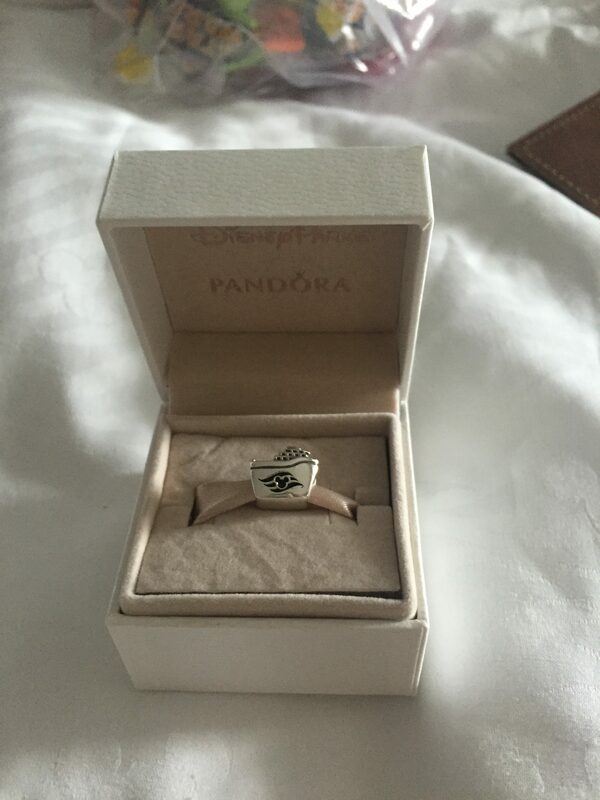 You’ll need to be staying concierge level to secure this very popular option as they sell out quickly. 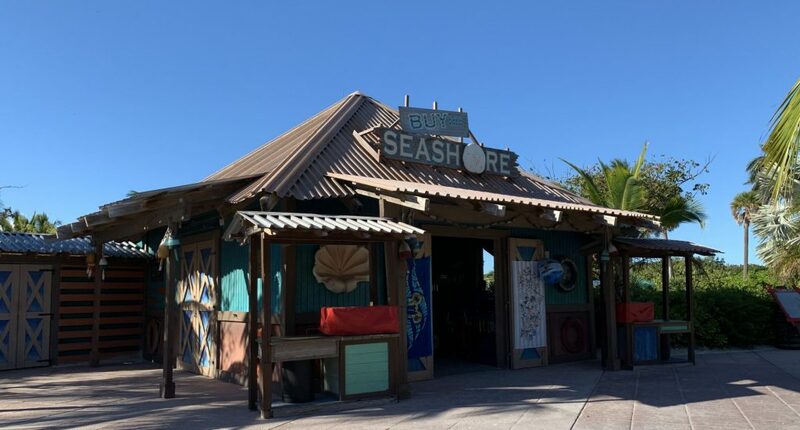 And of course, there are all the beach drinks you desire… for a cost! 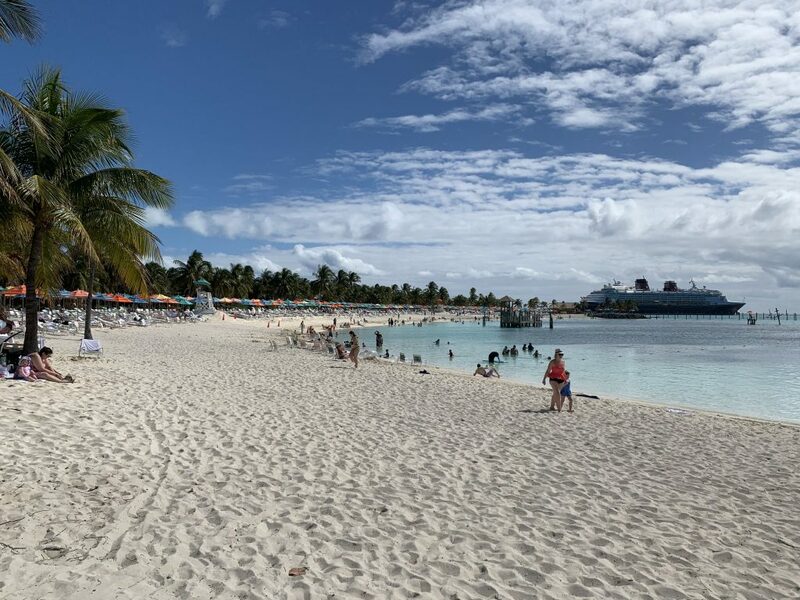 Castaway Cay is a pretty large island to explore and while many parts of it are walkable there are some distances that would not be so fun to carry your beach gear too! You can use the on-island tram to get around the island. You will need to walk a pretty good distance from the ship to the first tram stop so keep that in mind when planning your day. There are a total of four tram stops servicing the island. Kargo Handling Tram Stop is the stop closest to the ship. 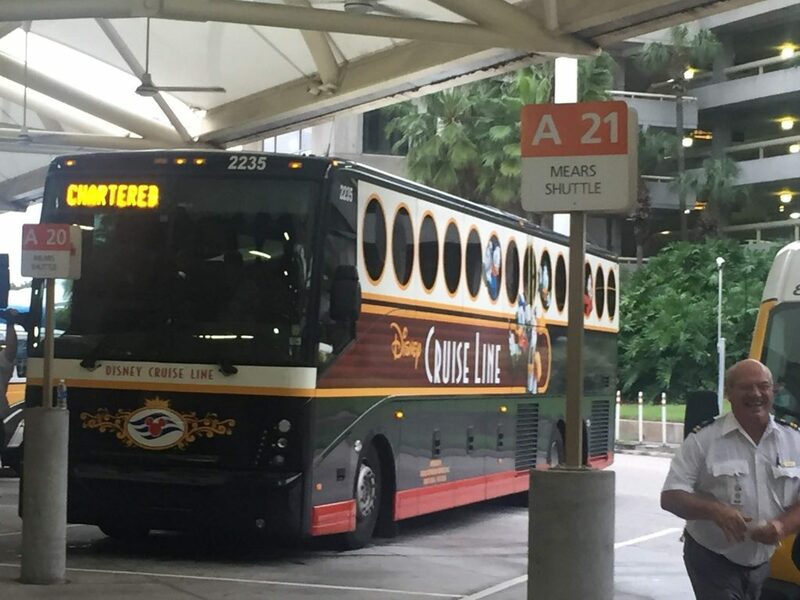 From there you are able to hitch a ride to Scuttle’s Cove Tram Stop that gets you near the Boating Harbor. Personally, I would walk this distance. I think you will spend more time waiting for the tram. 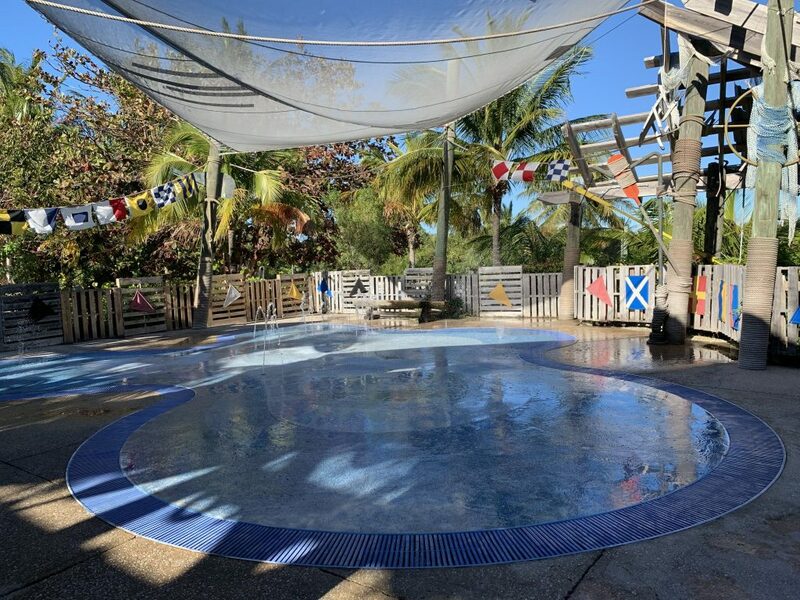 The next stop on the route is the Pelican Point Tram Stop that gets you close to the two family beaches that include the Snorkel Lagoon and Pelican Plunge Water Slide. 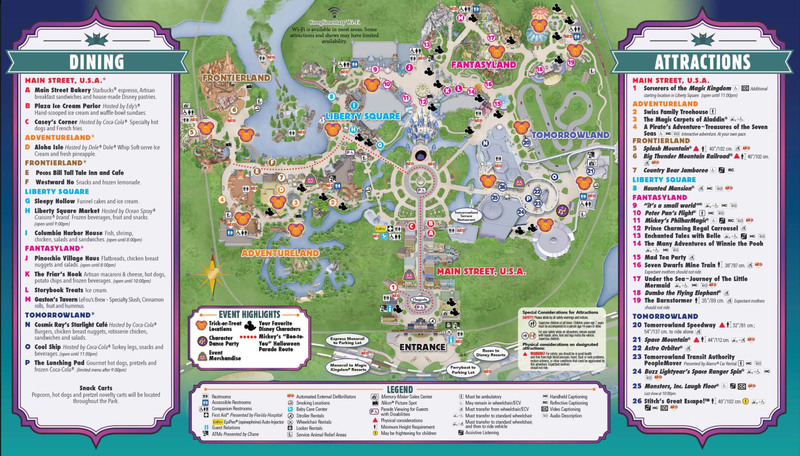 I would also walk to this area but can see how some guests with small children or limited abilities to walk long distances would prefer a tram. The fourth and final stop is the Serenity Bay Tram Stop. 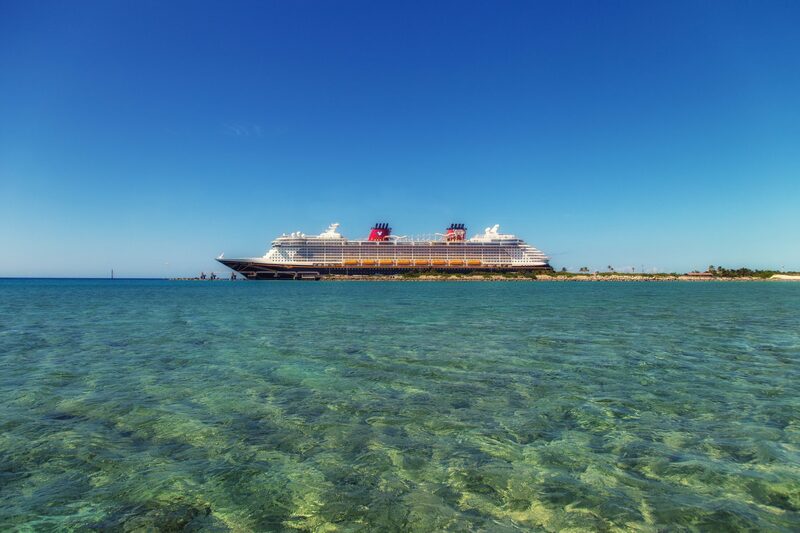 While this is walkable and on the Castaway Cay 5k route, it is a good distance away from the ship. 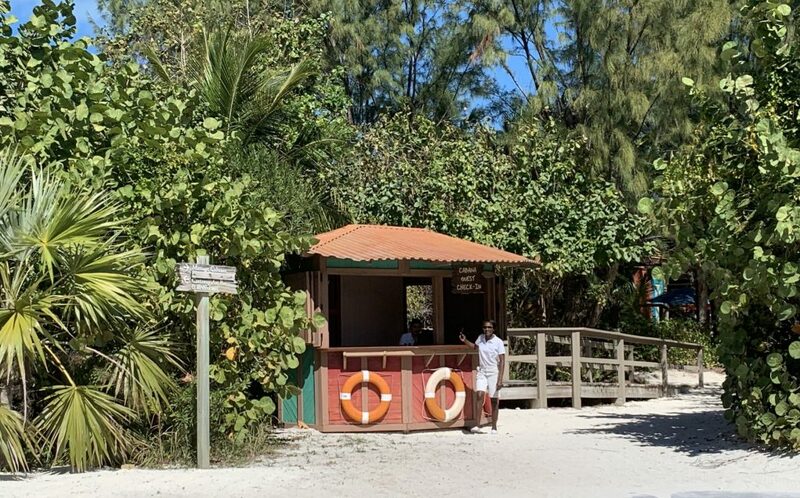 This is the stop that delivers guests to the adults only area, Serenity Bay. It’s at the end of the island runway and the area is not shaded. I think it’s best to take a tram here unless you really enjoy the journey! Post Office – Mail your postcards home from here! 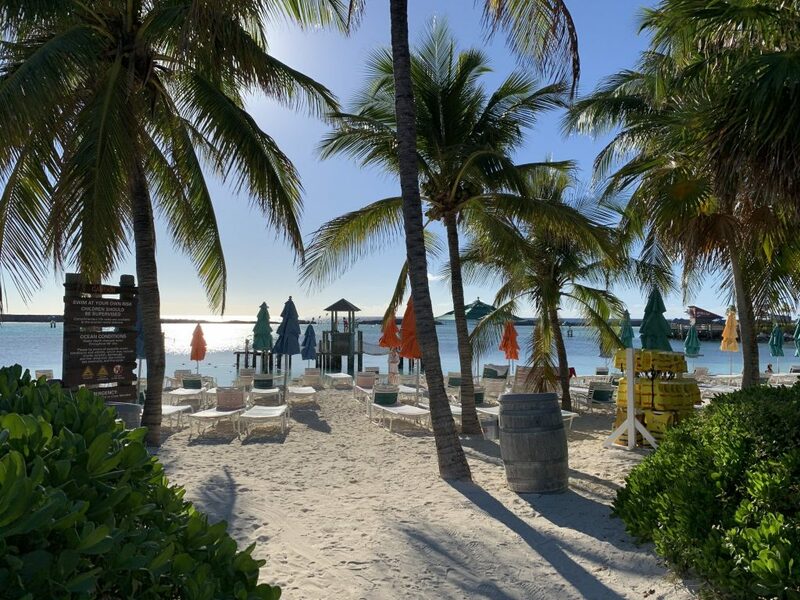 Gigi’s Fins and Boats – This is where you’ll rent your snorkel, fins, tubes, and floats for your day at the family beaches and Snorkel Lagoon. You can bring along your own snorkel and fins to save money but this is a very convenient option! 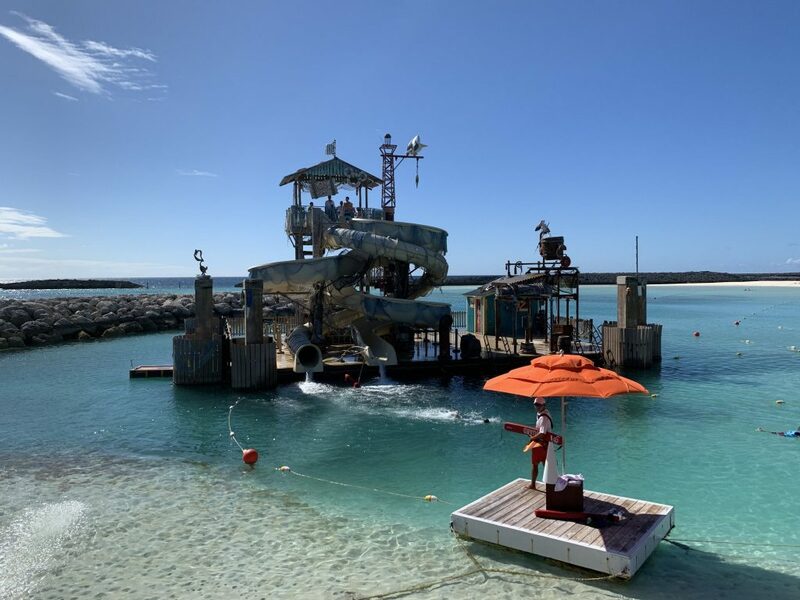 Snorkeling Lagoon – This is one of my favorite areas at Castaway Cay and is so much fun to explore! 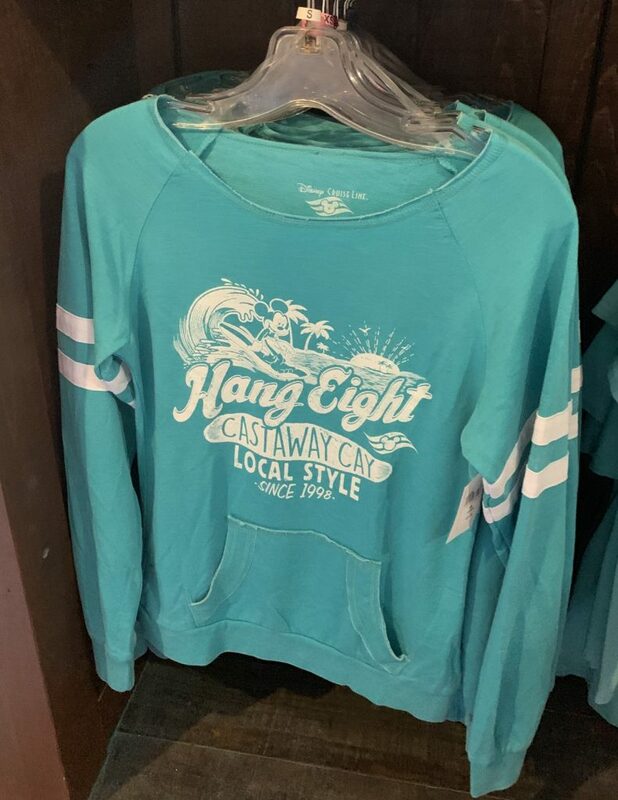 However, it’s not for the lazy beachgoer! 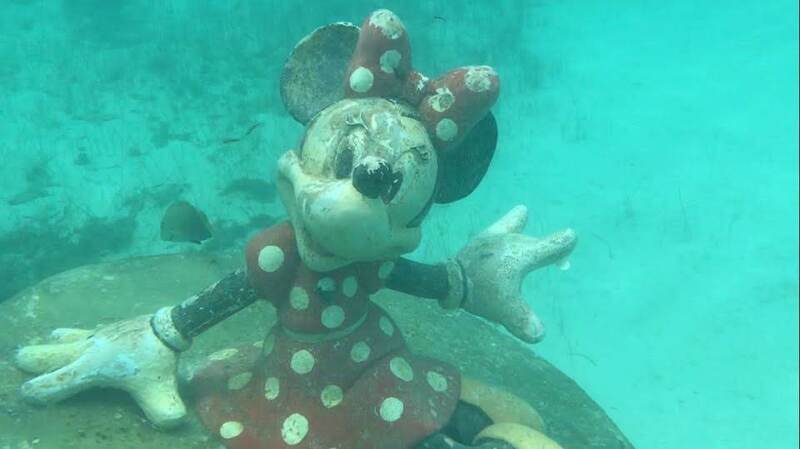 It requires quite a bit of swimming to see all of the sites there are to see including a sunken ship with a statue of Mickey and Minnie (separate from each other) and a submarine. Each of these is marked by buoys in the water so you at least know where to look! As we were swimming around we talked to other snorkelers and all shared where we were seeing different things. I mean if I was going to swim that far I was seeing it ALL! Snorkeling vests are provided at no cost and should be used. There are lifeguards in the area but you really should wear a snorkel vest no matter how great of a swimmer you are! Snorkles and fins can be rented from Gigi’s Fins and Boats or Flippers and Floats for a charge or you can bring your own. 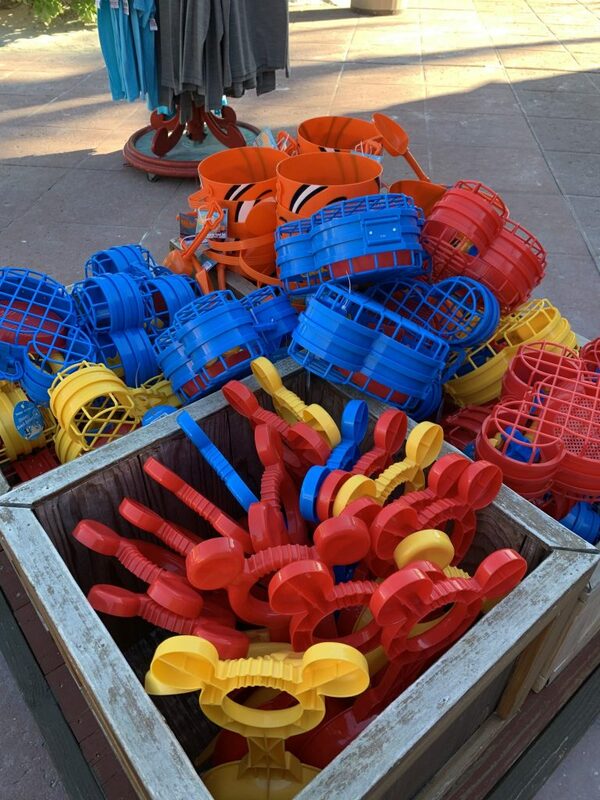 In-Da-Shade Games – Here you’ll find your typical outdoor beach games! Basketball, billiards, ping pong and more! Beach Sports – This area is near the In-Da-Shade games but out of the shade! Here you can play tetherball, volleyball, and soccer in the sand. 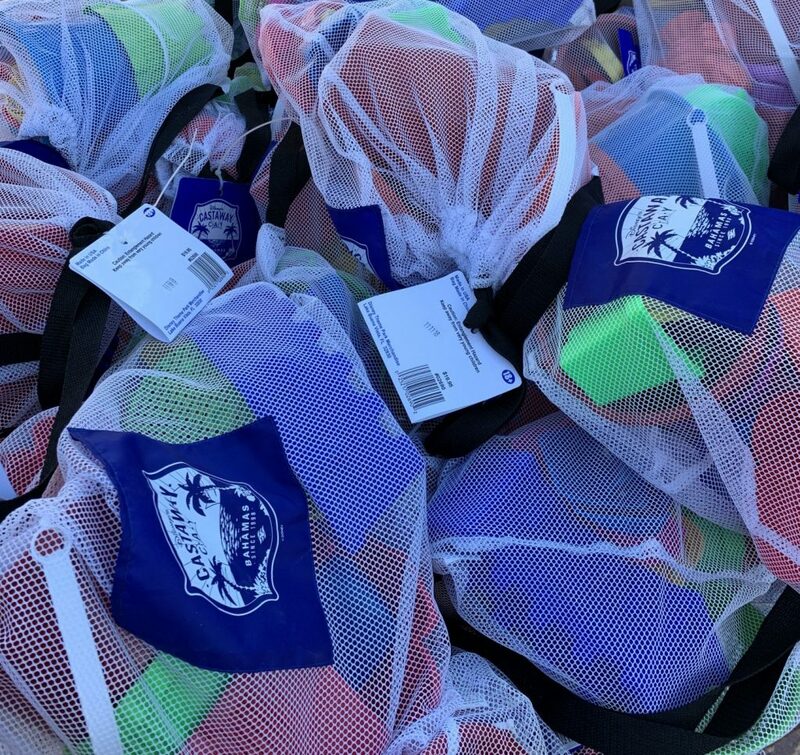 Pelican Plunge – A favorite among kids and parents! This amazing waterslide is so much fun but you’ll have to swim or float to it! 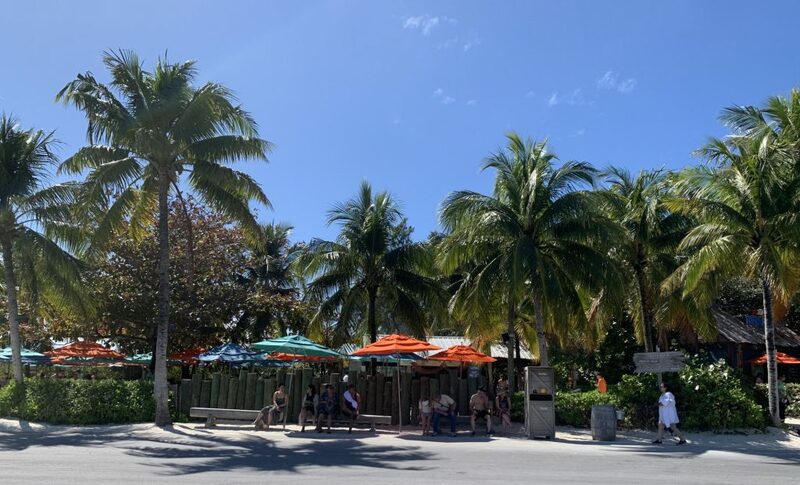 Bike Rentals – This is one of my favorite things on the island! Rent a bike for just $13 per person and explore the island! 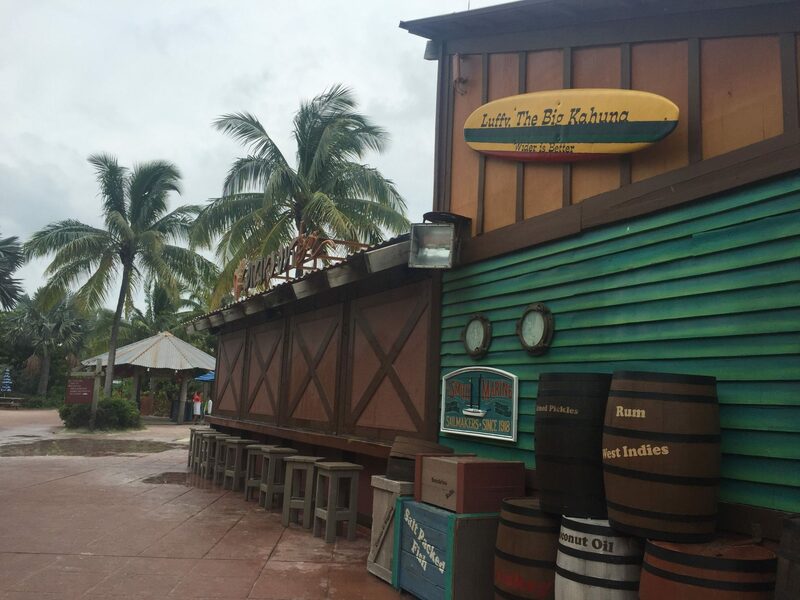 You’ll ride the same route used for the Castaway Cay and be able to stop along the path and climb the lookout tower. 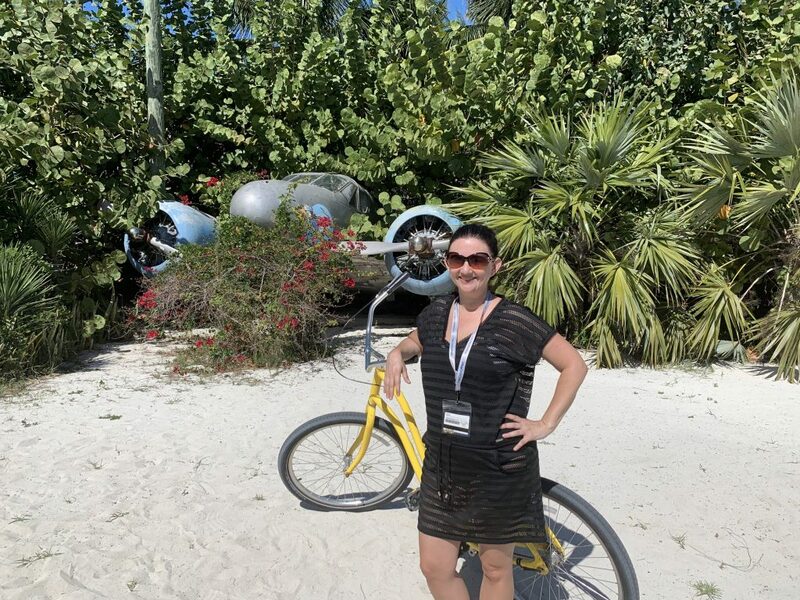 We also used our bikes to explore the area behind the Cabana’s so we could see just what it would be like to live the Cabana life! 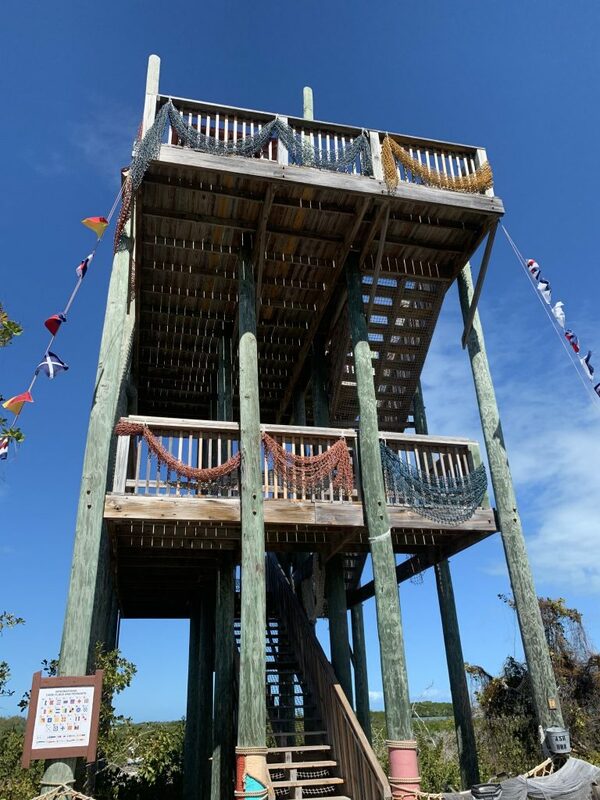 Observation Tower – This is worth exploring! Climb the few flights of stairs to see across the island! You’ll be surprised by how much of the island has gone untouched! The view also provides a gorgeous look back to the ship! 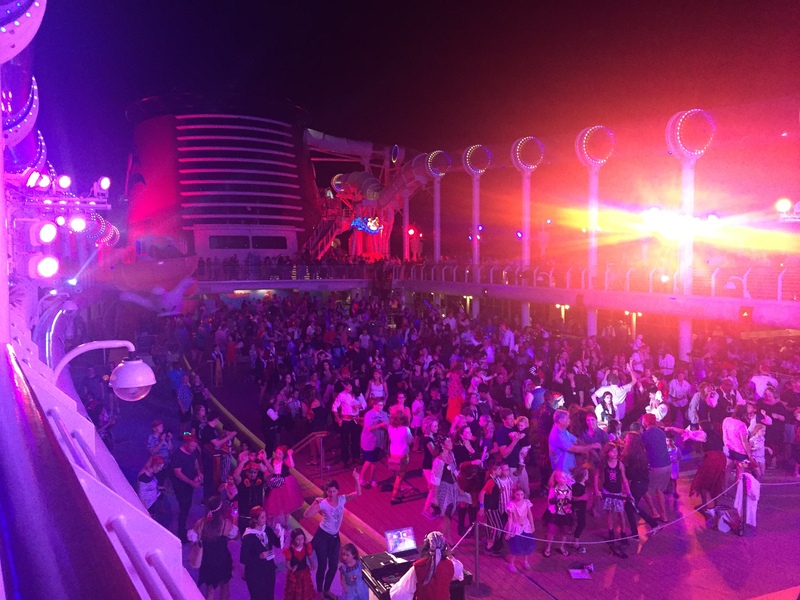 Character Dance Party – Join your favorite characters for live music and a dance party on the island. 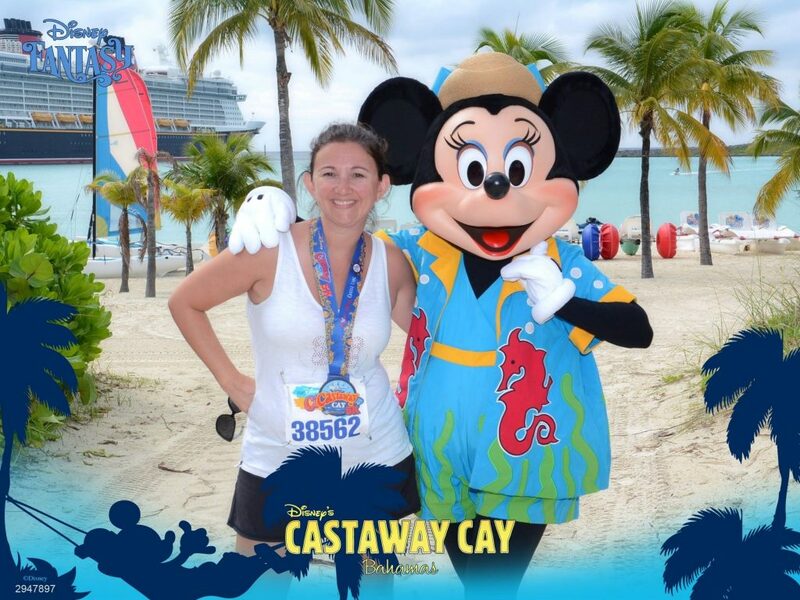 I love the Castaway Cay 5k! There are a couple of great perks for participating in this! First and foremost it’s FREE! 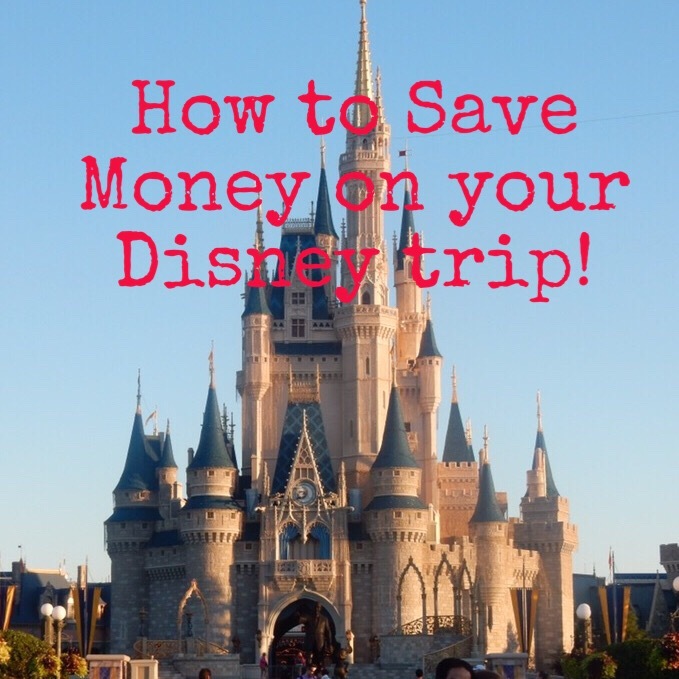 If you’ve ever participated in a RunDisney event you know they can be pretty expensive! 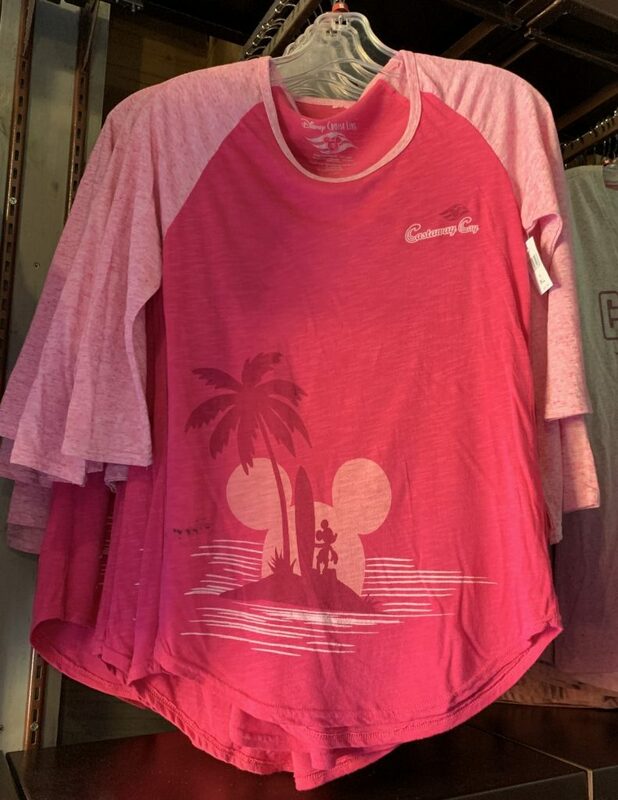 In fact, a RunDisney 5K typically runs around $100 per person! 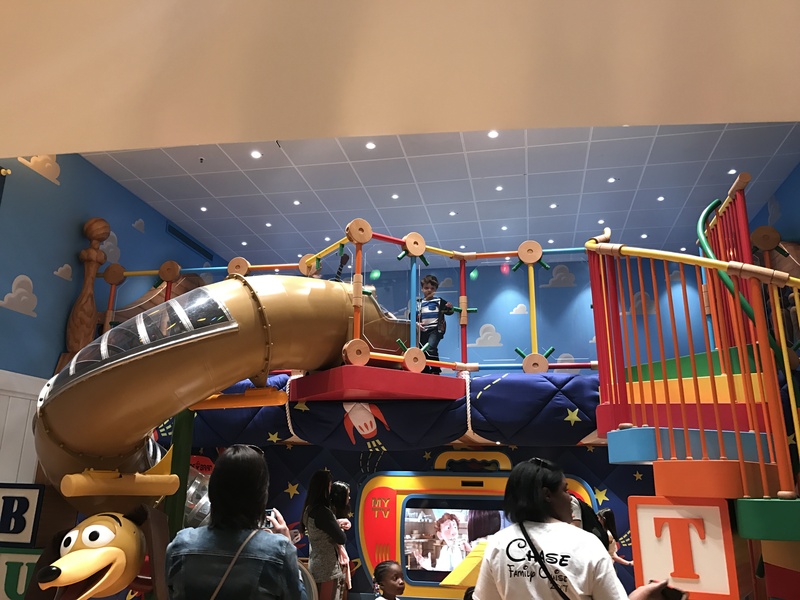 The second part that is so great is that you are the first passengers off the ship! 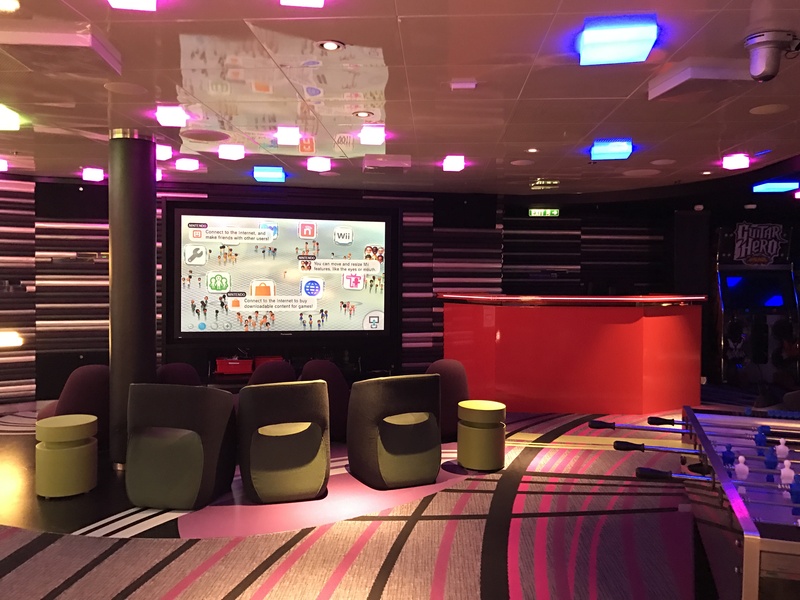 To sign up you will need to visit the Port Adventures Desk or Guest Services Desk once you are onboard the ship. 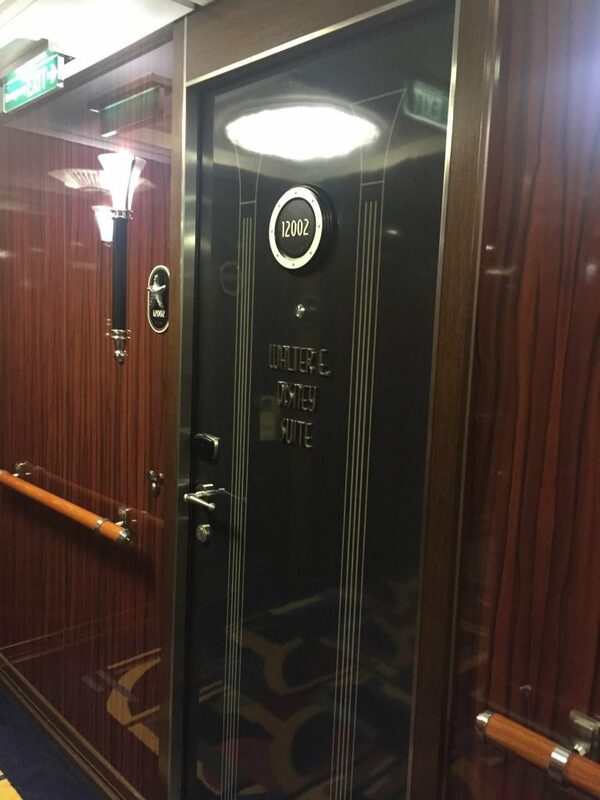 You are not able to sign up online prior to getting on the ship. 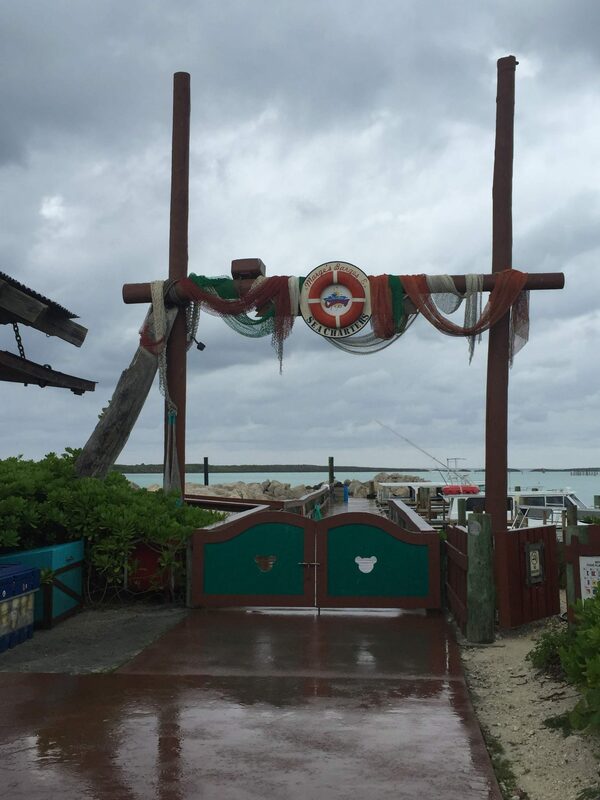 Make sure that you sign up prior to your day on Castaway Cay. Guests trying to sign up the morning of the event may not be accommodated. 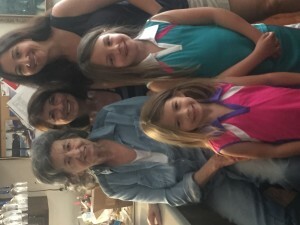 All guests must be 10 years or older to participate. 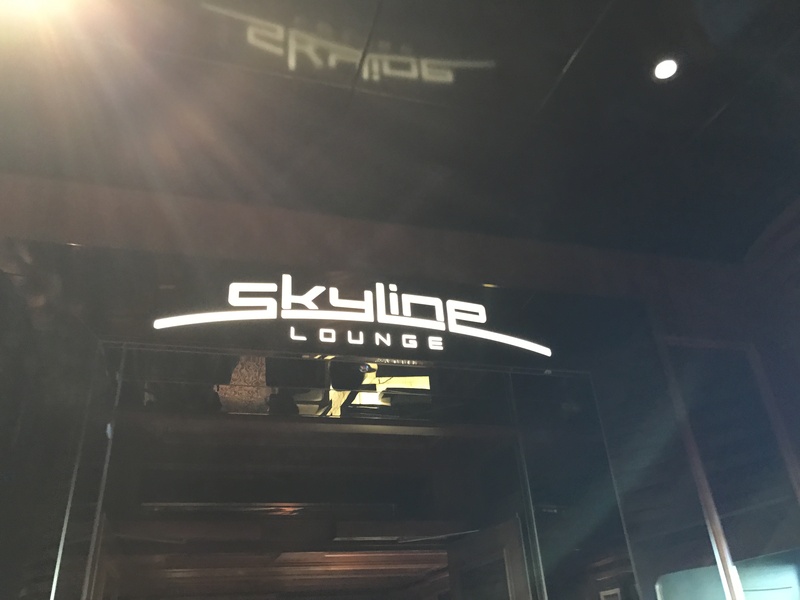 On the morning of the event, you will check in at the Azure lounge at 8 am. Double check your sailings Personal Navigator to be sure the meeting location and time have not changed. 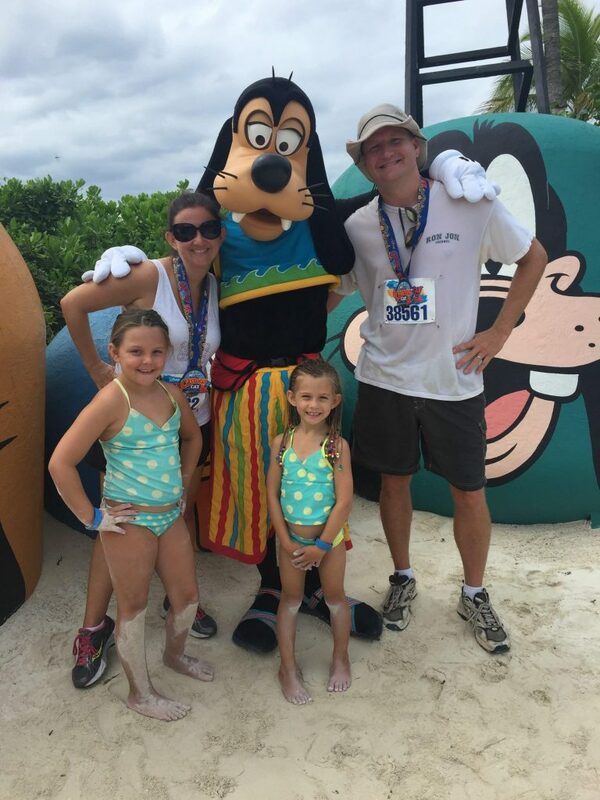 What do I do with my kids while I run the Castaway Cay 5k? Scuttles Cove, the on-island kids club will be open to keeping kids that are not participating in the 5k. This is the easiest way to participate in the 5k and then go straight to your next on island activity. Scuttles Cove is open for the duration of the island day and is for kids ages 3-12 years old. Kids ages 11-14 are invited to the “Teen Hideout” on the island. The Edge Teen Club will meet there for the day. 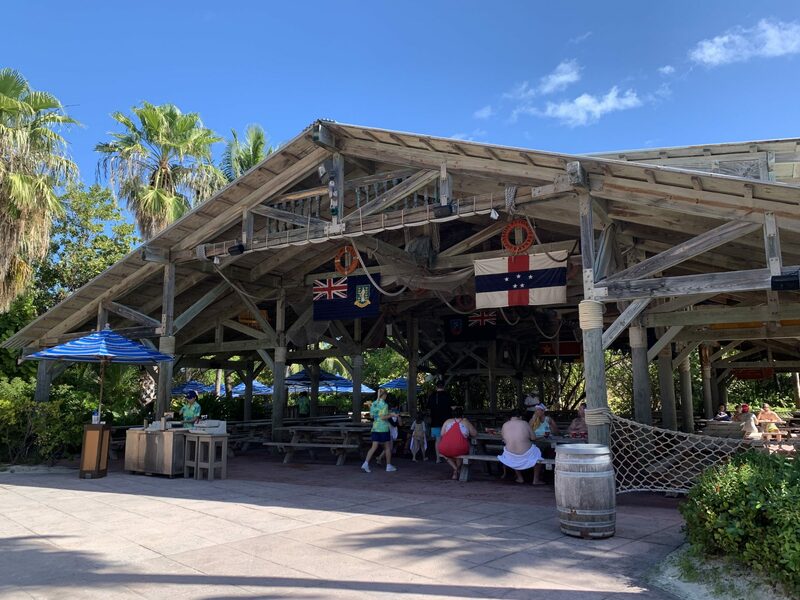 The on-ship kid’s clubs, Oceaneer Lab, Oceaneer Club, are also available on port days including your day at Castaway Cay. This is an option for the morning of the 5k however it would be a lot of extra walking and work to get back on the ship to pick up the kids only to return back to the island. The easiest way is Scuttles Cove! Scuttles Cove is the on-island kids club for kids ages 3 -12. The club offers water activities and other entertainment. 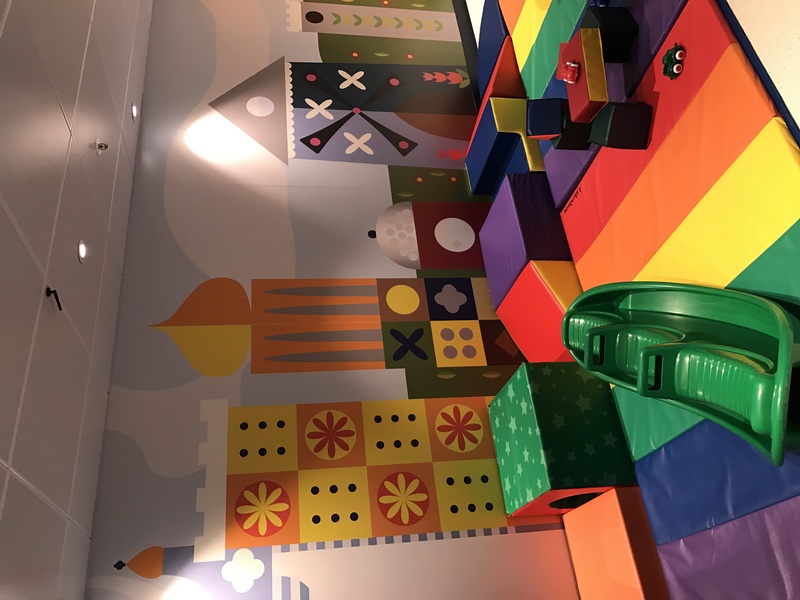 My kids really enjoyed the kids only area. 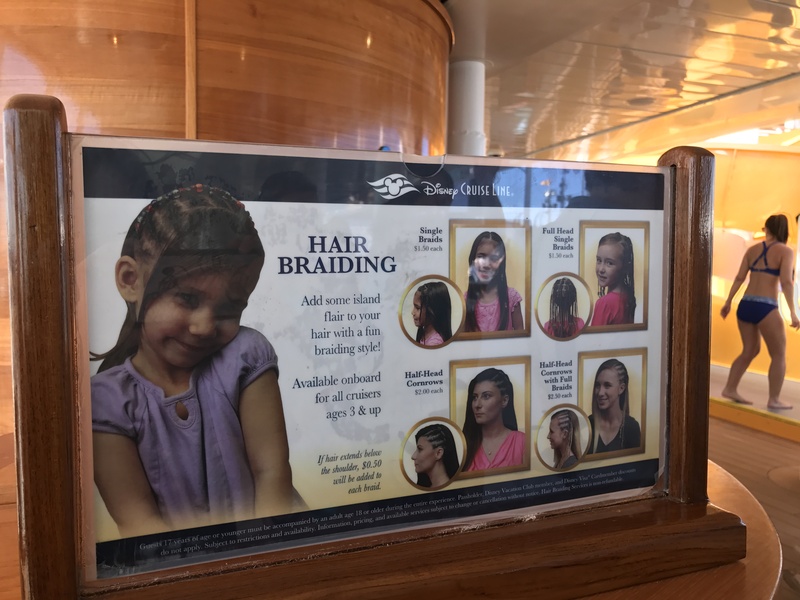 You don’t need reservations but your kids do need to have been previously registered with the kid’s clubs on the ship. 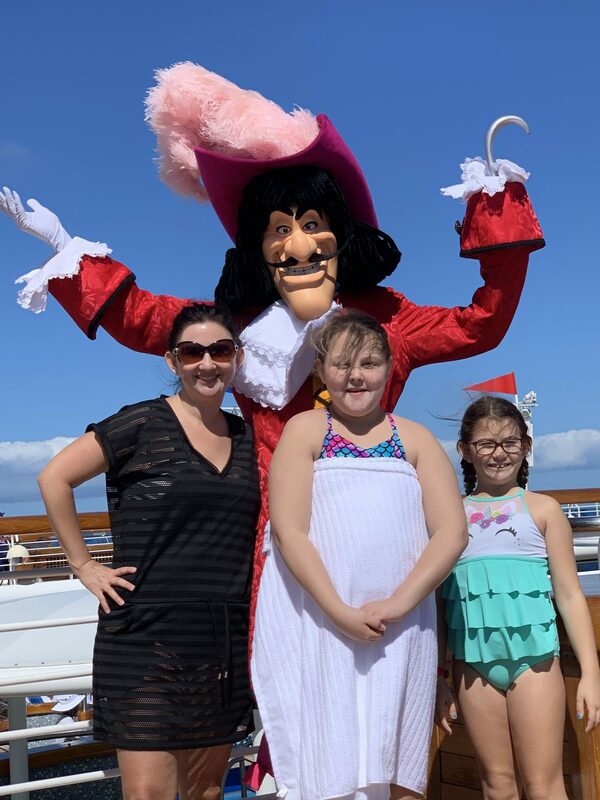 Meeting your favorite characters on Castaway Cay is so much fun! They’re in their island attire and ready for a day of fun. 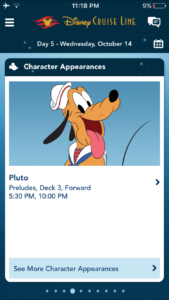 Check your personal navigator to see when and where to meet your favorite characters. You can also set reminders in the app that will pop up on your phone during the day to remind you when to go see your top picks! 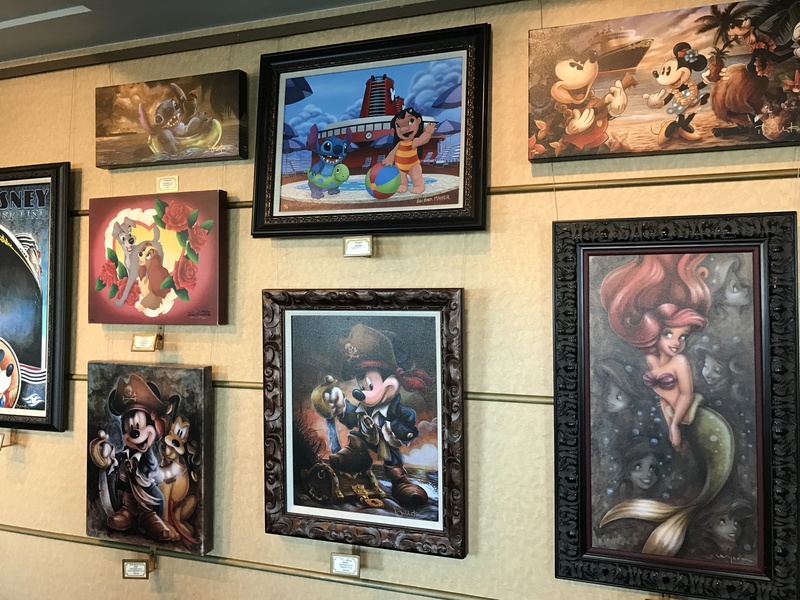 You can expect to see Jack Sparrow, Chip & Dale, Minnie, Goofy, Donald, Mickey, and Pluto. They typically meet two times a day on the island. Most of your port excursions can and should be pre-booked online on your online check-in day. 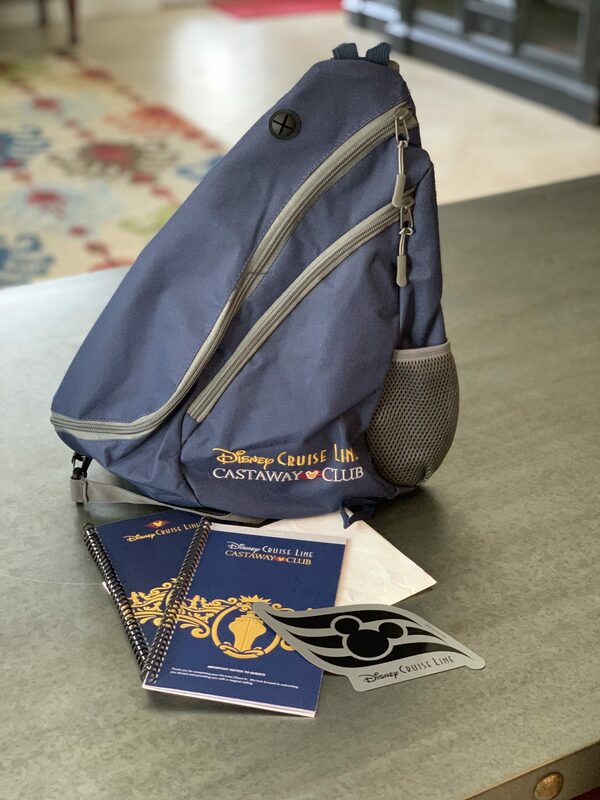 Your online check-in day will depend on how many times you’ve sailed with Disney and if you are staying concierge level. The easiest way to know your online check-in day is by knowing your final payment day. Pay a day in advance to be able to book your excursions without delays on check-in day. 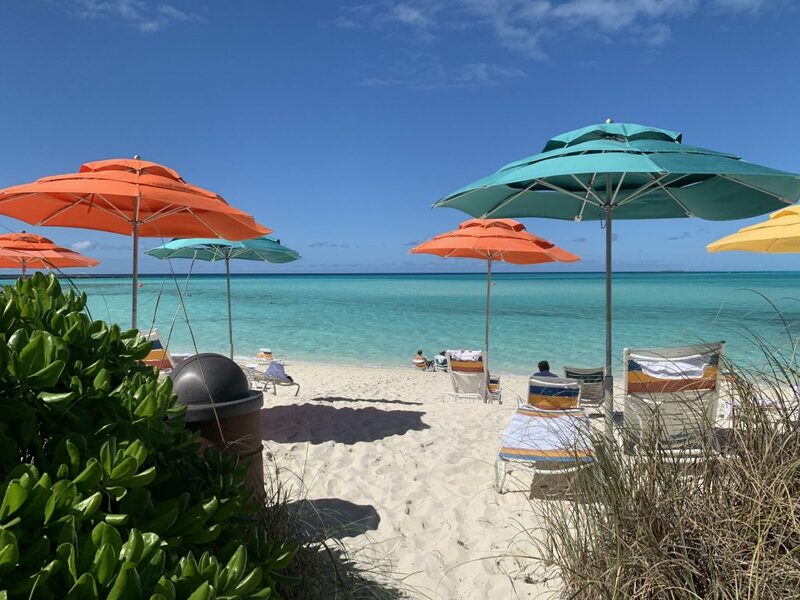 Once you’ve entered all of the information for online check-in you will have access to book excursions for not only Castaway Cay day but also all other days. 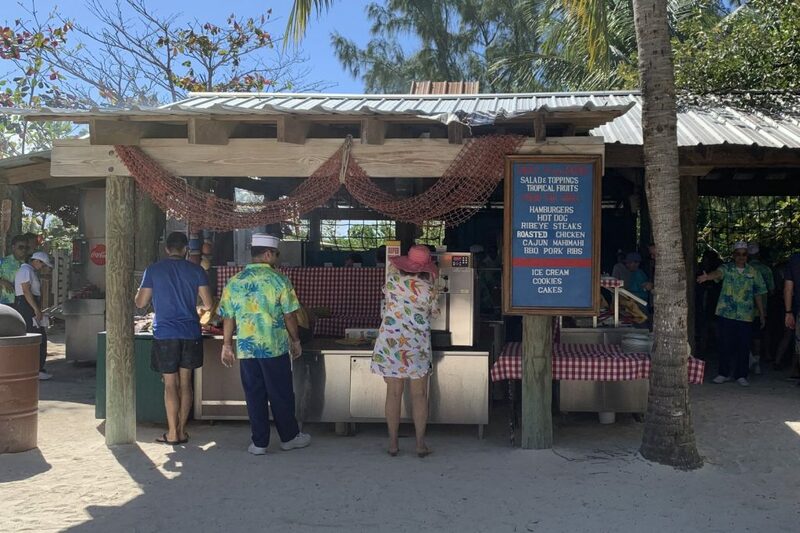 Most excursions won’t fill immediately but things like Cabana’s on Castaway Cay will be filled long before the general sailing guests have access to book them. 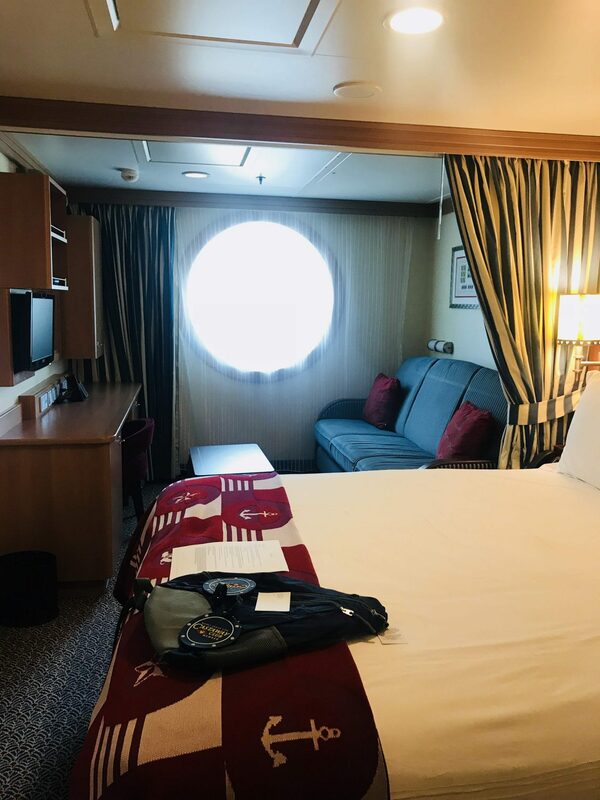 Once you are on the ship you can also visit the Port Adventures Desk to book anything that is still available or make changes to your existing reservations. 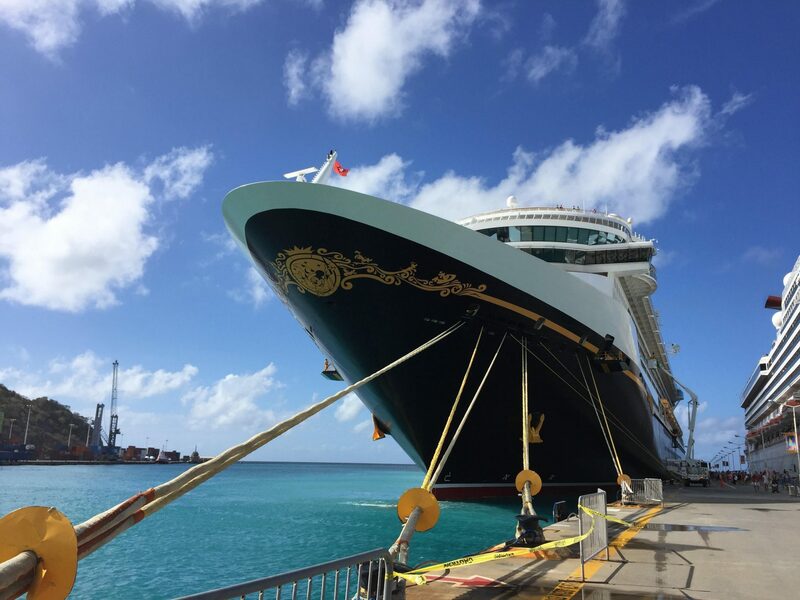 For a complete list of excursions on your sailing make sure you check the Disney Cruise Line website. Marges Bares & Sea Charters Dock – Parasailing, fishing charters and more depart from here. Boat Beach – watercraft and ski adventure meeting location. 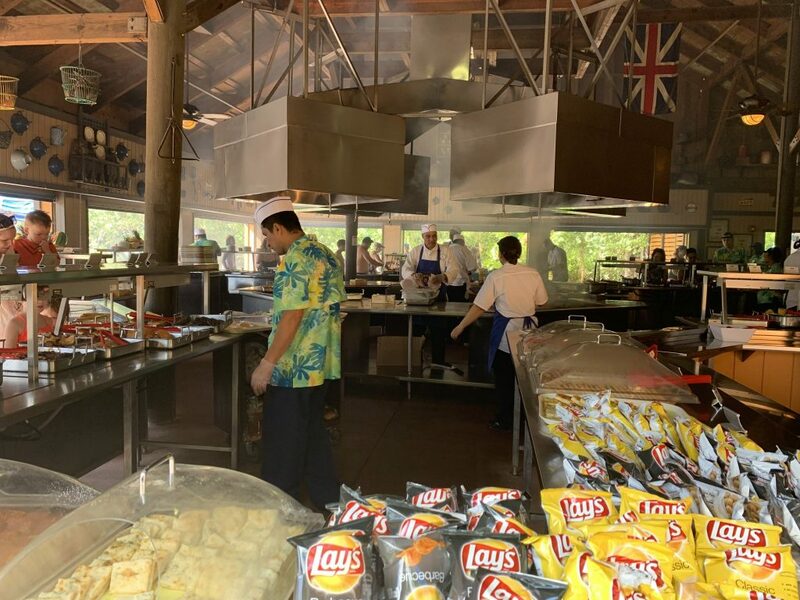 A BBQ lunch is provided as part of your cruise fare on Castaway Cay. 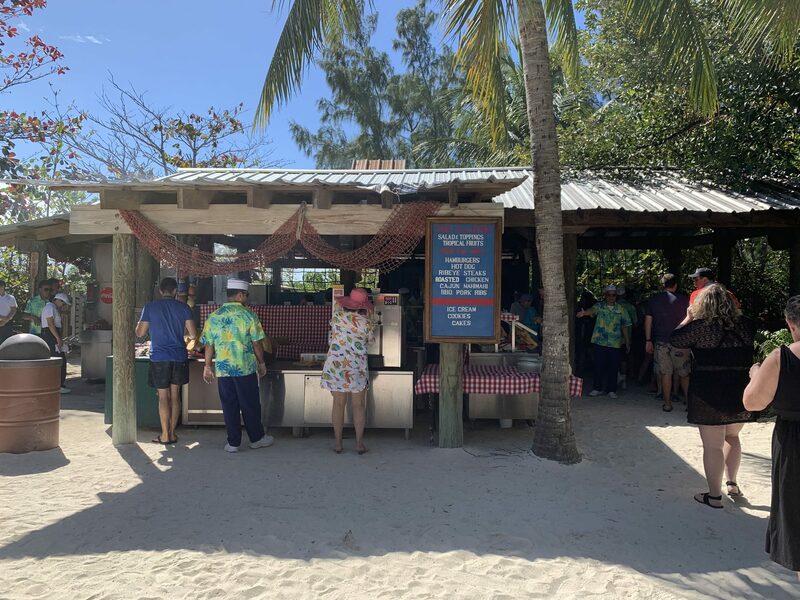 It’s served from 11:30 am to 2 pm on the island. 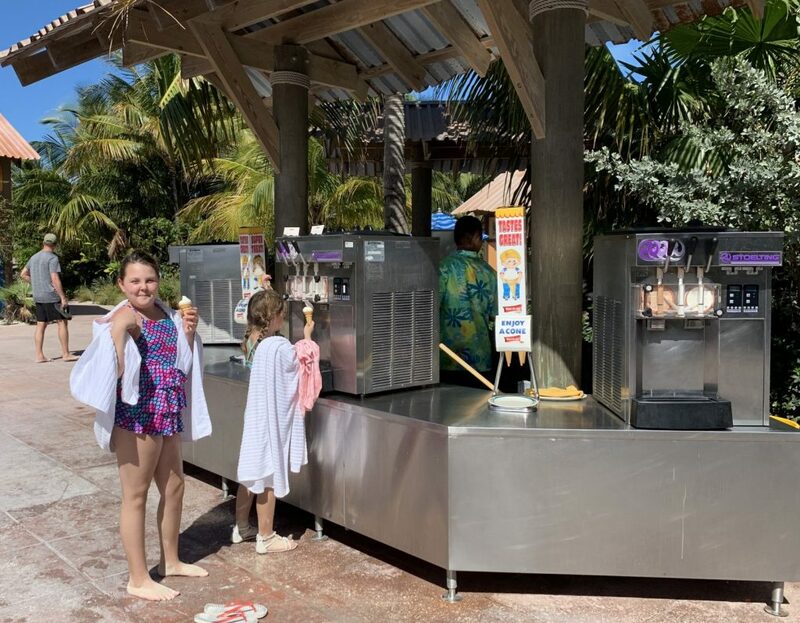 The self serve ice cream and drink station is open near Cookies for most of the day. 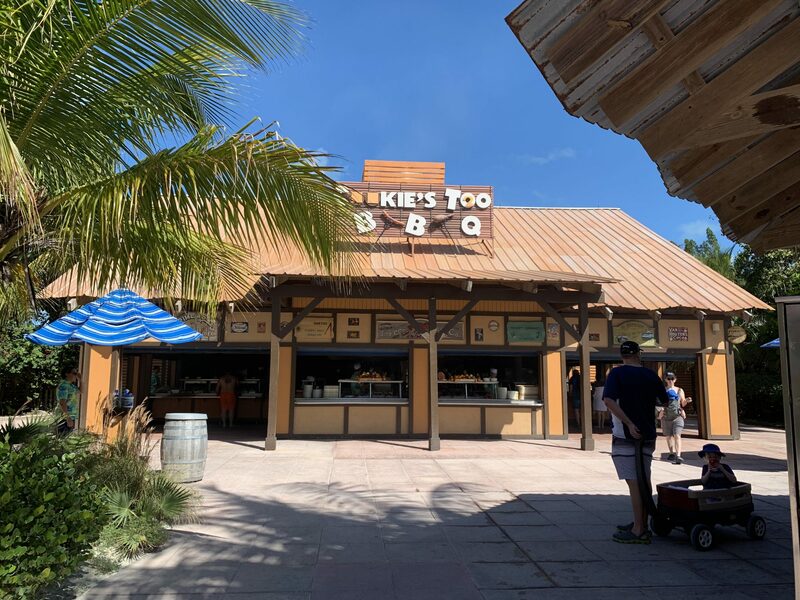 There are three locations on the island to eat it but they all serve the same thing. 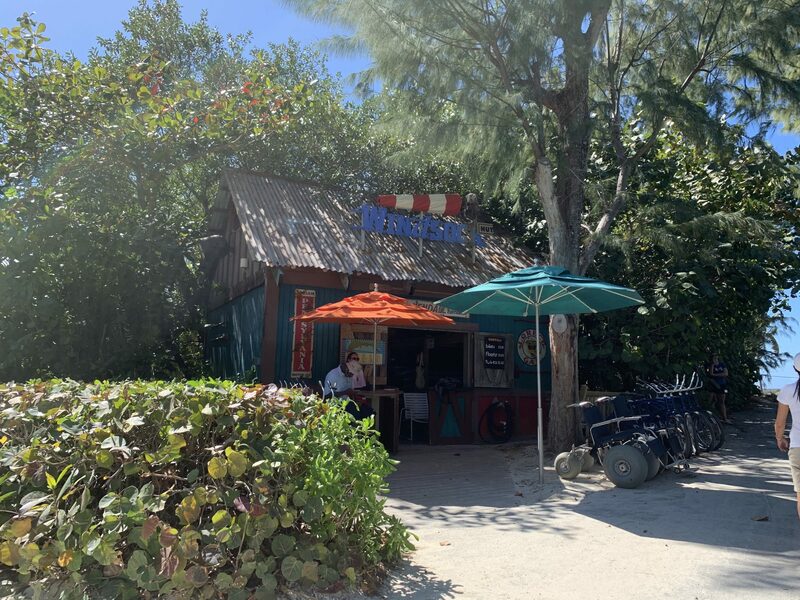 Having three locations is all about the laid back island life and not having to go far to get anything you need! Near each dining area, there are also covered seating areas with picnic tables. 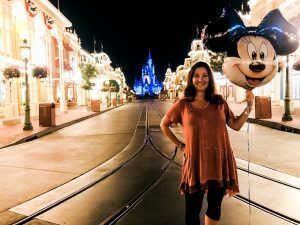 You’ll never have to walk far or wait long for a table which is so nice compared to days at Disney parks! 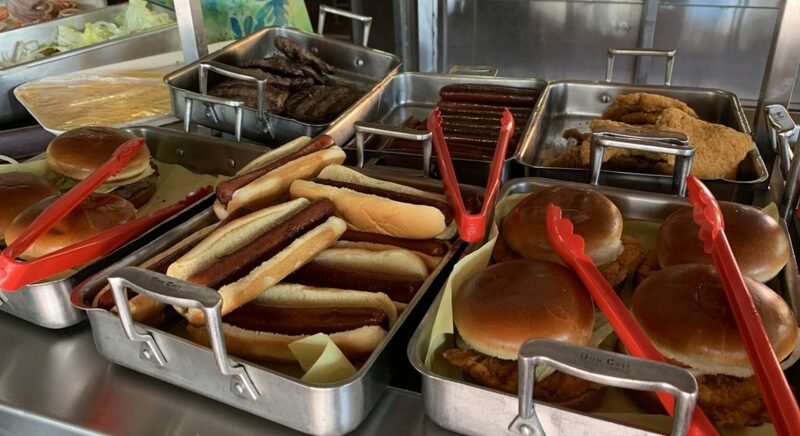 There are many gluten-free options at the BBQ buffet. They are not all clearly marked so you will need to ask the crew members. I was able to have all of the meat options and some sides. 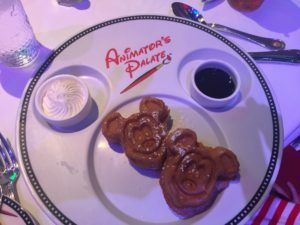 It’s definitely not my favorite meal while cruising with Disney but it works and is safe! 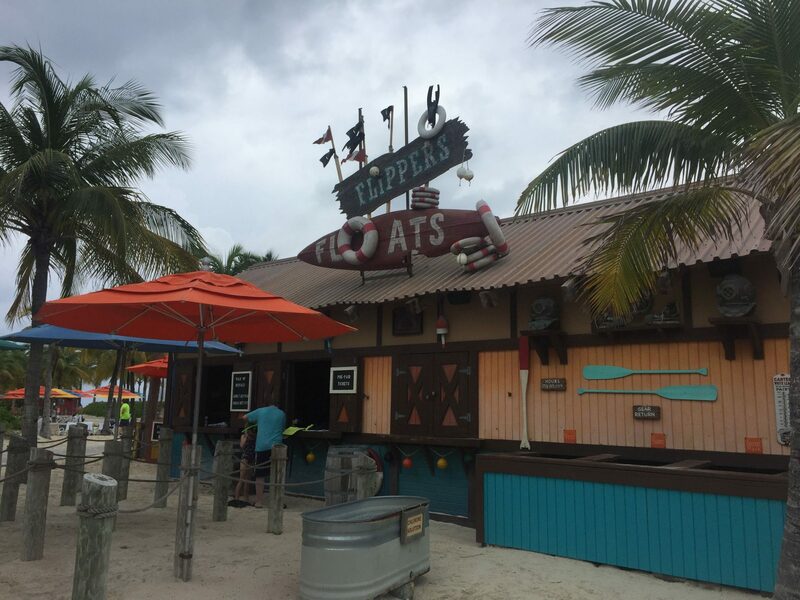 The bars on Castaway Cay serve the same bar drinks you’ve surely grown to love on the ship! 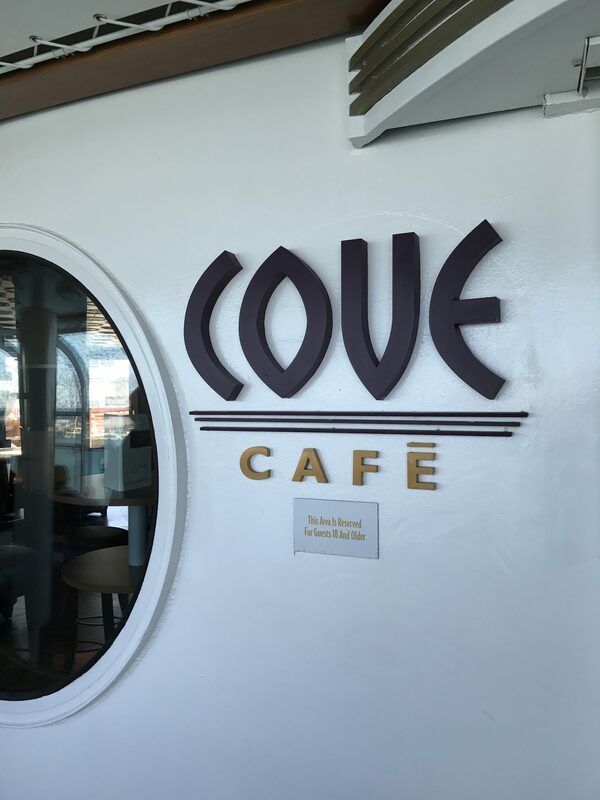 They all serve the same things but are located across the island for easy access. 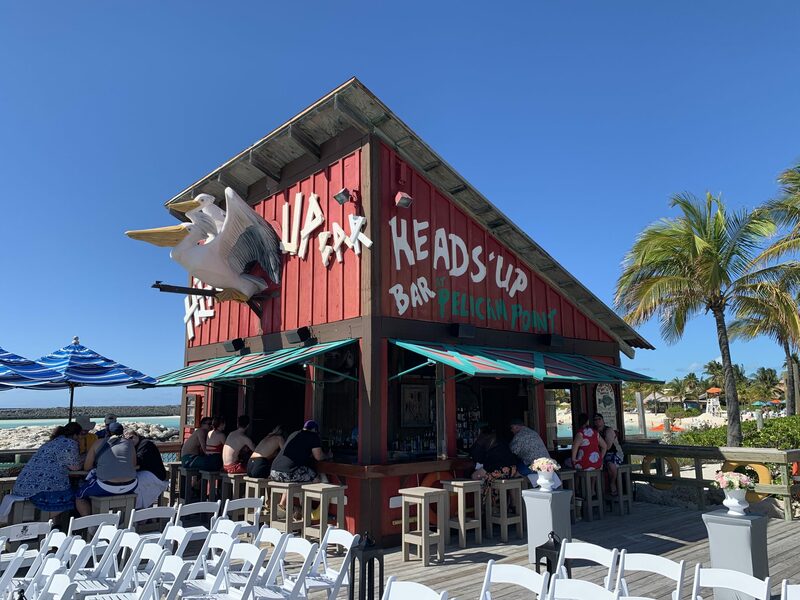 Besides seeing all of the different views and experiencing all the fun the island has to offer there’s no need to bar hop to try it all! My favorite frozen beach drink is always a Pina Colva! 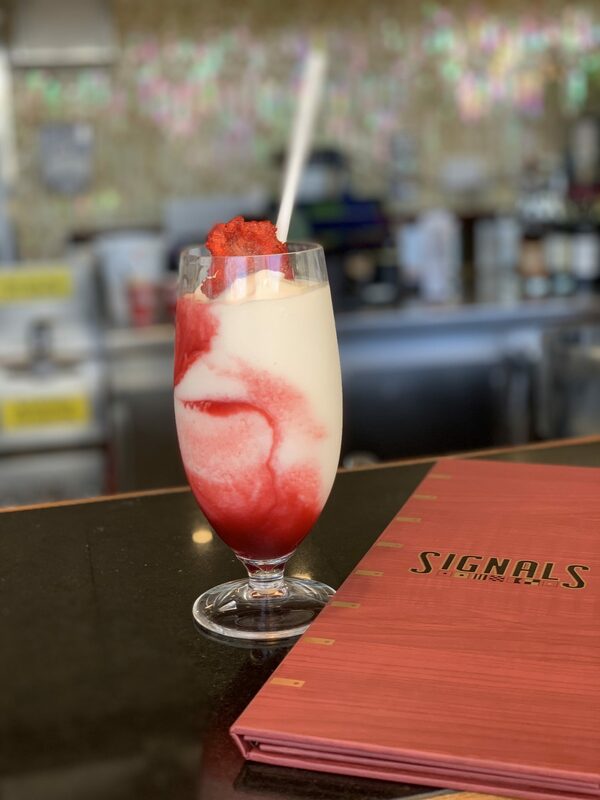 This is a pina colada and raspberry mix that is so good! 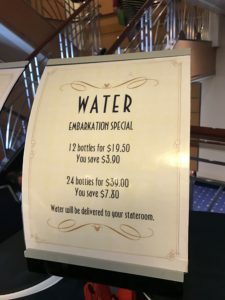 You can also get bottled water and beer at the bars! 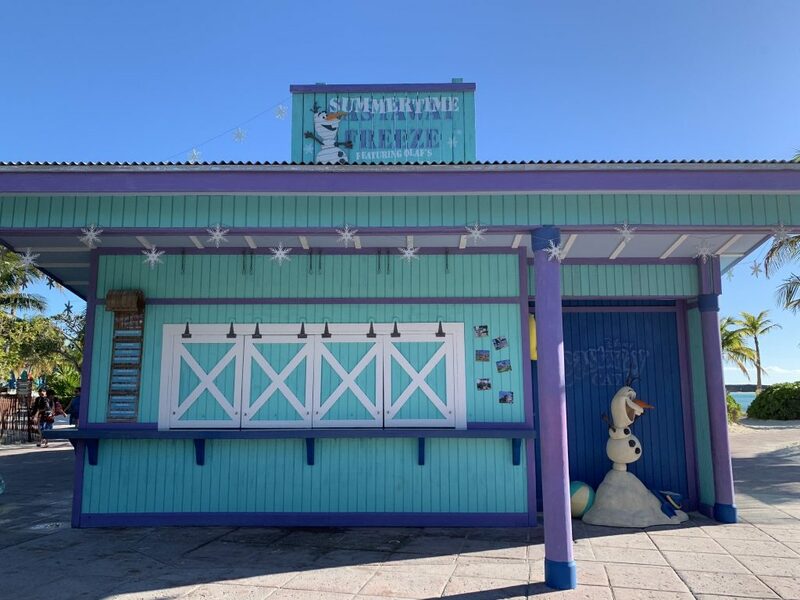 Castaway Air Bar– Frozen specialty drinks and beverages located near Serenity Bay, the adults only area of Castaway Cay. 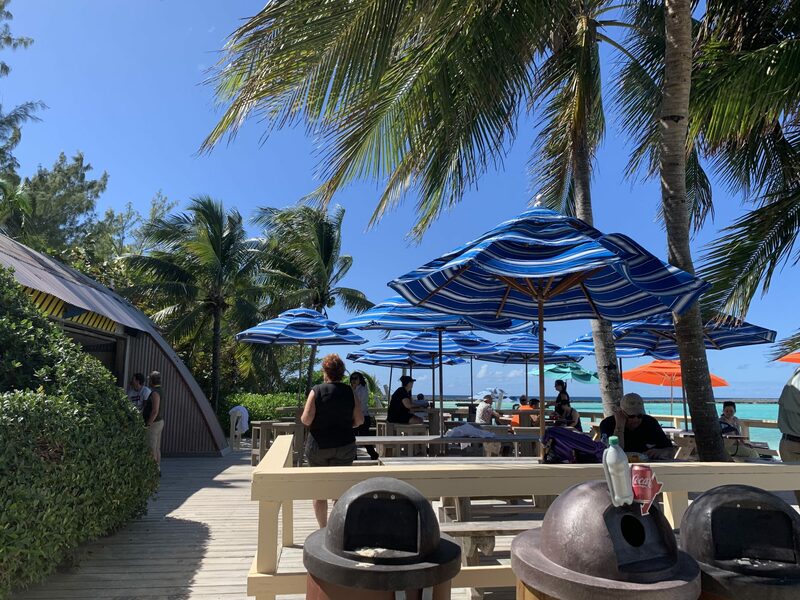 Conched Out Bar– Frozen Speciality drink, cocktails and beer located near the family beach area. 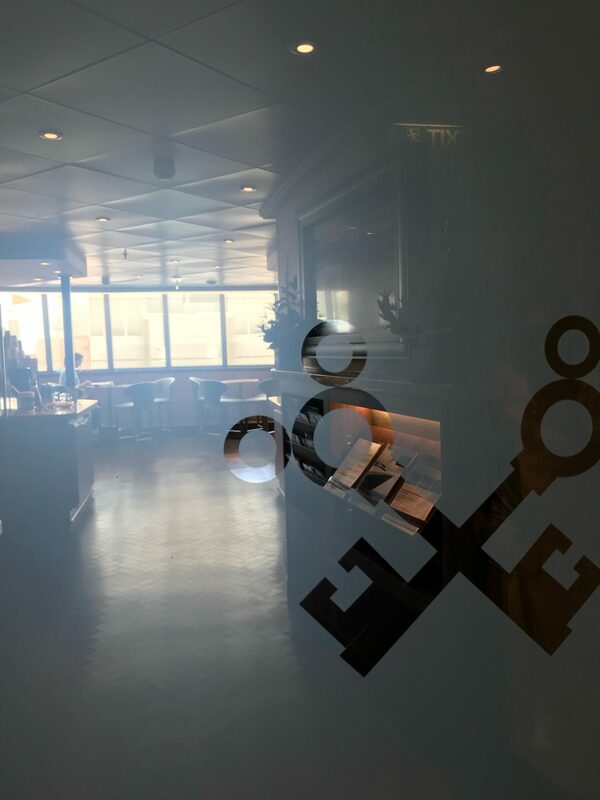 Heads Up Bar – Frozen Speciality Drinks, cocktails and beer. This is a fun spot that sits out on the peninsula between the snorkel area and Pelican’s Plunge water slide. 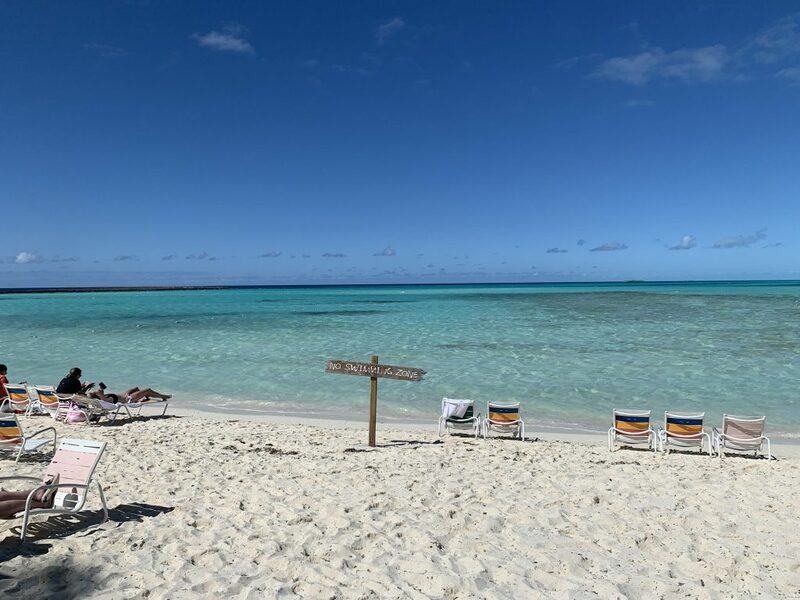 There are two large family beaches on Castaway Cay for you to enjoy. 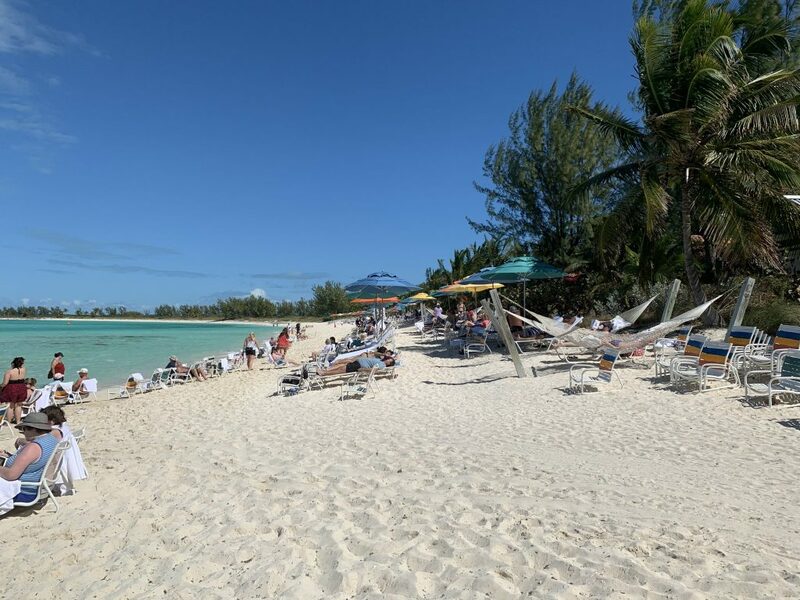 The other beaches are restricted to Cabana users or guests over the age of 18 but most areas are available for everyone to enjoy. 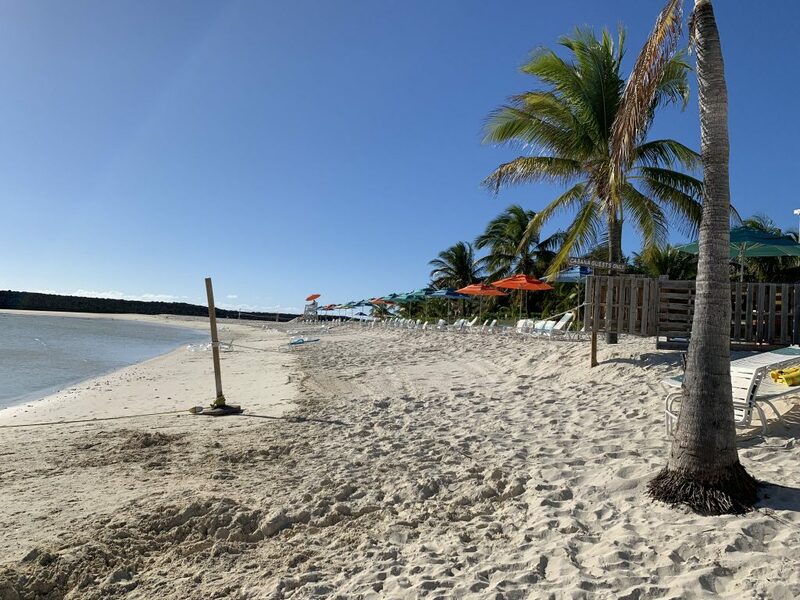 There is an additional beach area “Boat Beach” where small watercraft and paddleboats launch that is not available for swimming. 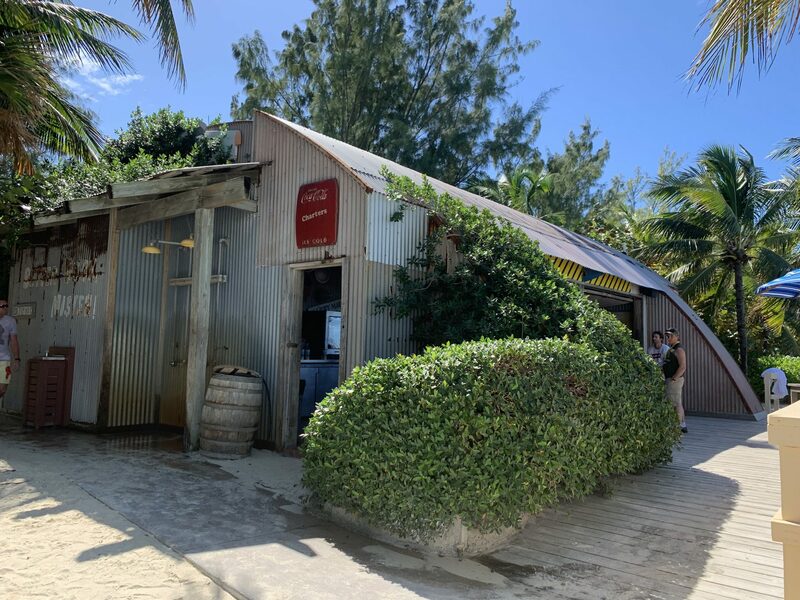 There are several small shops to visit while on the island including a Bahamian Retail area that houses Bahamian arts and crafts and other items specific to the area. 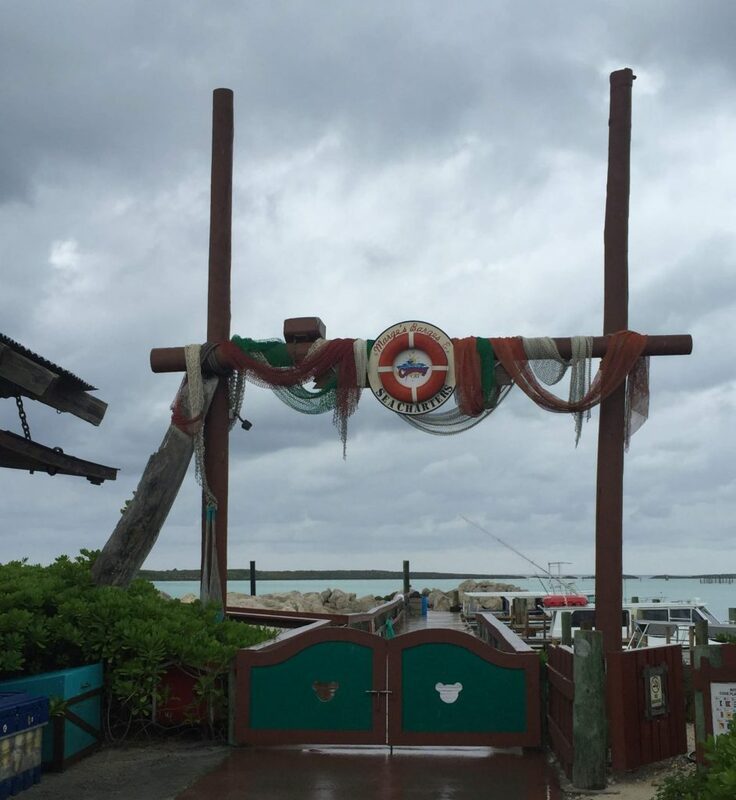 The islanders working here arrive on Castaway Cay each day on their own boats from nearby islands they call home. I think it’s so interesting to see what they have to offer and also support the locals. 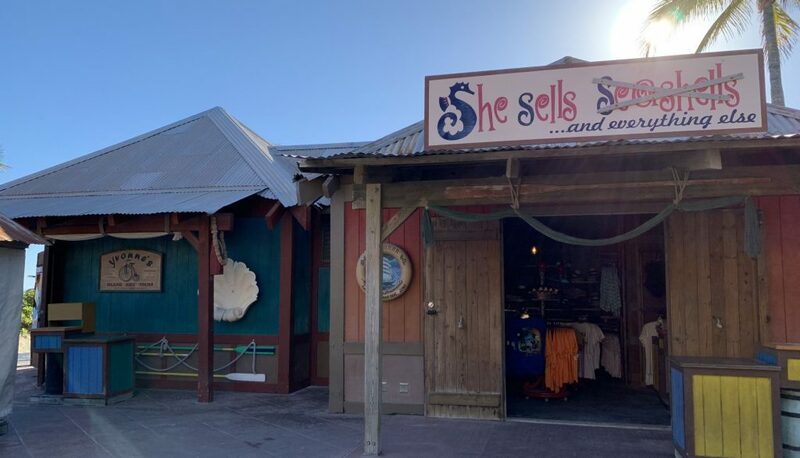 You will also find two Disney owned stores called She Sells Sea Shells and Everything Else and Buy the Seashore. 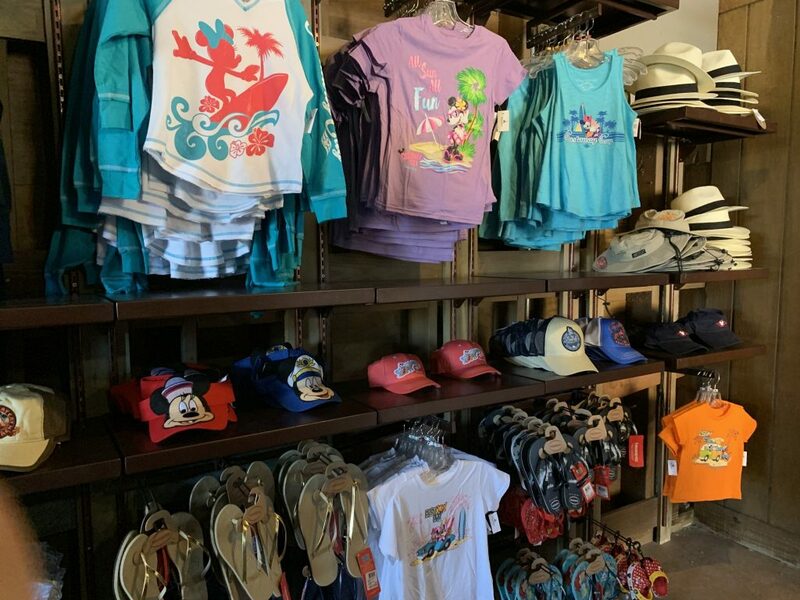 All of the items here are Castaway Cay branded and can only be found on the island. If you see something you want don’t wait. 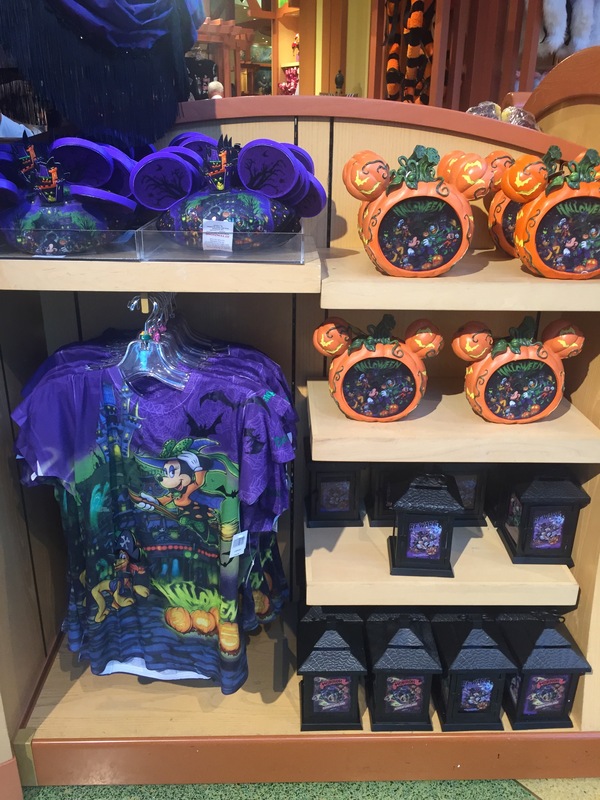 The shops will close earlier than the island does and you can’t find these items on the ship! 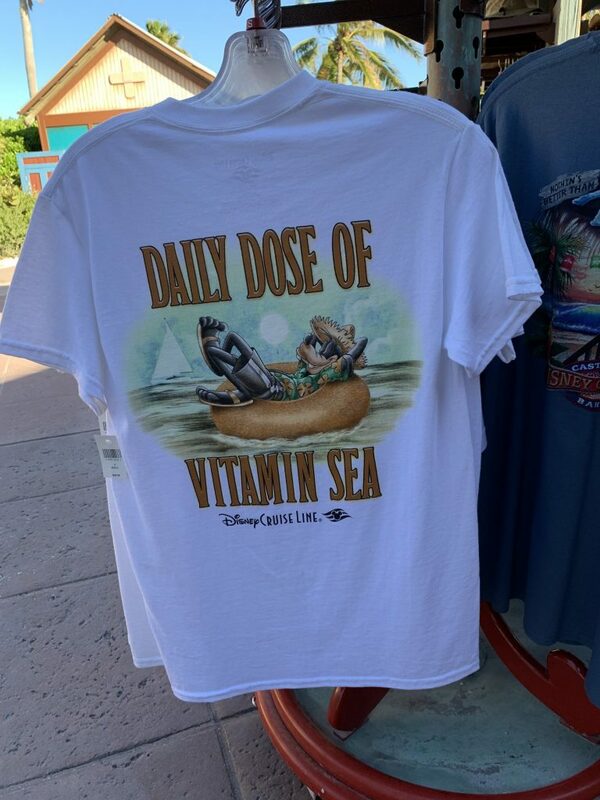 The merchandise you’ll find on Castaway Cay. 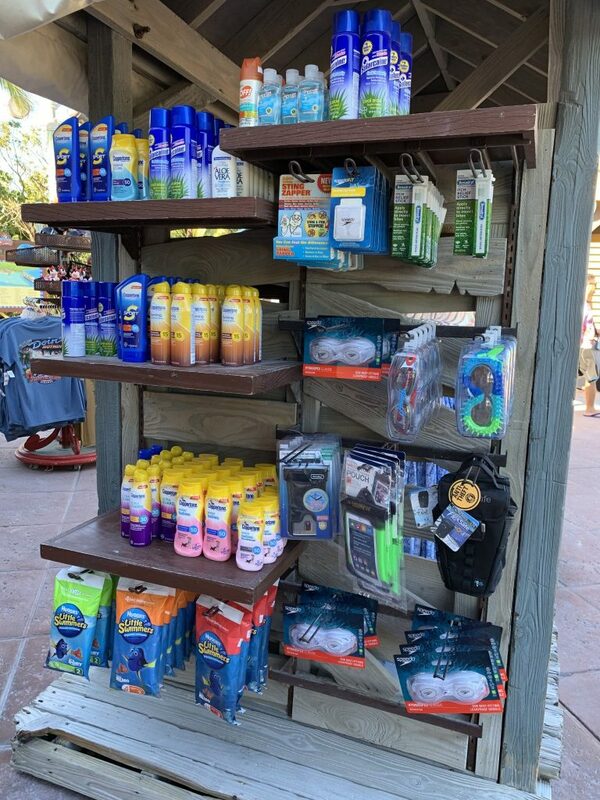 You can also purchase beach toys, bathing suits, sunglasses, hats, sunscreen and other beach day essentials you may have left behind. 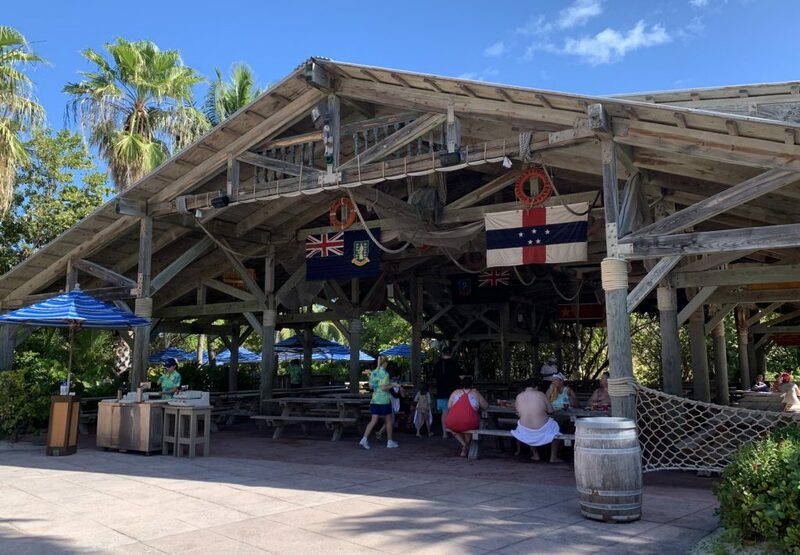 Bahamian Market Place – I wish I had some pictures of their offerings but I missed it before they closed last time! 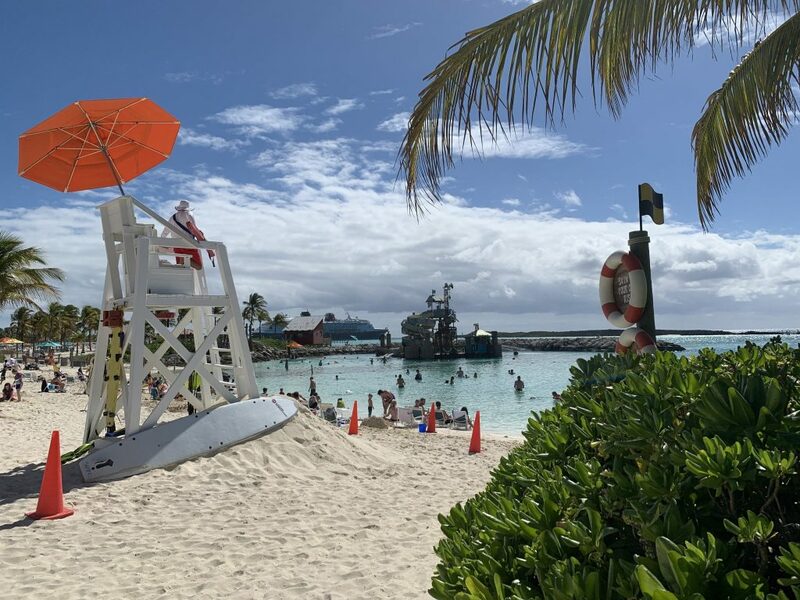 Serenity Bay is the adults only beach area on Castaway Cay. 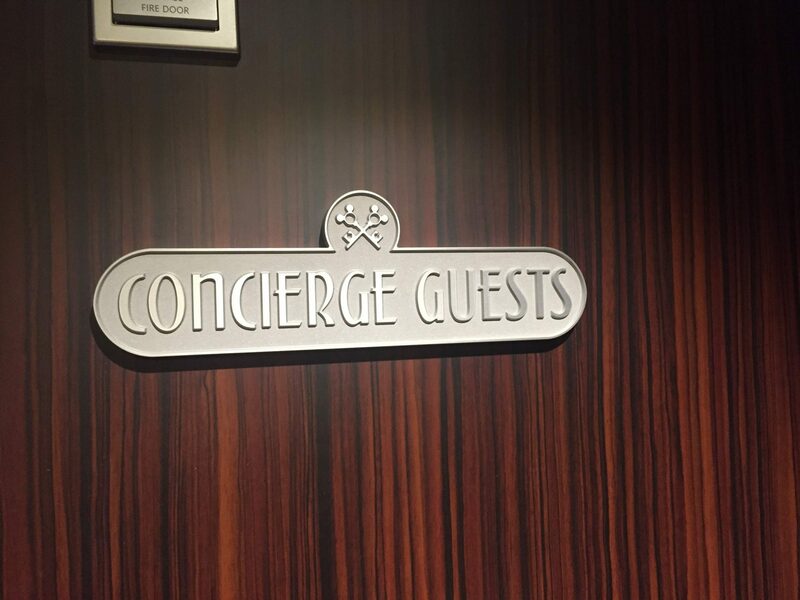 Guests using this area and its amenities must be 18 or over. 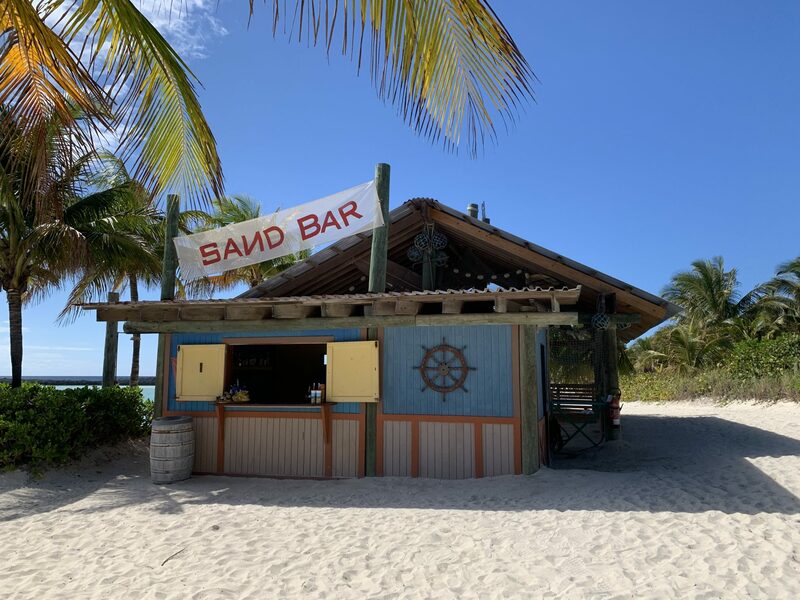 The secluded beach is home to 12 of the Castaway cabanas and has all the amenities the rest of the island offers without guests having to travel far or mix with younger families. 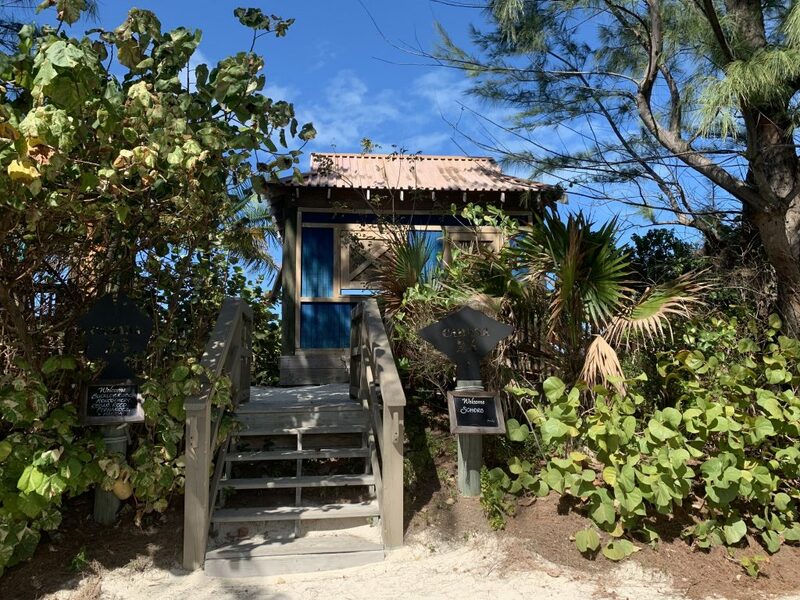 There is also a massage cabana on Serenity Bay for on-island massages. Sign me up! Serenity Bay is located on the far side of the island from the ship. You’ll need to take the tram to get there. Above is a look at the Tram Stop located closest to Serenity Bay. The entrance to the beach is immediately to the left located just outside the picture. 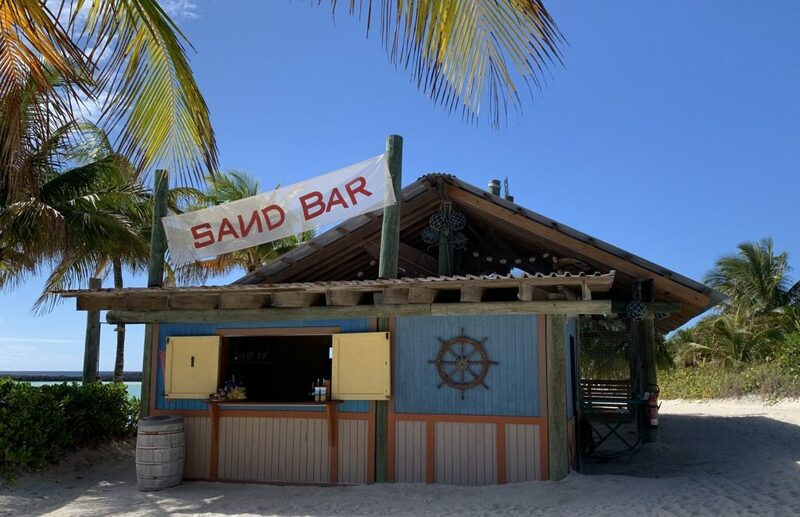 Serenity Bay guest can enjoy lunch at Serenity Bay BBQ, purchase drinks at the Castaway Air Bar and rent floats at the Windstock Hut. 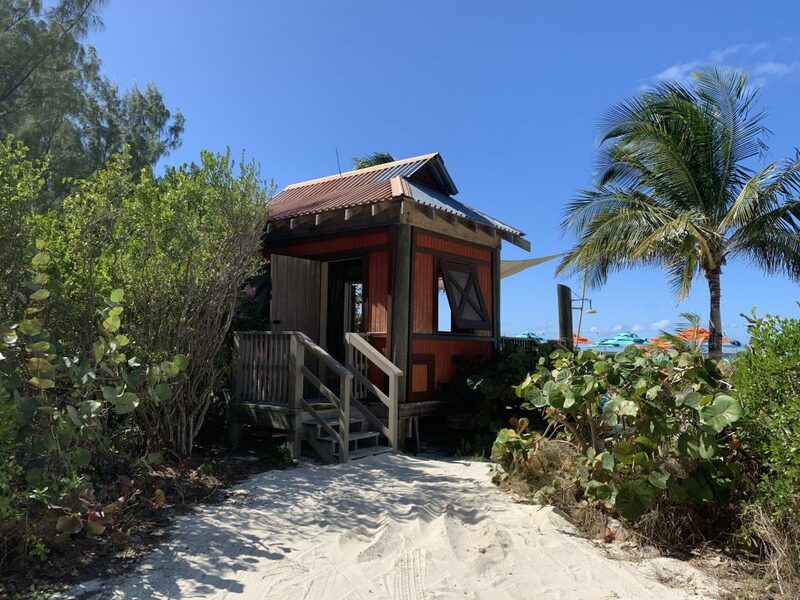 Castaway Cay has 25 Private cabanas for rent on the island. 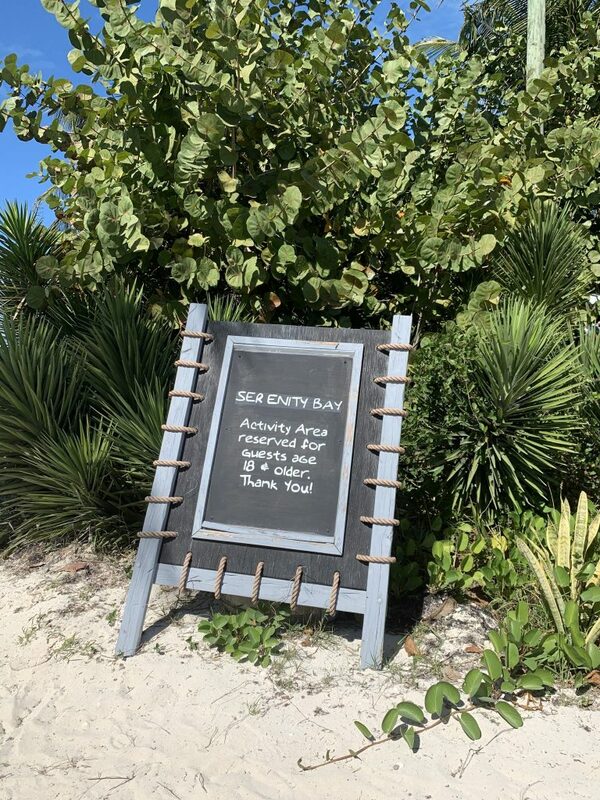 12 are in the adults only area Serenity Beach. The other half are located closer to the family beach area and also have a private beach area for Cabana users only. 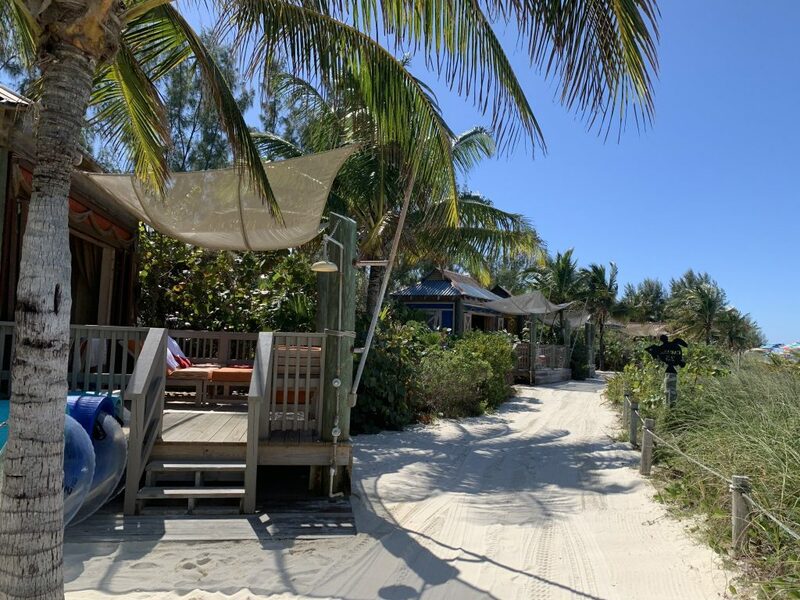 Private Beach for Cabana guests. How to rent a cabana for the day. 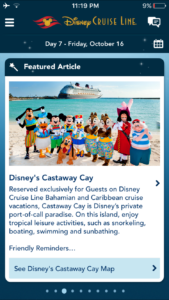 Cabanas are rented on the Disney Cruise Line website once your reservation has been paid in full and your online check-in is complete. 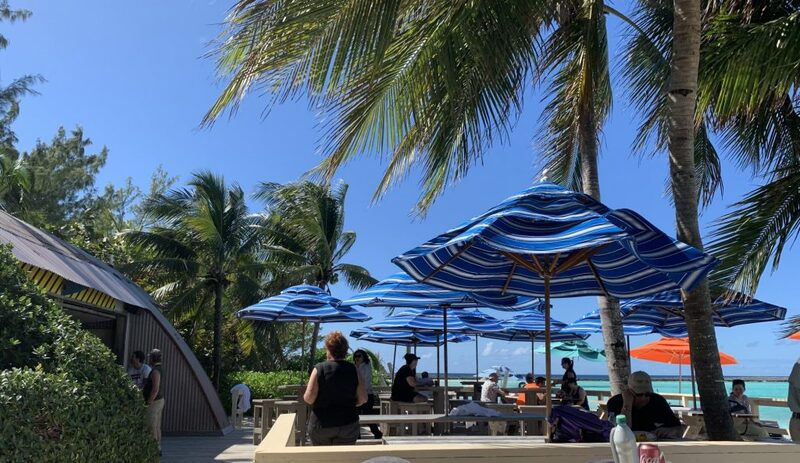 Cabanas are generally rented by concierge level clients who have the ability to do their online check-in at 120 days prior to sailing. 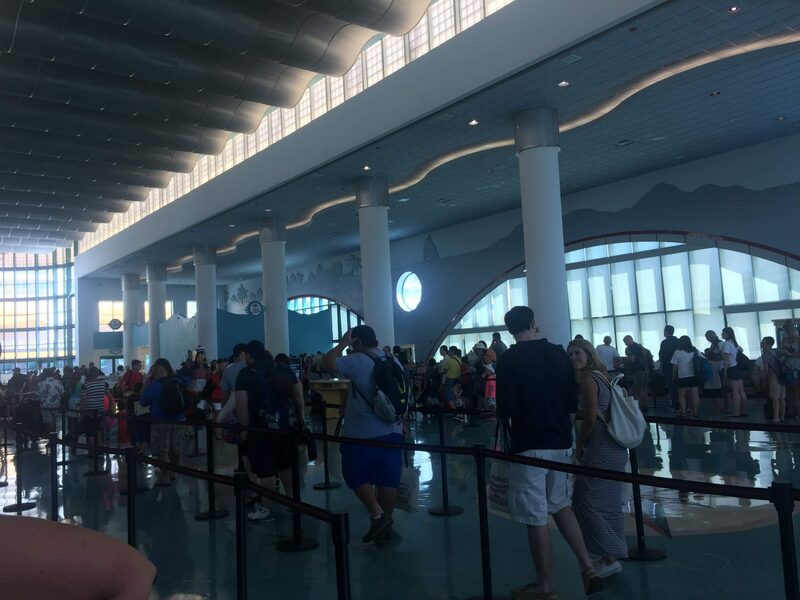 They are typically sold out by the time general sailing guests are able to check in. 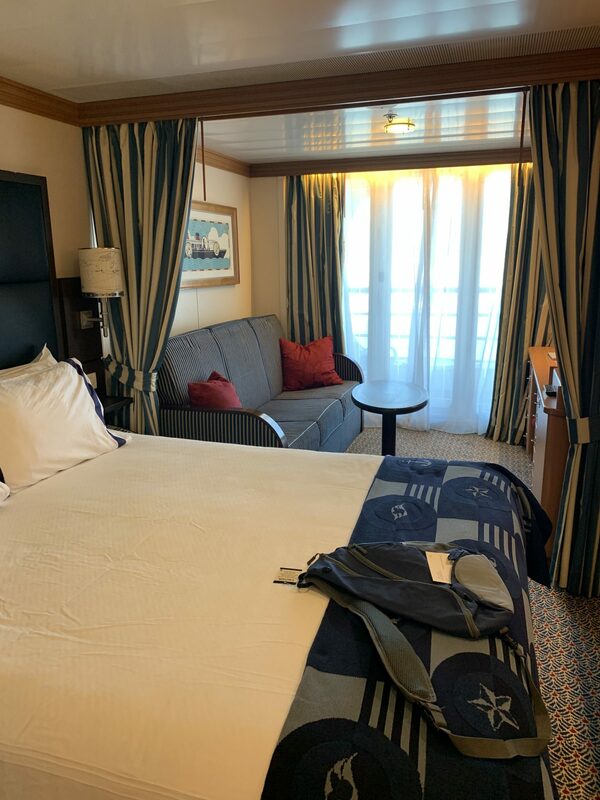 If you want a cabana you should choose to sail in one of Disney Cruise Lines concierge level rooms and let the concierge level staff or your travel agent know prior to your online check-in date. What is the Cost of a Cabana? What does the Cabana Rental include? *prices and amenities subject to change without notice. What to Pack in your Beach Bag? Snorkel gear if you decide to bring your own. 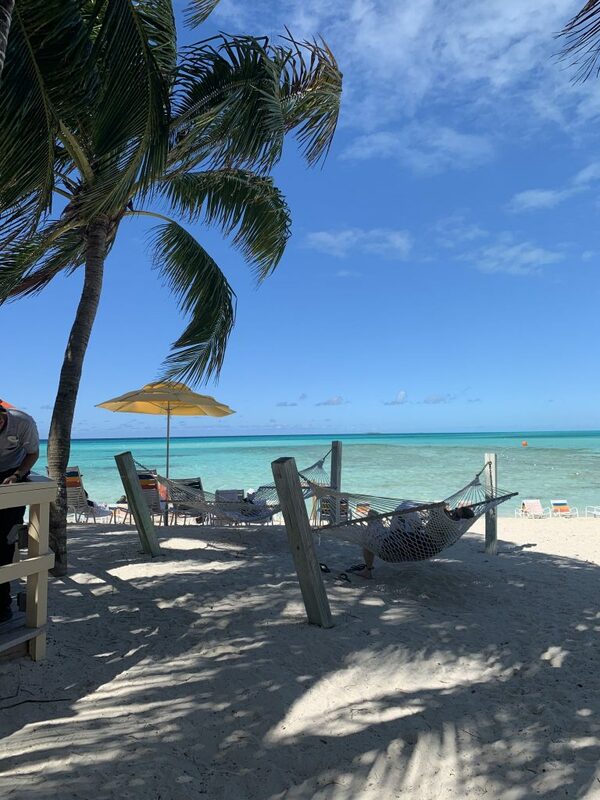 Many of my clients ask me what to expect for their day on Castaway. I know it can be really hard to imagine especially if you’ve never visited a private cruise line island. To help you better understand what to expect I say picture it as a beach day with built-in activities and water park type amenities. 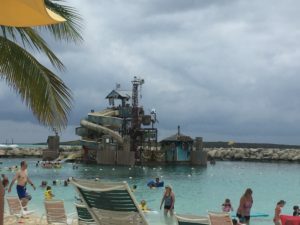 Here’s my perfect day at Castaway Cay to help you plan for your day. 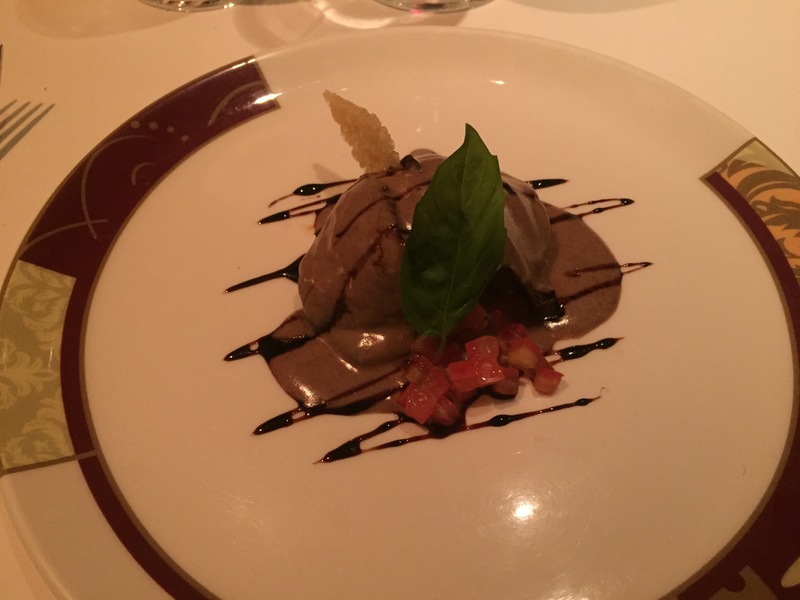 Order room service the night before for a quick breakfast before you disembark the ship or eat at Cabanas. Bike ride to explore the island. This takes about an hour. Shopping – Note that the shops will close earlier than your back on board time. 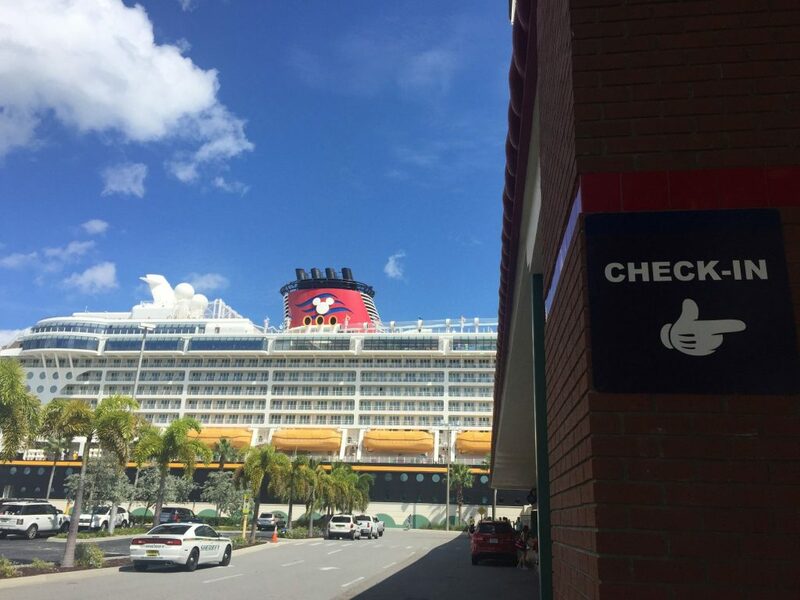 Make sure you’re shopping several hours before you need to board the ship. 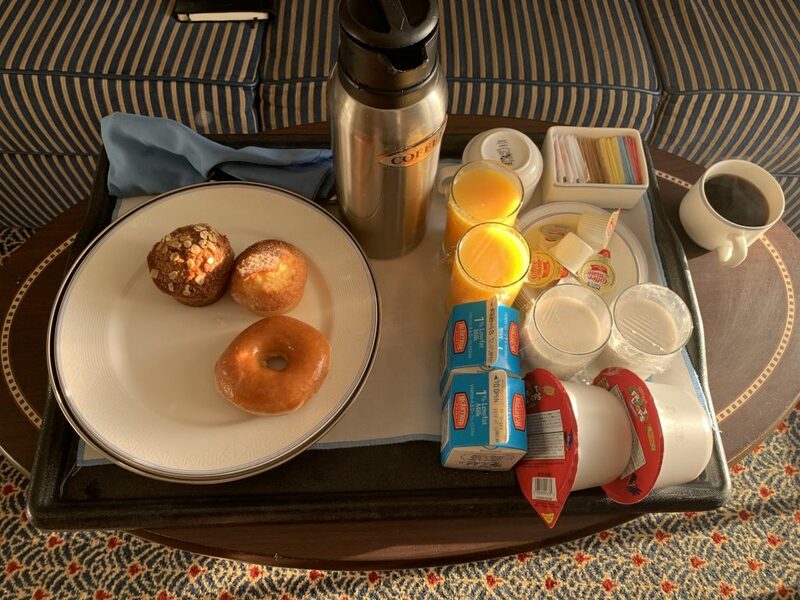 Order room service the night before for breakfast the following morning. Then you can sit on your verandah and enjoy breakfast while you watch the island come to life. 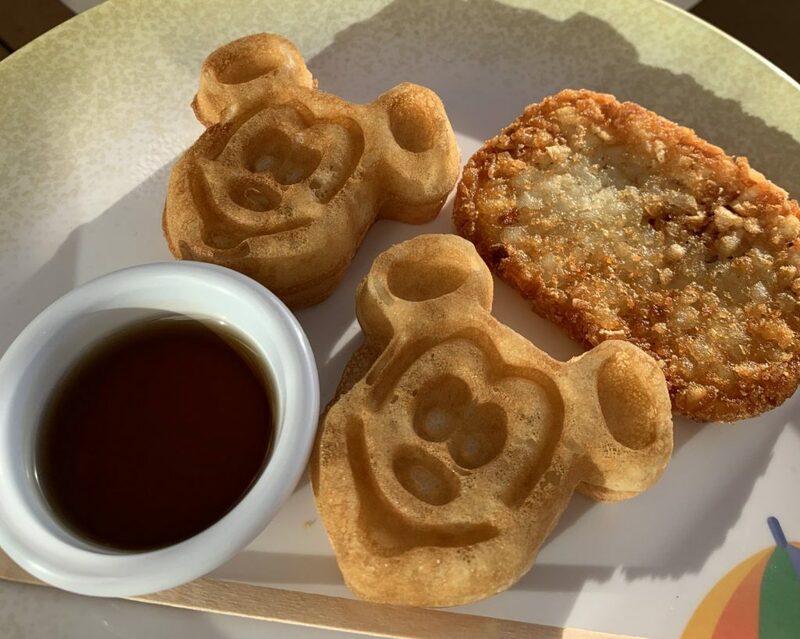 Mickey waffles and hot items are not available on the room service menu for breakfast. 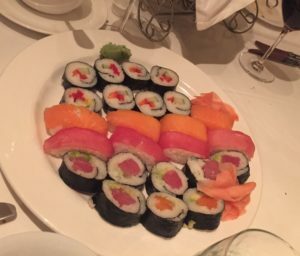 But you can quickly run up to Cabanas buffet and bring a hot plate back to the room if you desire! 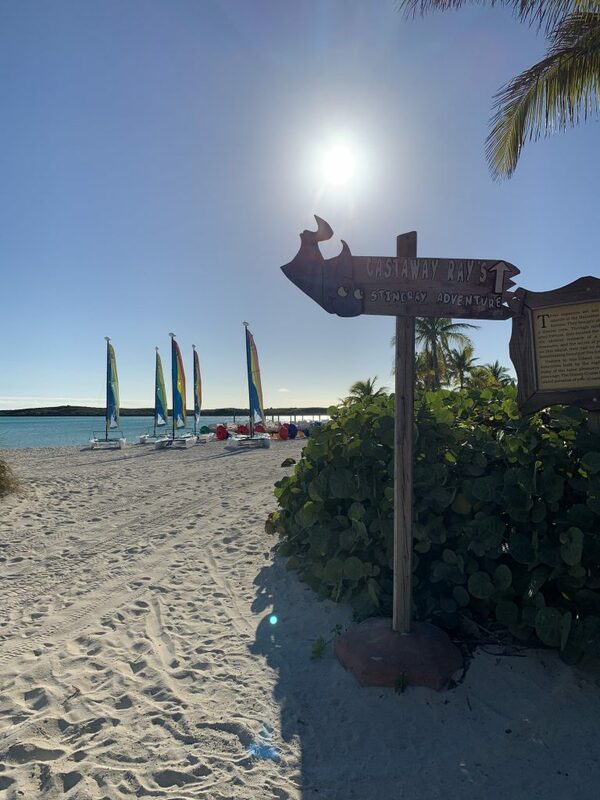 If you’d like to be first off the ship make sure to sign up for the Castaway Cay 5k prior to the morning you arrive on the island. Sign-ups must be done onboard at the excursion desk. 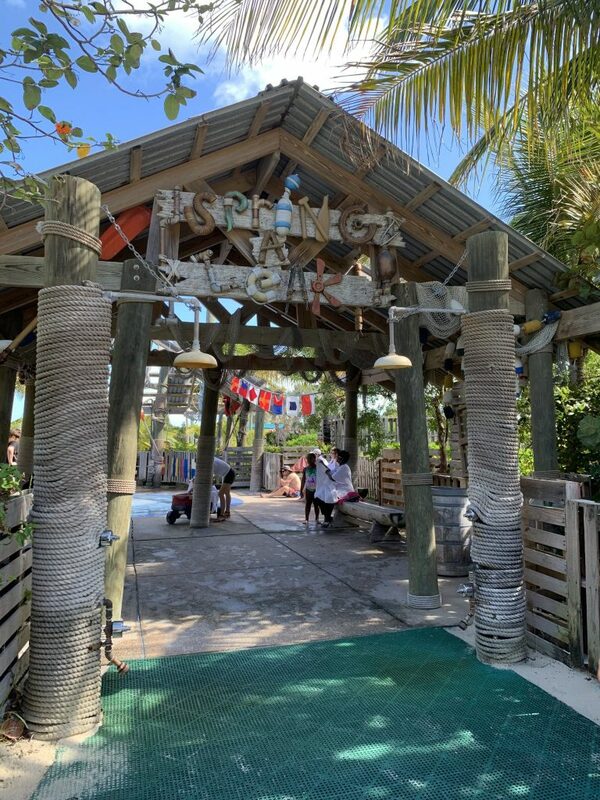 Pre-sign up your kids for kids club on the ship if you plan to drop them at Scuttles Landing Island kids club. There is no wifi on the island. Do your shopping early so you don’t miss out. The shops will close prior to the island departure time. 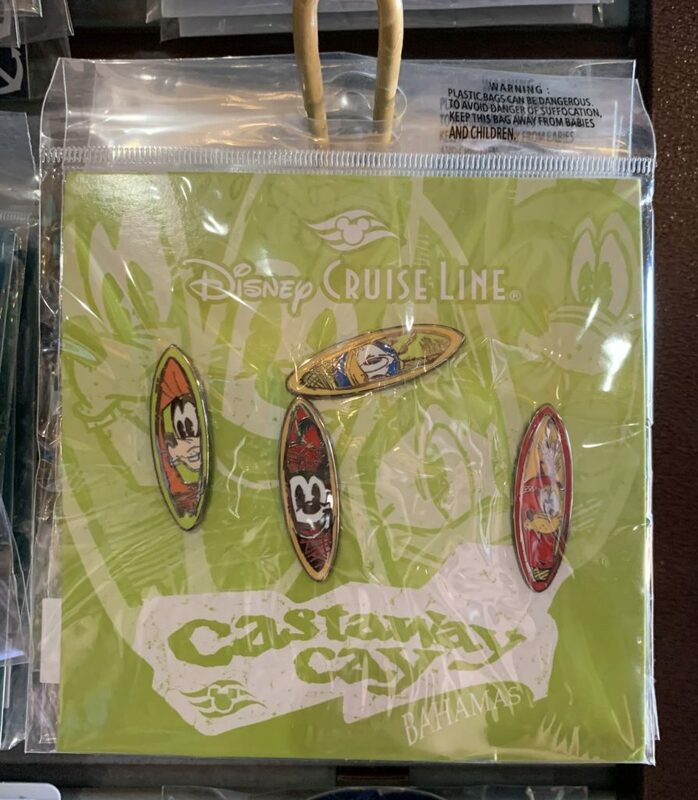 You can only get Castaway Cay items on the island so don’t wait if you see something you want! 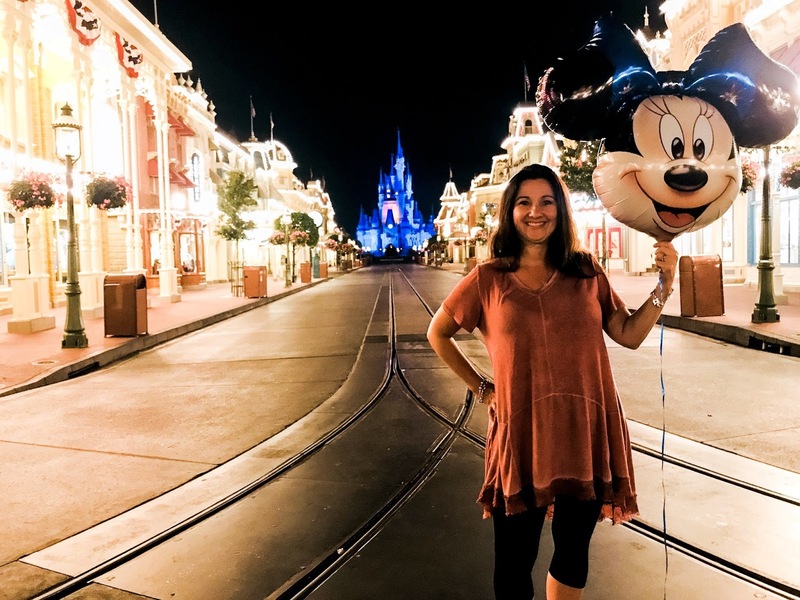 What’s Included and WHY you SHOULD sail with Disney! 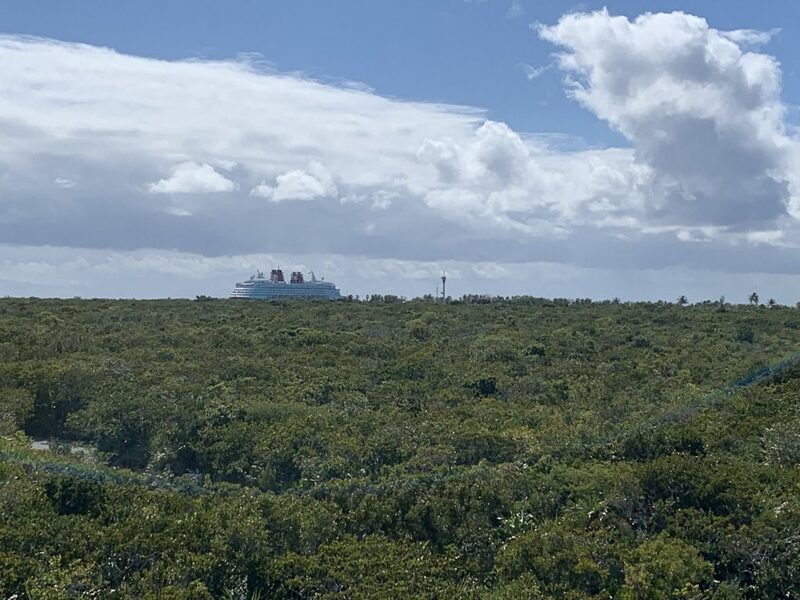 Disney Cruise Line currently has 4 ships sailing. The two classic sister ships, the Disney Magic and the Disney Wonder.? 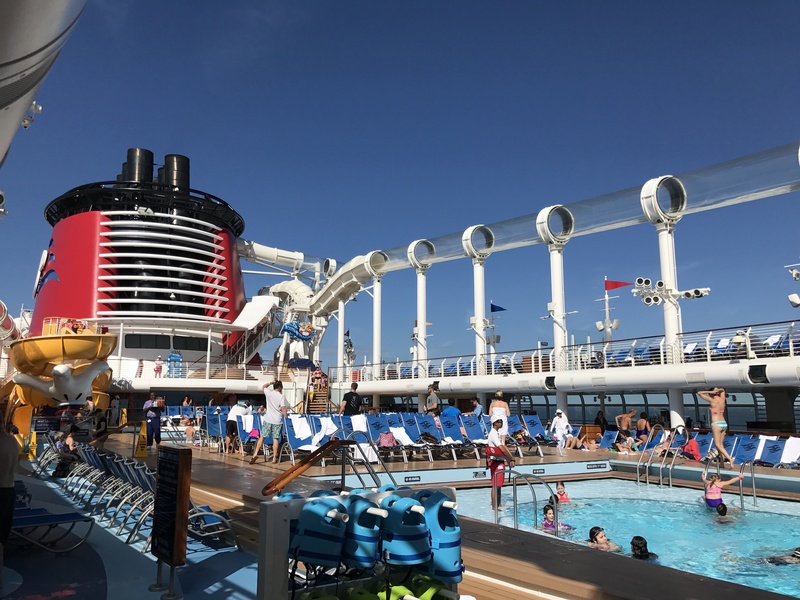 These two ships move from various ports throughout the year; and the two larger ships (still small by comparison to some of the mega ships) the Disney Fantasy and the Disney Dream.? 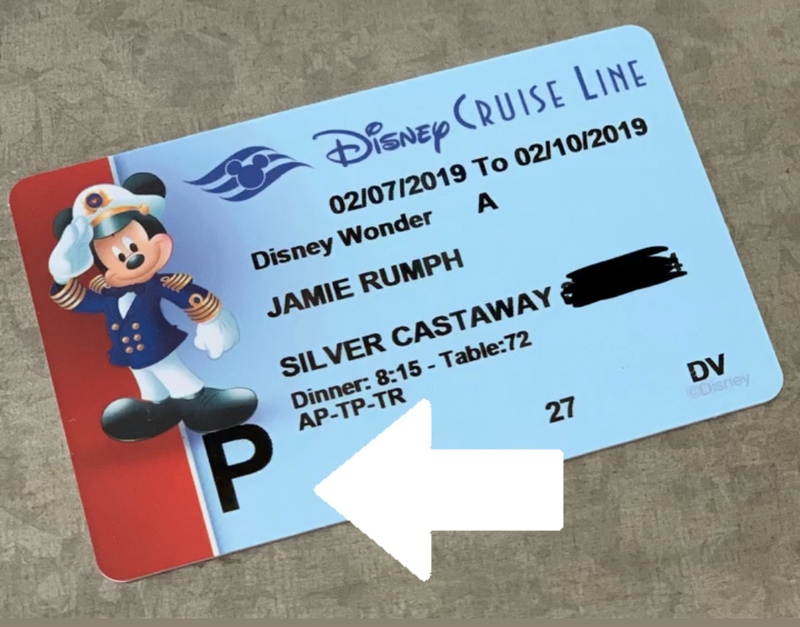 Both sail out of Port Canaveral on a 7 night and 3/4 night cruise, respectively.? 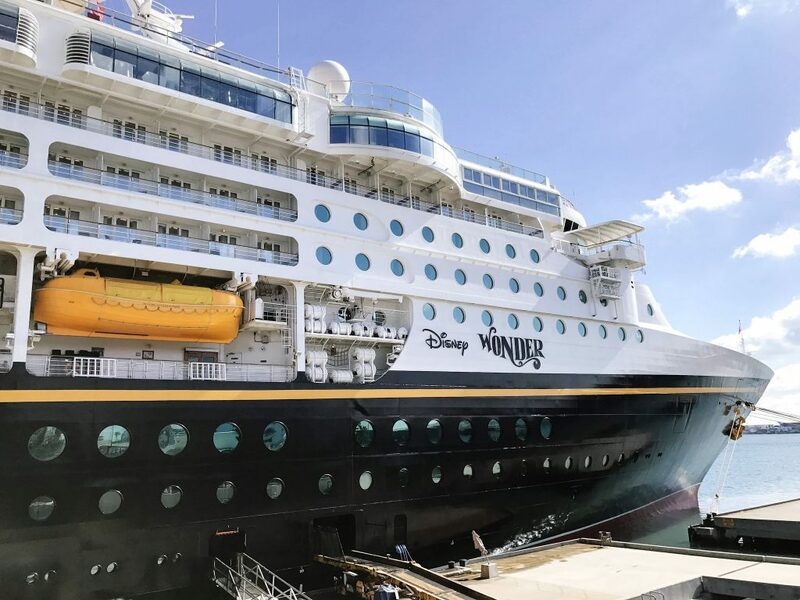 Finally, Disney has announced three new Disney cruise ships are on order, and will join the fleet with their inaugural sailings in 2021, 2022 and 2023.? The names have not yet been announced.? Any guesses? 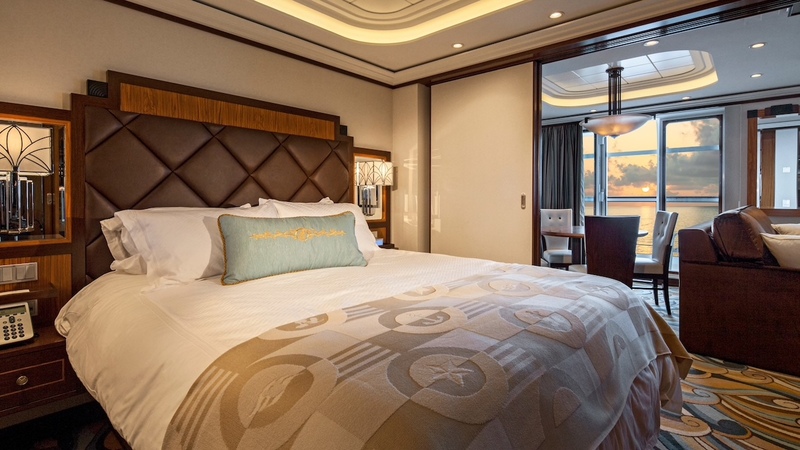 Stateroom and all applicable taxes and port fees. Endless snacks, ALL.DAY.LONG!? And ICE CREAM!? 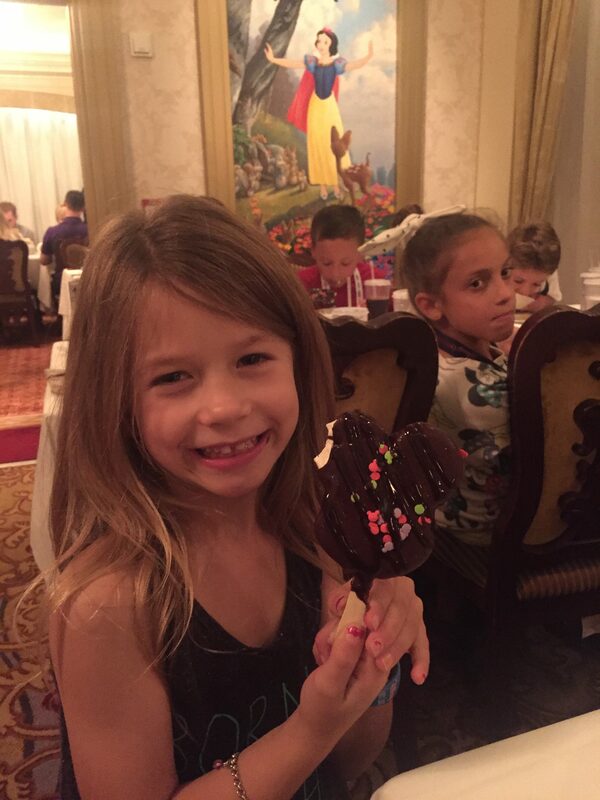 Did someone say “Mickey bar”? Yes, please!? Soft drinks at meals and drink stations.? (Room service soft drinks are not free) Water (not bottled), tea and regular coffee. 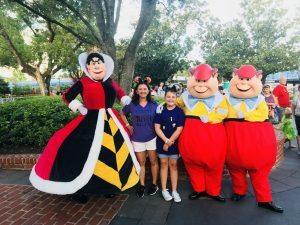 Disney Character Meet & Greets? 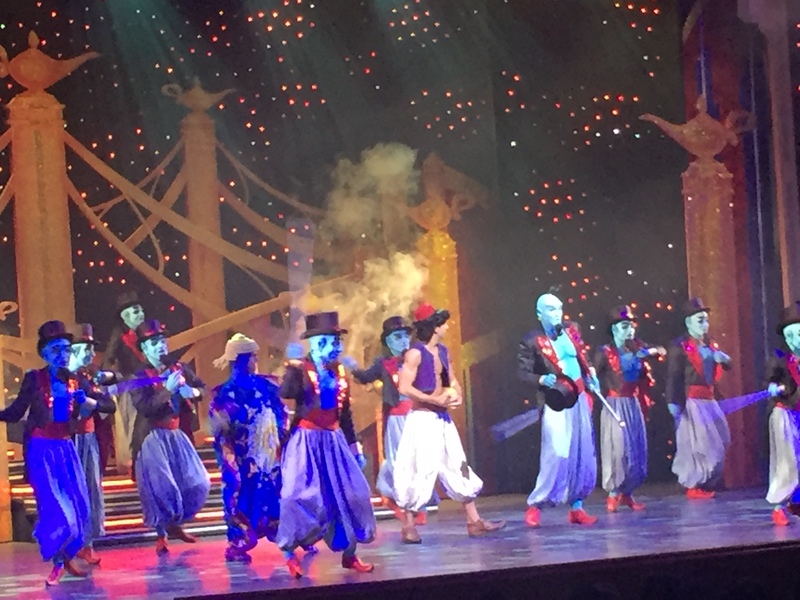 Nightly entertainment, including live Broadway Style Shows (show is ship specific)? 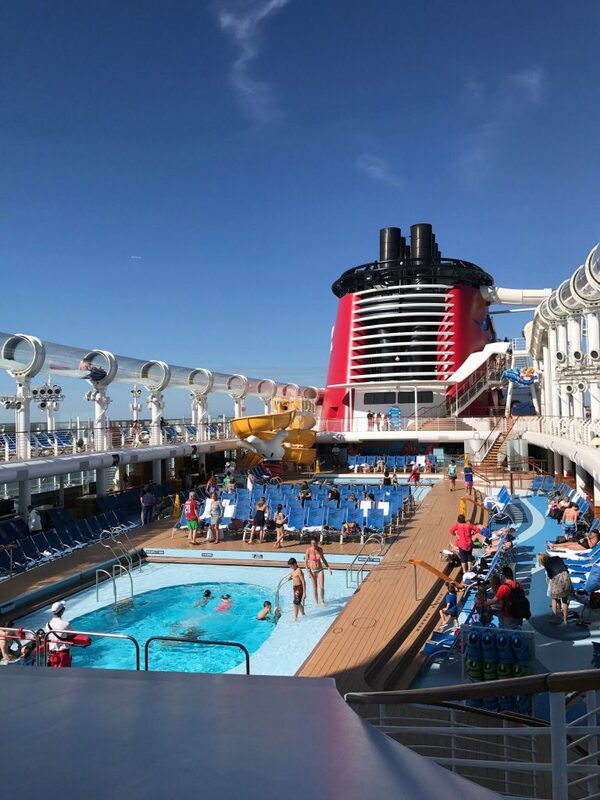 Disney movie classics and current first run movies, in the Walt Disney Theater, on Funnel Vision, the outdoor poolside movie screen, and on your stateroom TV.? Child Care at the Oceaneers Club and Oceaneers Lab for kids ages 3 to 12 (must be potty trained)? Teen Entertainment at the Edge for teens age 11-14? 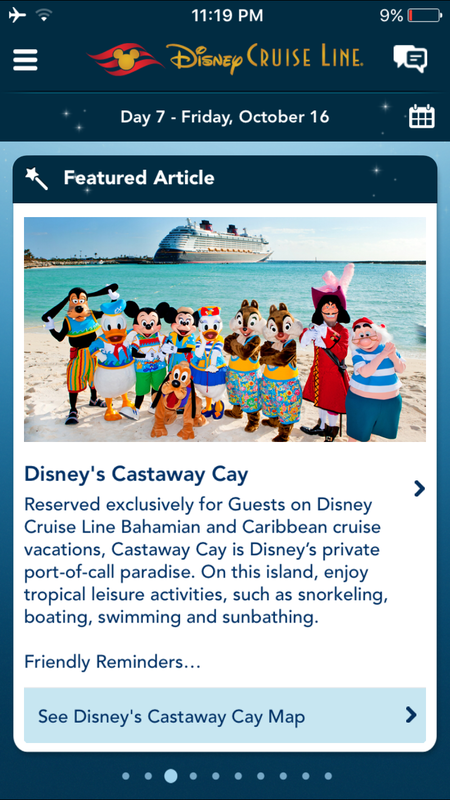 Disney Cruise Line app; used for in app messaging and full list of daily events? Pools and Splash pad for families? Water Slides!? The AquaDuck and the AquaDunk? Adults only pool and swim up bar? 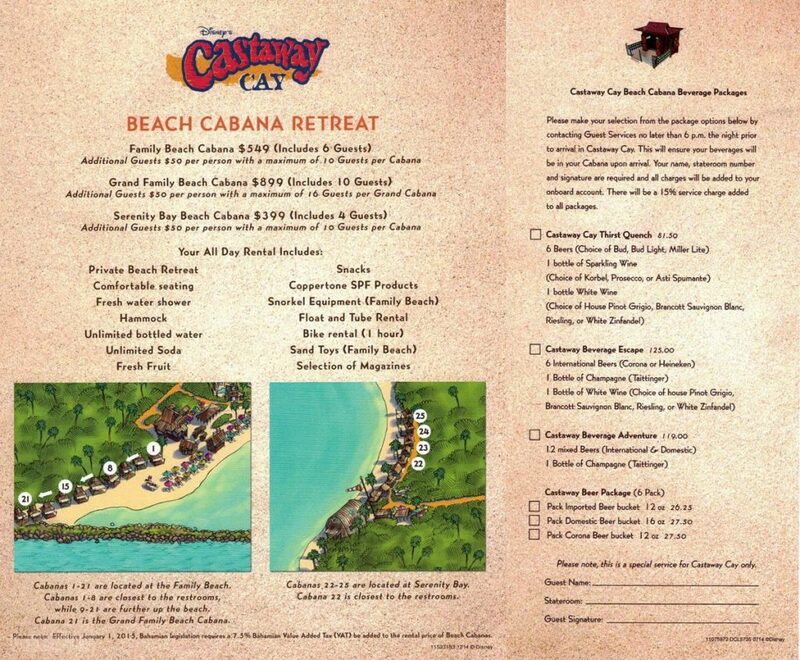 Disney’s Cast Away Cay (key) private island (BEST EVER!)? FIREWORKS at sea!? Coolest thing EVER!? Interactive Midship Detective Agency Game? Pirates Night! Ahoy Matey!? ? Disney Jr. 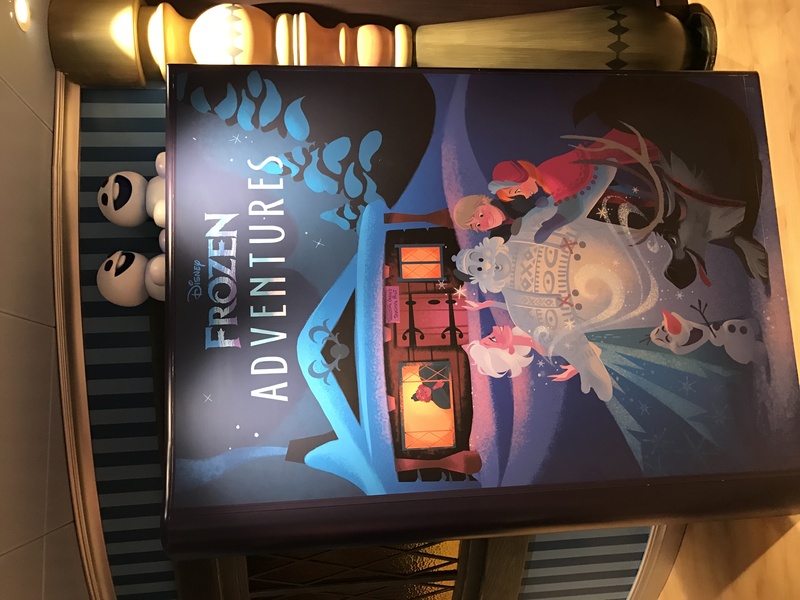 Character Breakfast! Yes, you read that right! 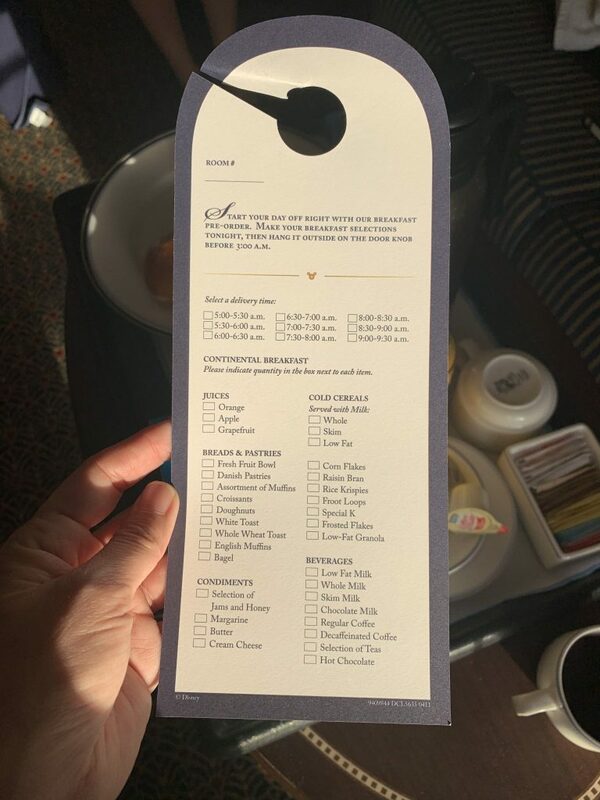 A character breakfast IS included!? 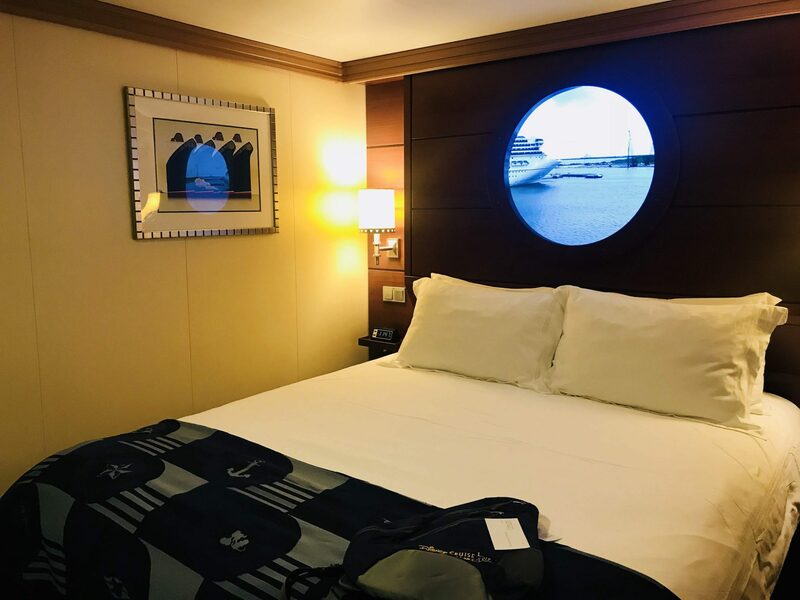 (select sailings, reservations required)? Towel friends!? I love these! 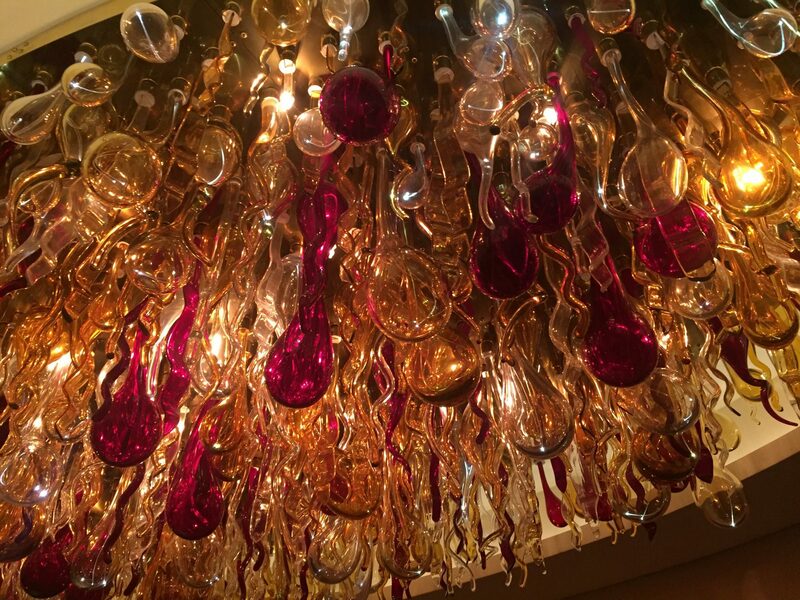 Don’t ask me why… they just add a fun element to the room!? Only the coolest ship horn EVER!? 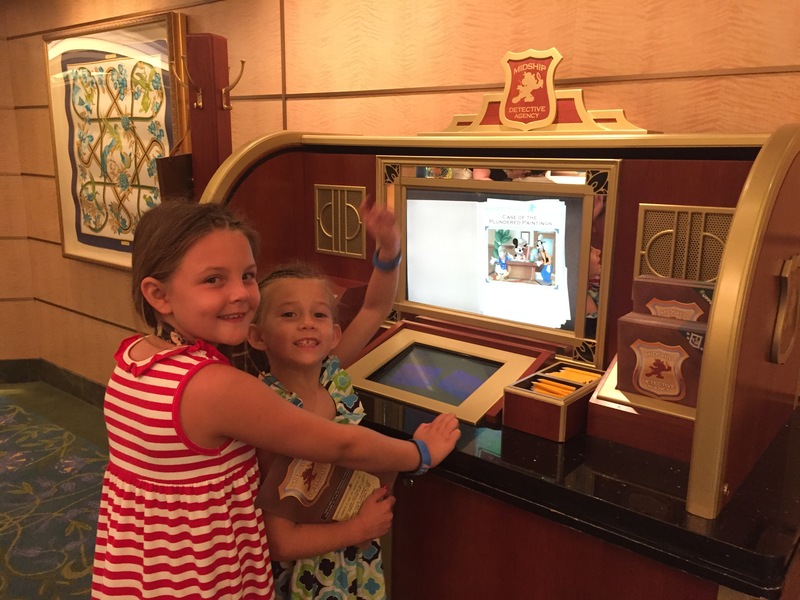 This one alerts you by playing Disney songs, not just your typical ship horn!? 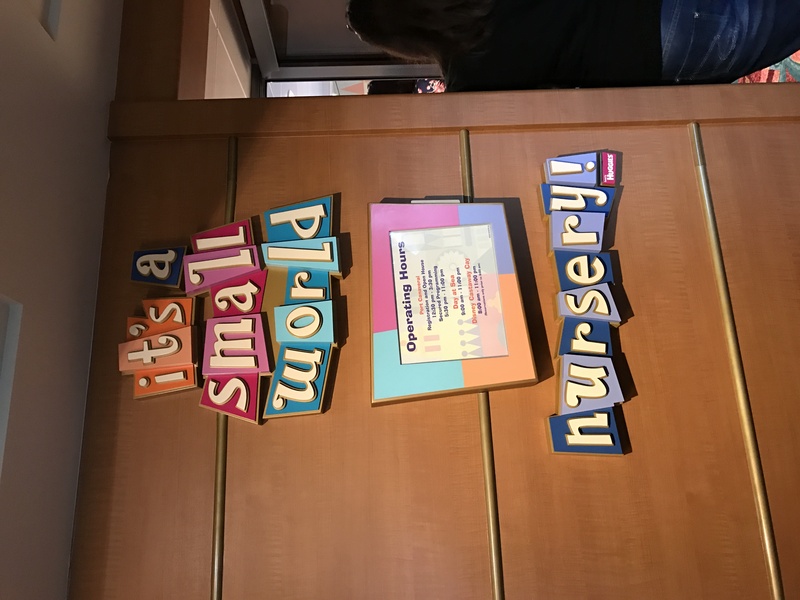 Small World Nursery for babies 6 months to under 3 years? Video Games (although there are games in both the kids/teen clubs) but if you want to go to the Arr -cade, it’s extra.? Alcoholic beverages.? 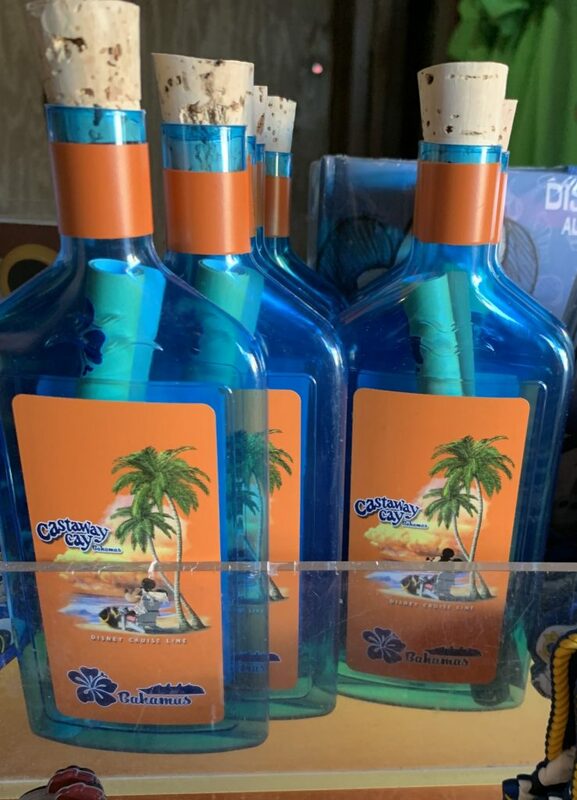 There are wine packages available, but Disney does not currently offer alcoholic drink packages like some of the other cruise lines.? You can however, bring on board 2 bottles of wine, standard size, or a 6 pack of beer.? Note: If you bring a bottle of wine to the dining room, they will charge you a bottle opening fee.? Open the wine in your room and bring your full glass to the table! TA DA!? Free wine!? Well, free ish!? 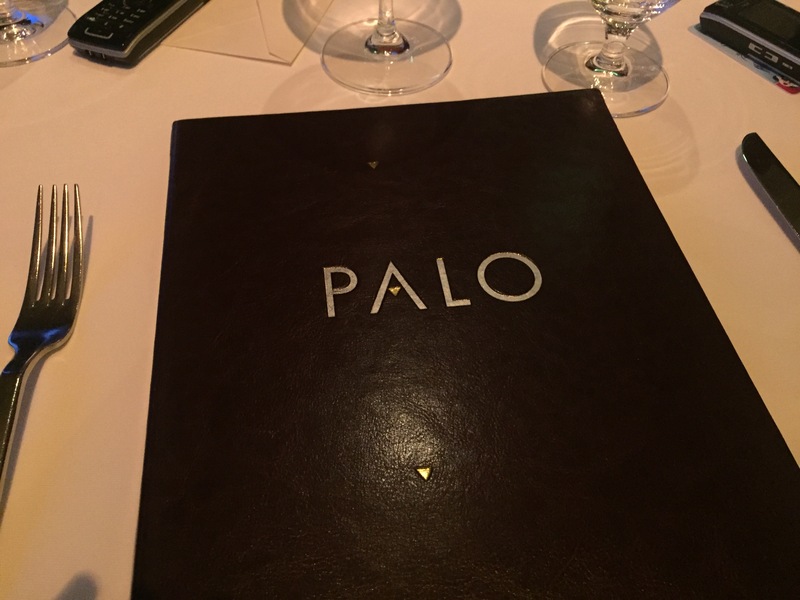 Adult only dining venues; Palo and Remy. These are available for brunch and dinner.? Reservations are a must!? Metabolic testing – Does anyone actually do this??? Braids and the crazy hair do that comes after them!? 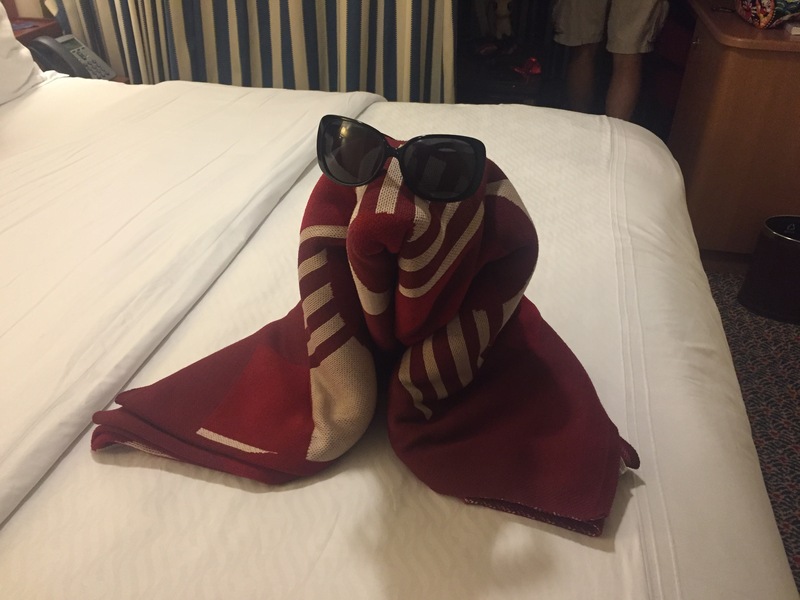 So, COULD you cruise and NOT spend anything else? Highly unlikely.? First, you will automatically be charged the daily gratuities. (These can be pre-paid )? Can they be adjusted? Yes.? Should they be?? Personally, I don’t think so.? 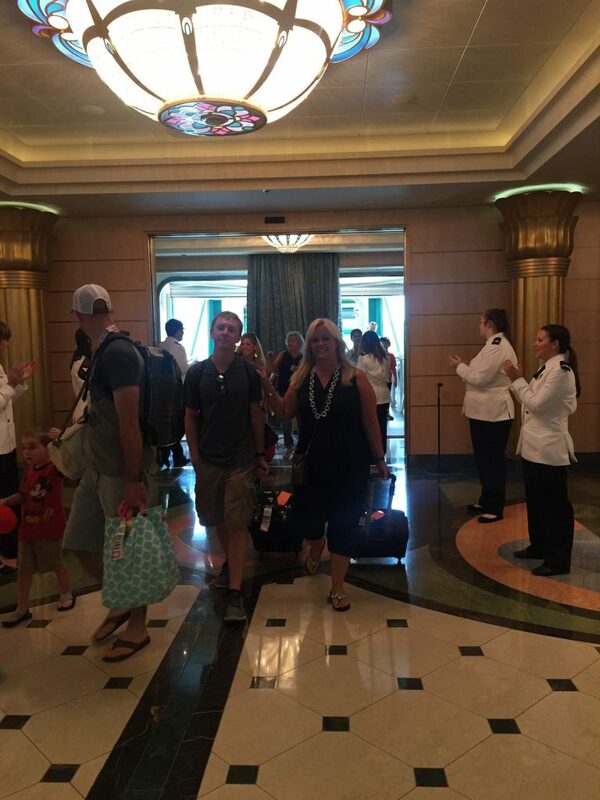 The Crew Members work their tails off to make your cruise vacation as MAGICAL as possible. 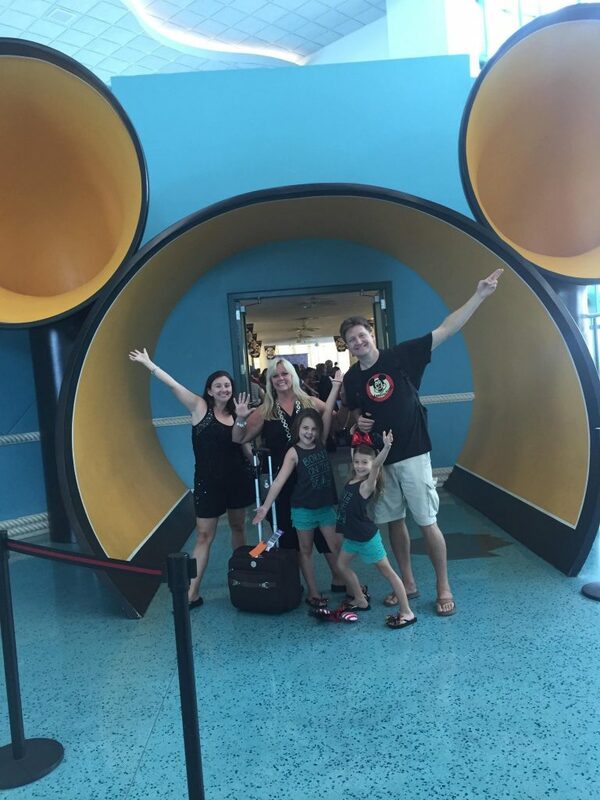 It is Disney after all, and they do customer service better than any other company I’ve ever known.? So, make sure you budget for gratuities. Second, I suppose you could skip out on quite a bit of it.? That’s a personal decision.? However, I think it’s more realistic to choose what you think you’d like to do before hand, make a plan, and a budget.? Stupid budget!? I hate those things! 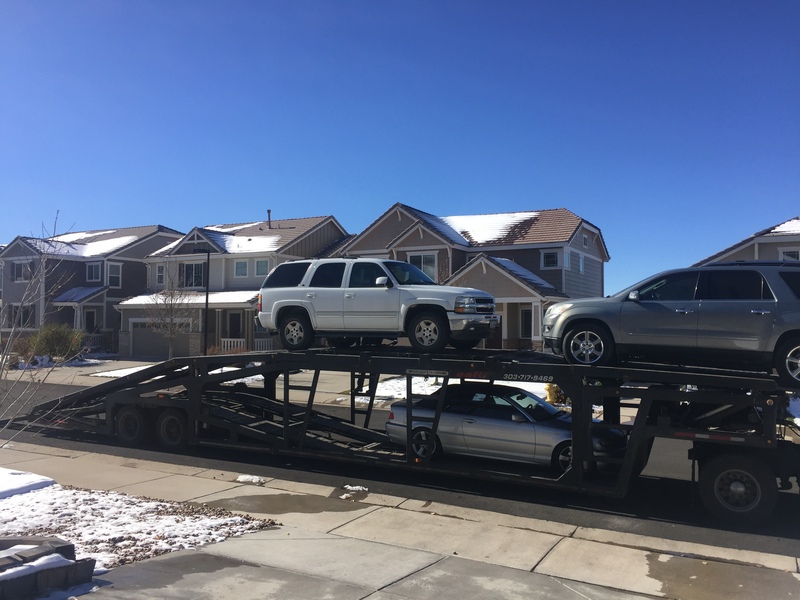 Until next time my friends!? 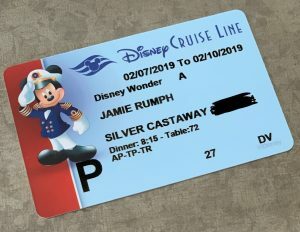 I’ll be over here planning my next Disney Cruise Line vacation!? The biggest question is… how many days and which destination, will I choose next?!!!? See ya real soon! 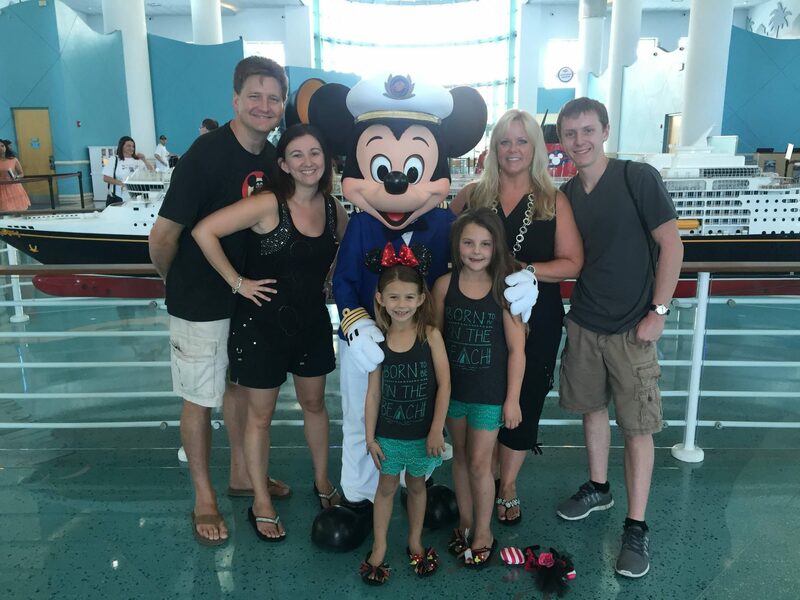 Why Should You Cruise Disney Cruise Line? For all of the reasons above!? 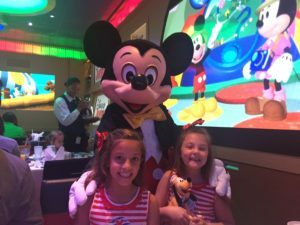 Disney has the best kids clubs, family activities, and the most included with your cruise fare!? 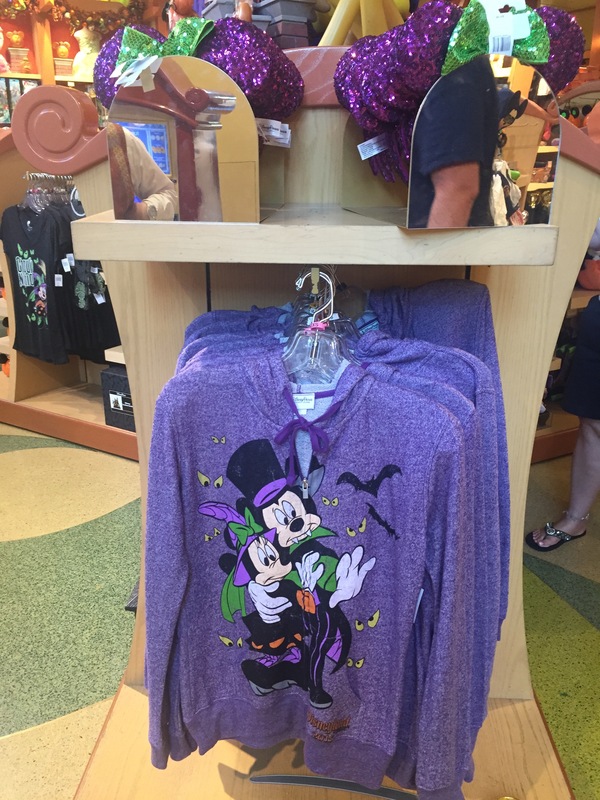 Also, you can see Mickey and friends!? That does it for me, every, single, time! 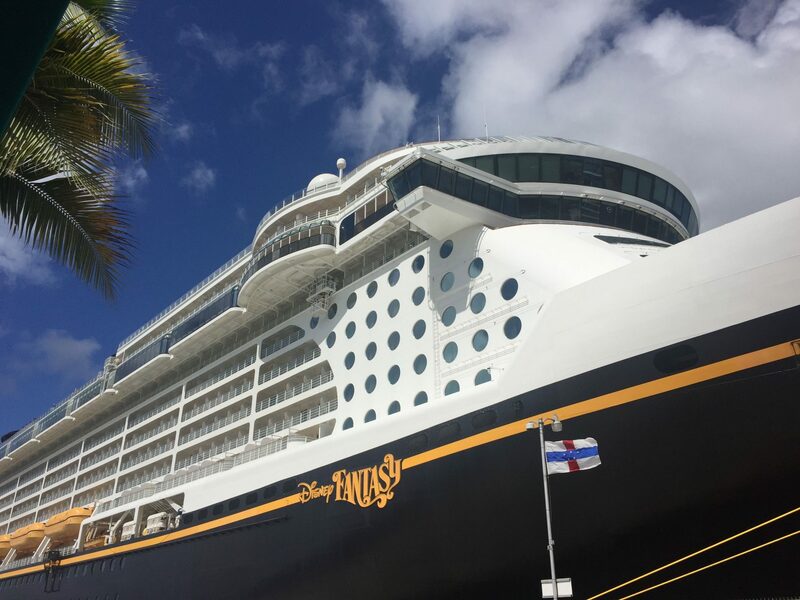 Have questions or ready to board DCL, contact me today! 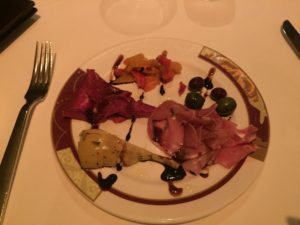 For endless pictures of Disney Cruise Line, including dining menus, please visit my Facebook page. 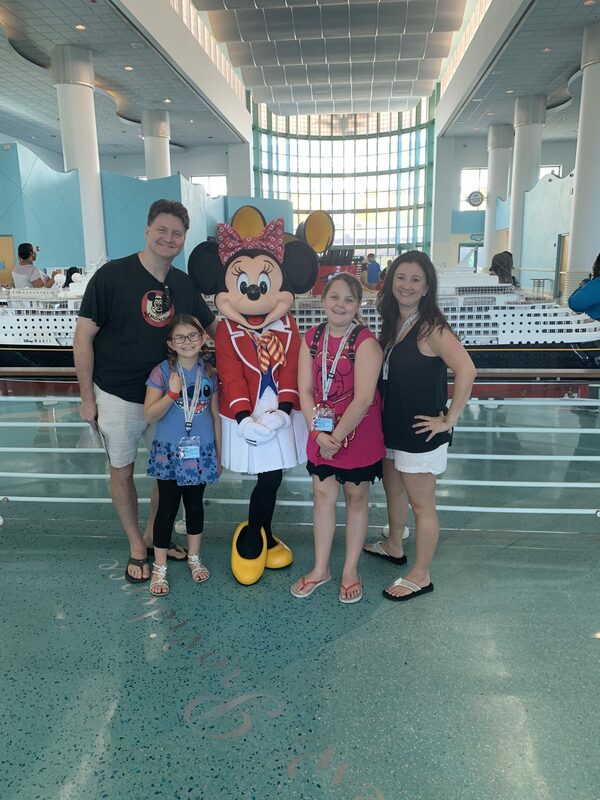 Don’t forget to view pics from our?Family Cruise on the Disney Fantasy?and tours of the?Disney Dream and Disney Wonder. *Contact me at jamie@lotmv.com or via my Facebook page? 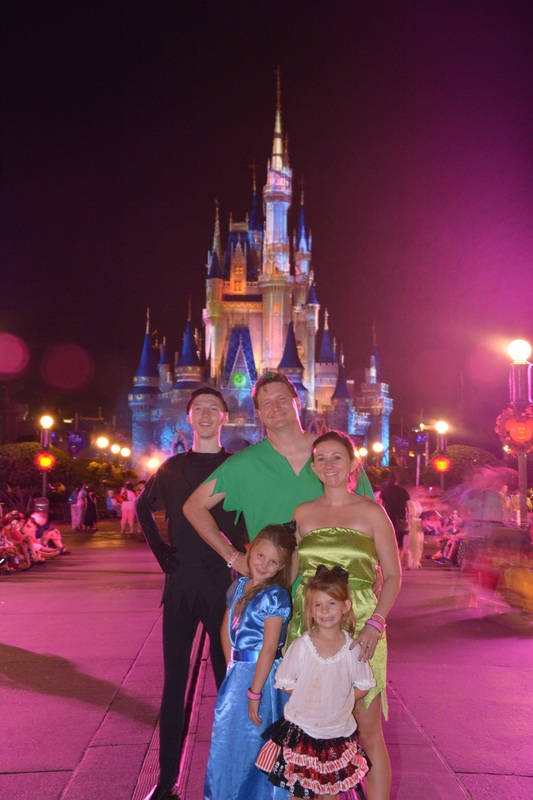 *Pictures are from Disney’s Fantasy, Dream and Wonder.? 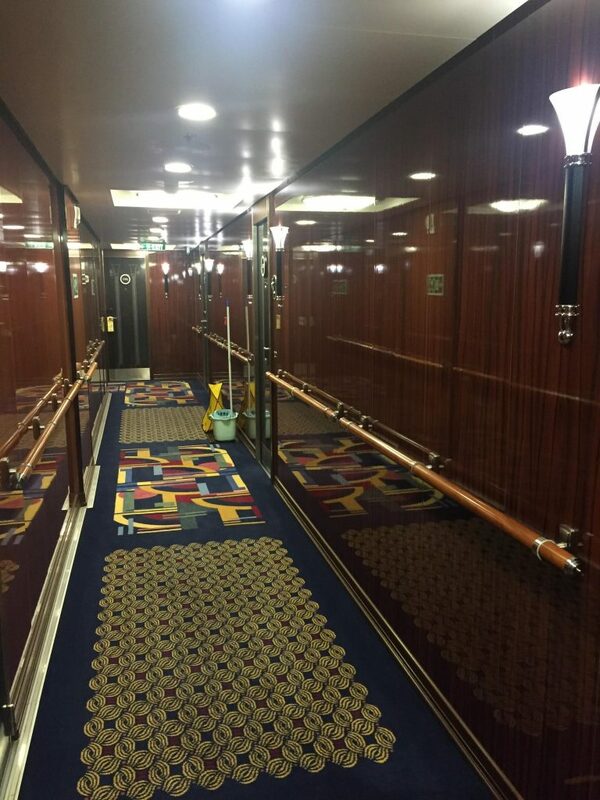 All spaces are not on all of the ships.? 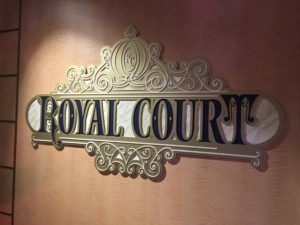 If there is something you want on your cruise specifically, just ask and I can point you to the correct ship! 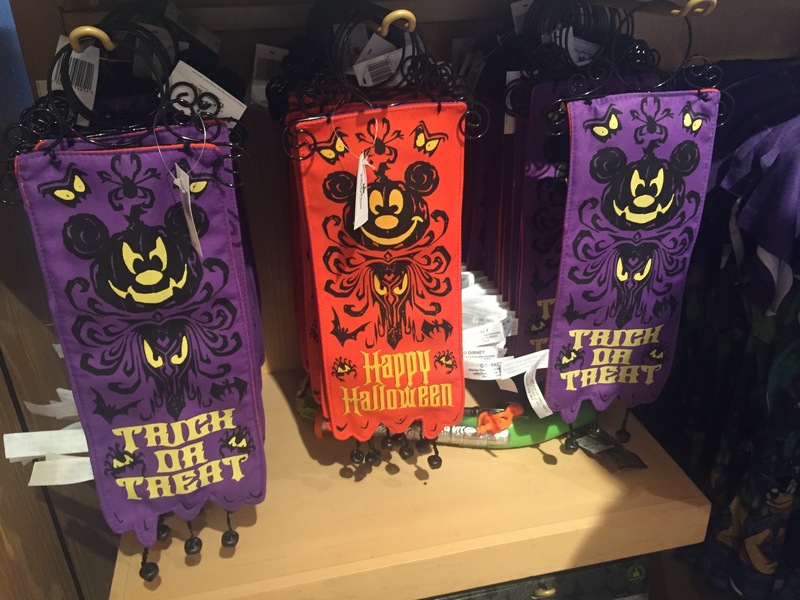 Halloween is right around the corner and Disney couldn’t be more prepared to celebrate this fun holiday with everyone! 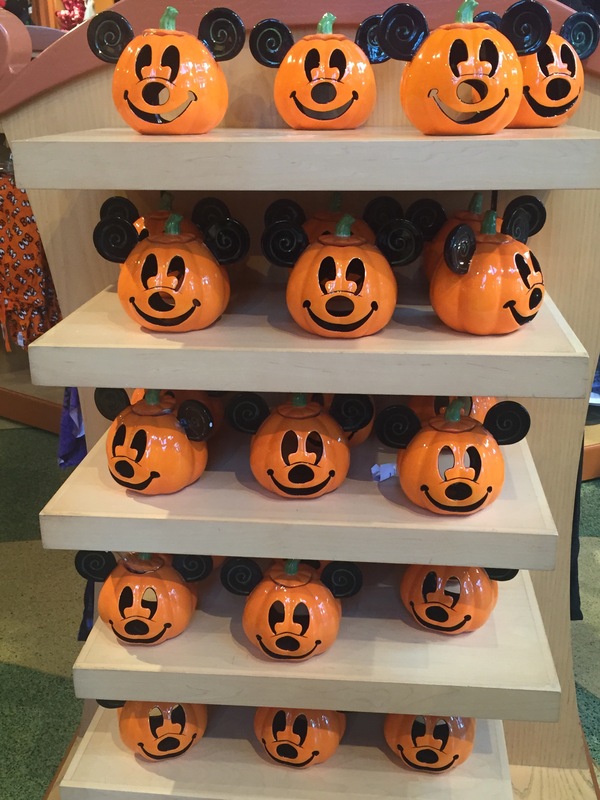 ?Coast to coast, and across the sea, Disney has a Halloween party you can’t miss! 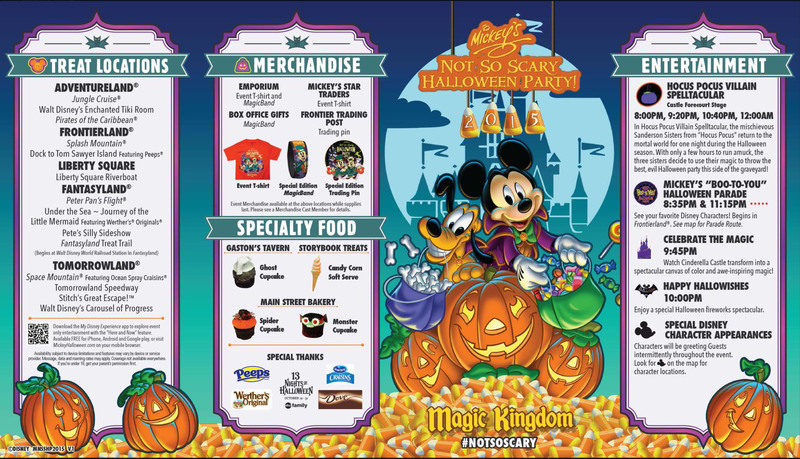 Mickey’s Halloween Party is held at Disneyland on select dates, some of which are already sold out! ?So grab your tickets fast! ?This party is a specially ticketed event, with a limited number of tickets available! 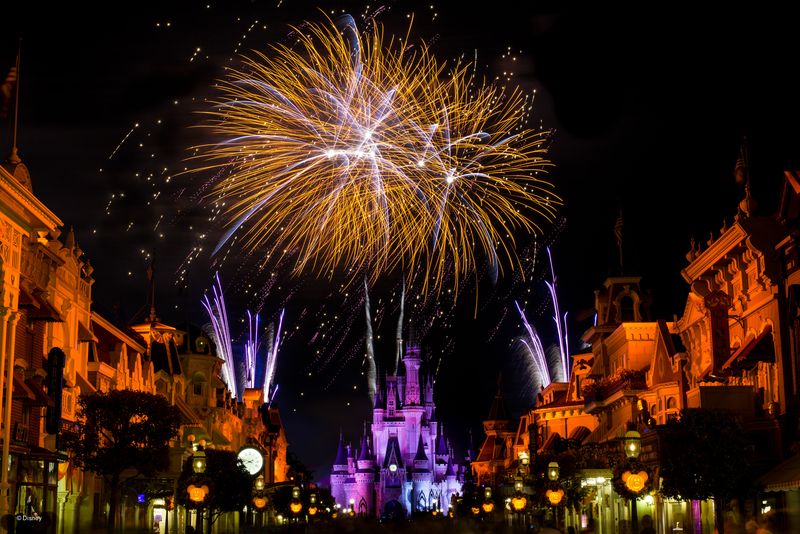 This means that the parks will have reduced crowds and better viewing of the parades and fireworks shows! ?A reduced crowd at Disneyland is almost like having the park to yourself! ?Can you say elbow room??? 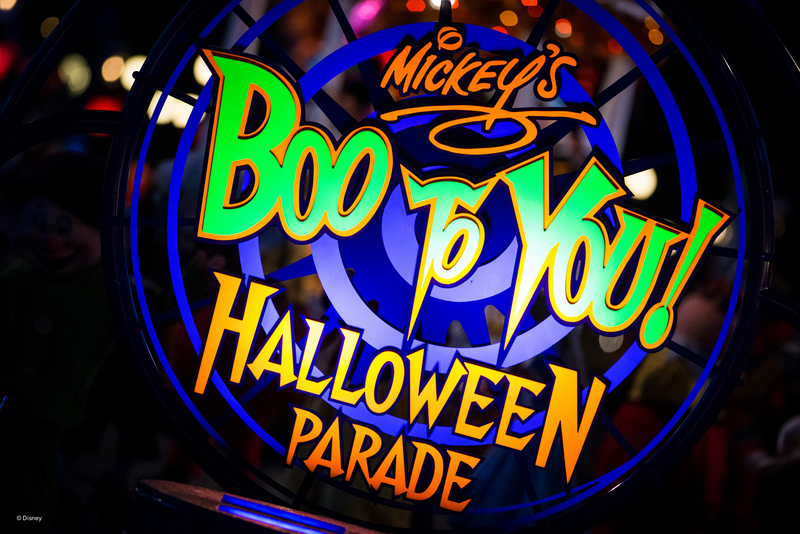 ?With a Mickey’s Halloween Party ticket you can enter the park up to 3 hours before the party starts and while all of the regular ticket holders are ushered out, you will get to stay and experience the night?s festivities! 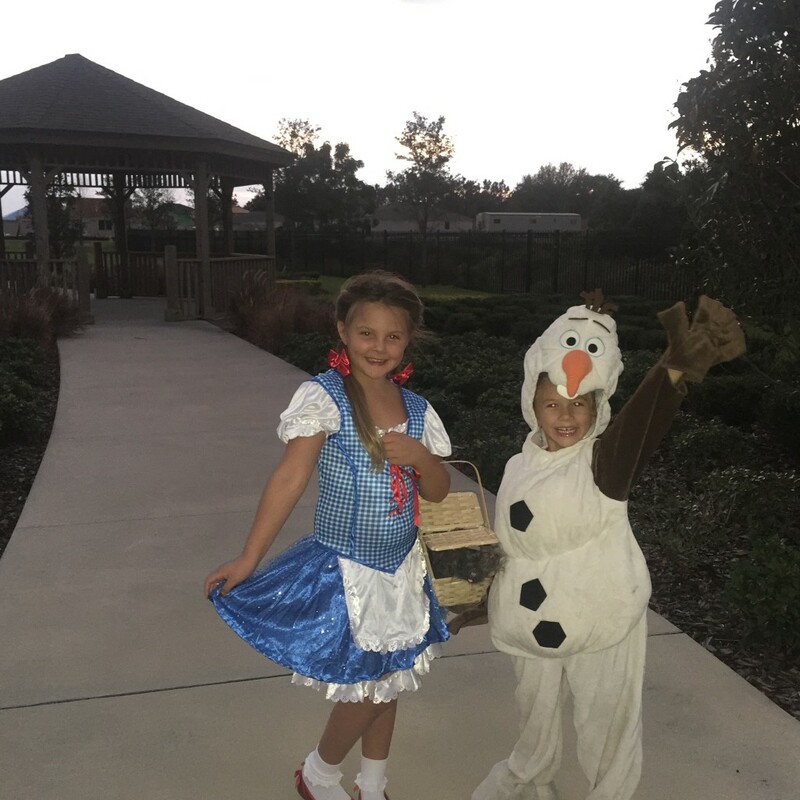 Adults and children alike are encouraged to dress up and enjoy Trick-or-Treating, a special fireworks show, ?Halloween Screams- boo-tiful fireworks?, and photos with your favorite characters dressed in their Halloween attire!? Even the Villains will be out! ?You can ride the rides with short lines guaranteed and take-in a few attractions gone spooky! 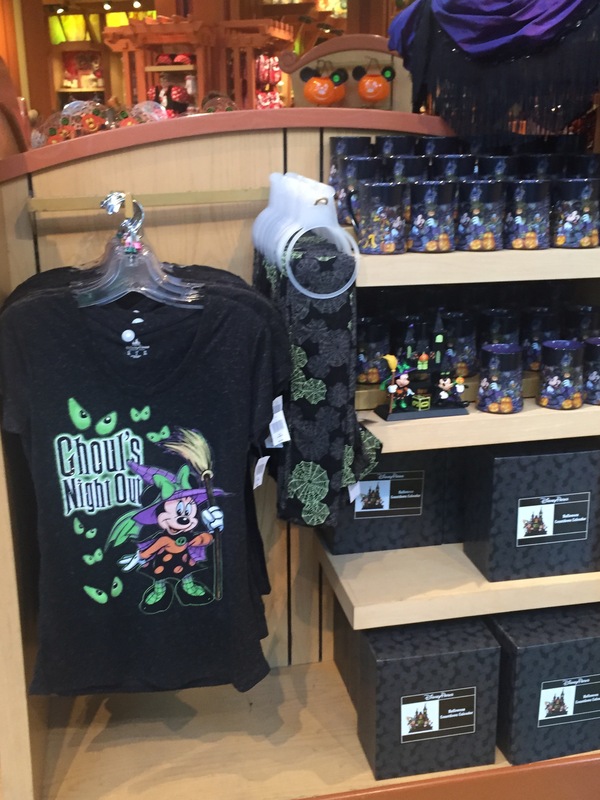 ?Space Mountain – Ghost Galaxy and Haunted Mansion Holiday! ?Don’t forget the evenings dance party! ?If you’re lucky the Villains will show up to dance with you! 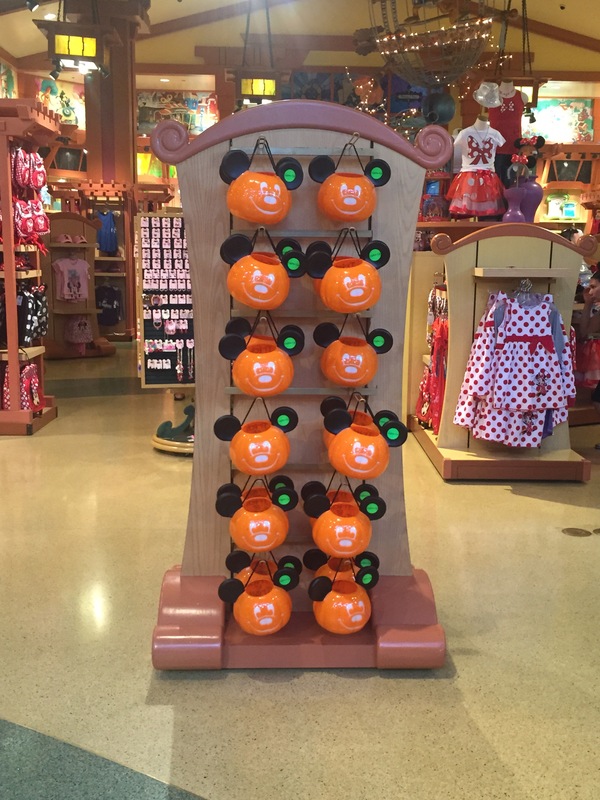 At Walt Disney World, Magic Kingdom becomes the host of Mickey’s Not So Scary Halloween Party! ?An event that shouldn’t be missed! 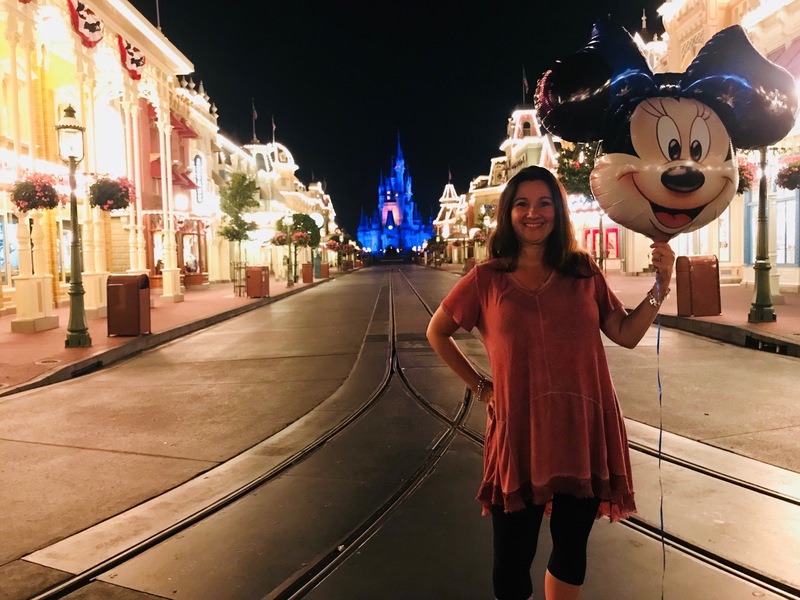 ?It is truly one of my favorite times at Walt Disney World! 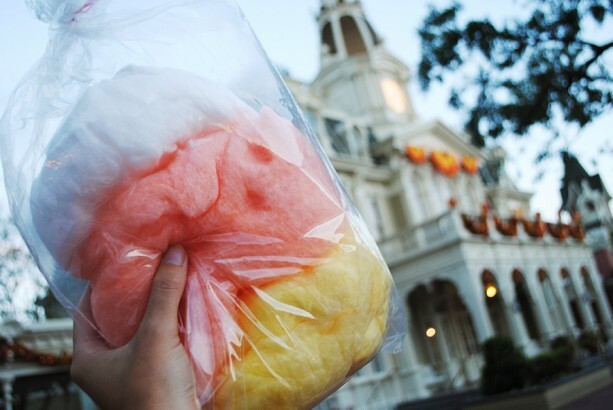 ?Much like Disneyland, Disney World is transformed into a Halloween spectacular, complete with Mickey’s Boo to You Parade (my favorite), ?HalloWishes Fireworks? 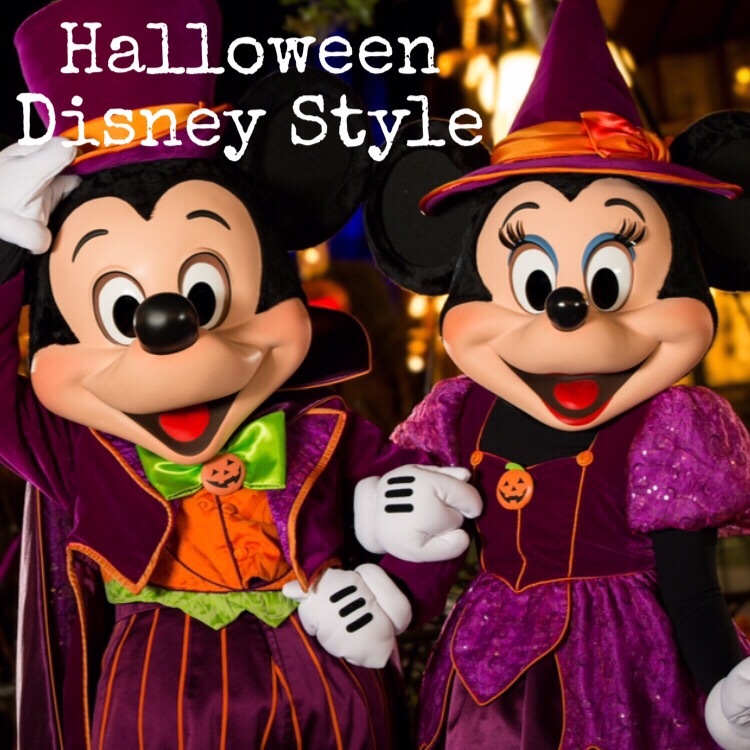 show and your favorite characters and Villains in their Halloween costumes! ?Last year I missed Mickey and Minnie and was super sad! ?This year, it will be at the top of my list! 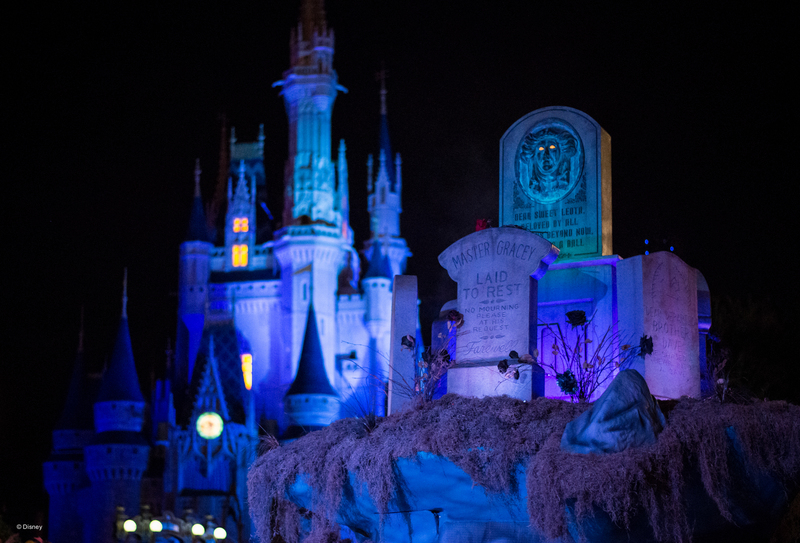 ?To top off the fun, you can Trick-or-Treat around the park enjoying the sights and sounds of “Happy Haunted Hallos” Disney’s special lighting, music and theming effects that transform Magic Kingdom. ?Did I mention I LOVE this party???!!! This even does sell out, so don’t wait to buy your tickets! ?I promise, you won’t be sorry! 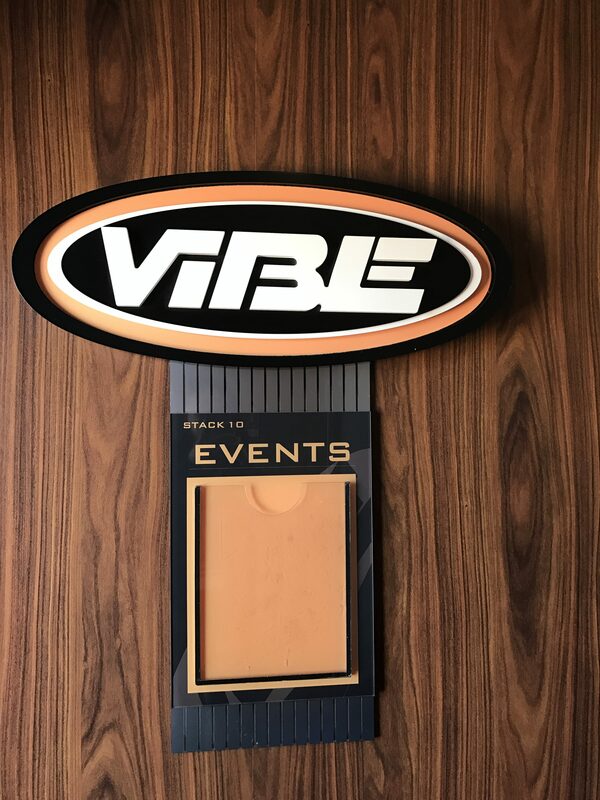 ?We will be there on October 9th, so make sure to say hi! This year I will get my picture with them! 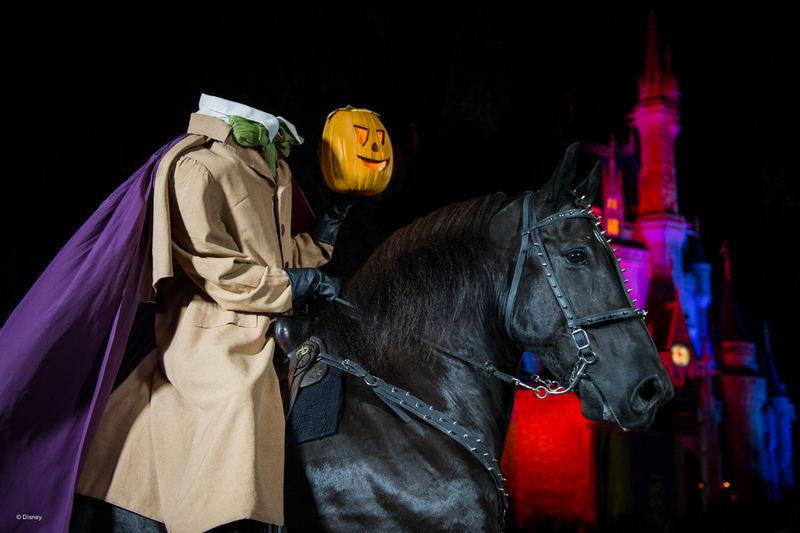 We love the Headless Horseman! He rides down Main Street right before the parade. A must see! I can hear the song in my head right now! 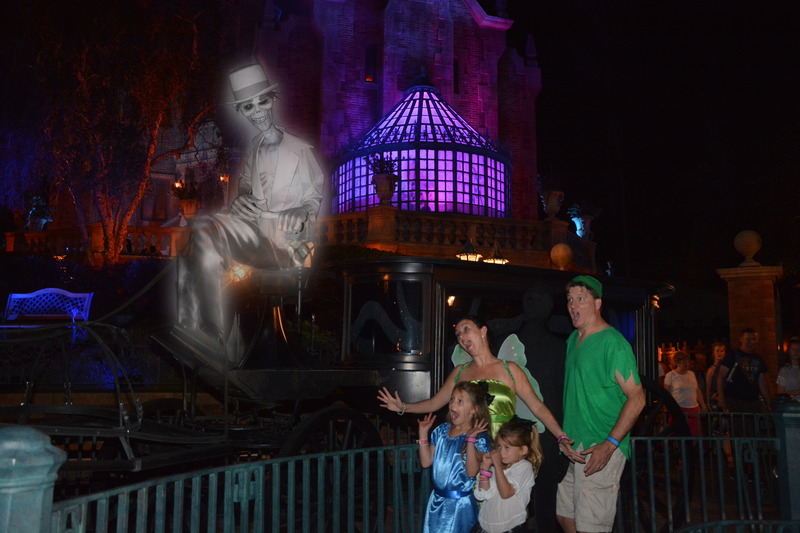 You can take your picture in front of the Haunted Mansion. When you view it later, a ghostly rider shows up! I just love this! It was on our Memory Maker CD! Disney’s stock photos make it worth the purchase! 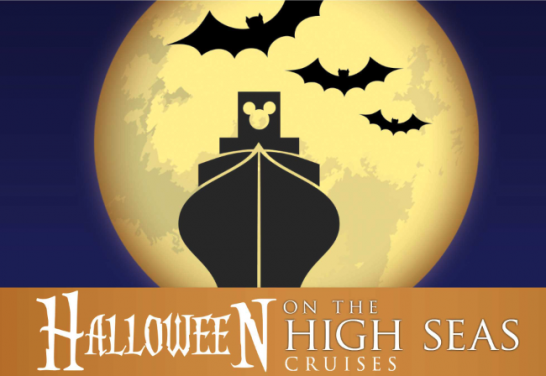 Disney even celebrates Halloween on High Seas! ?I have not previously experienced this particular event, but I am ecstatic to say this year we will be! 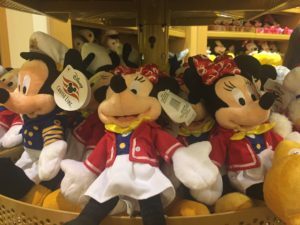 ?Disney Cruise Line will host Halloween events on all of their cruise ships, the Disney Dream, Disney Magic, Disney Wonder and the Disney Fantasy! 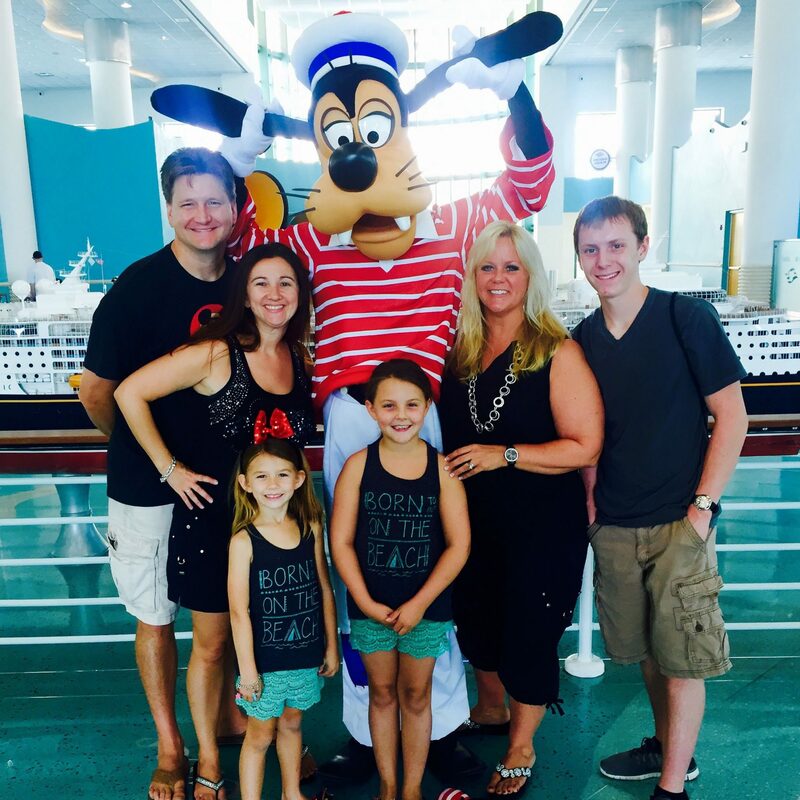 ?You’ll find us aboard the Disney Fantasy! ?I’m excited to experience all that the Fantasy has to offer! 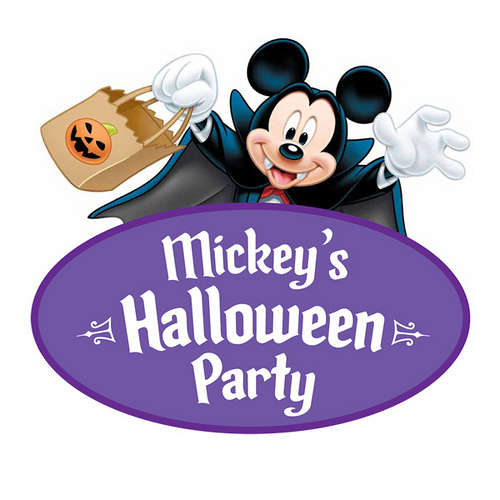 ?Aboard we will join in Mickey’s Mouse-querade party, “an atrium party scare-a-bration with ghoulish games, Trick-or-Treating and dancing with Disney pals in their holiday attire.? ?Haunted Stories of the Sea, a spooky storytelling experience on the deck!” is sure to be fun! 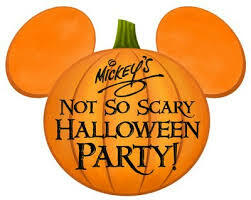 ?They will also be offering Halloween themed activities to include mask making and pumpkin carving! ?Hello, can you say my pumpkin is going to need ears! 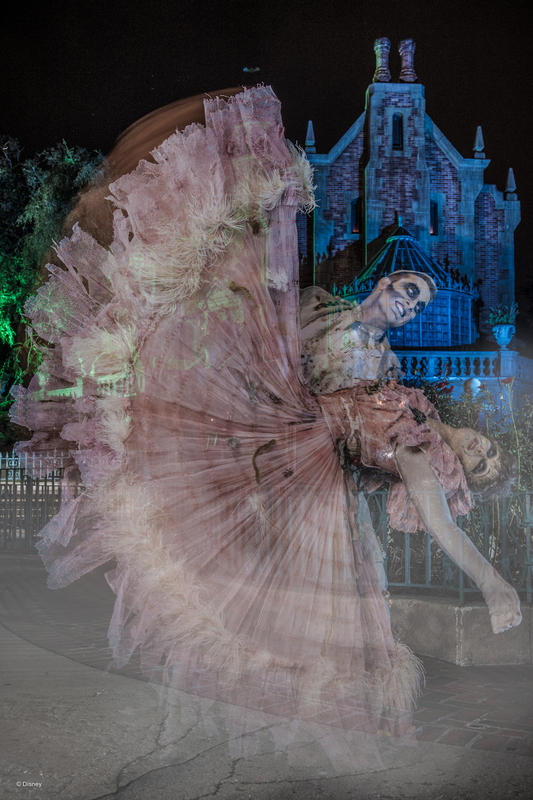 ?The list goes on, Tim Burton’s The Nightmare Before Christmas Sing and Scream show that finales with a meet and greet opportunity with Jack and Sally! ?And the event I’m looking most forward too, an adults only “Halloween Isn’t Just for Kids” costume party! For bookings on Disney Cruise Line you should always call your travel agent and find out what type of on board credits can be offered! I just love this display! 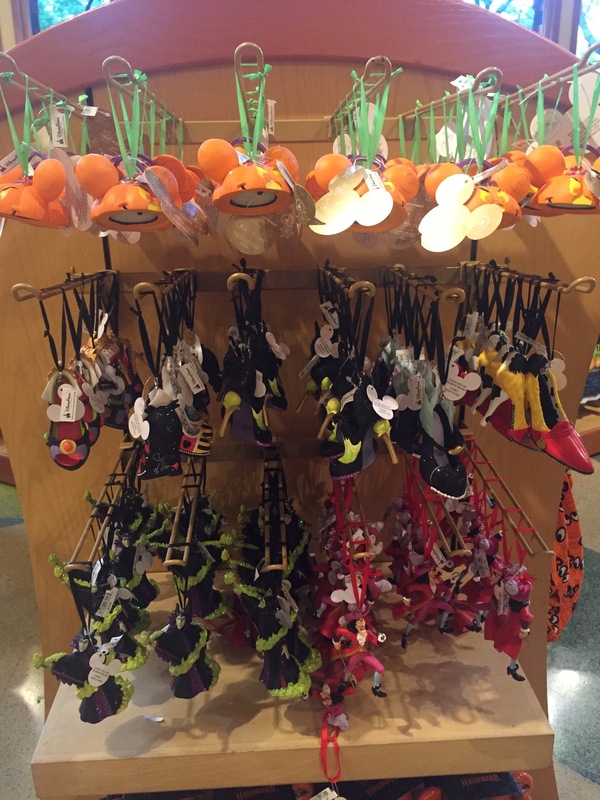 Can Minnie, Mickey and Pluto please come decorate my house??!! 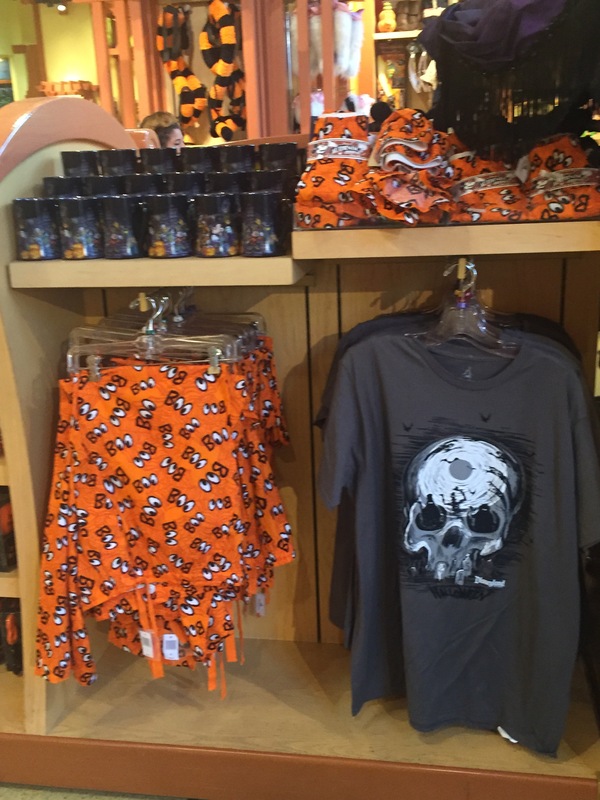 PJ pants, a spooky shirt and more mugs! Close up of the Halloween count down calendar! I love this! 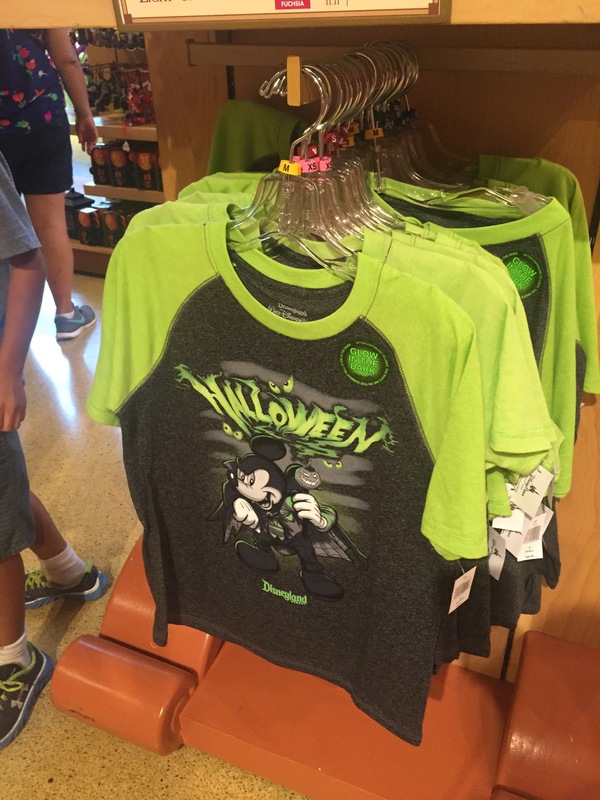 This years Halloween t shirt, Halloween ears and a few other decorations. Close up of one of the decorations. So cute! 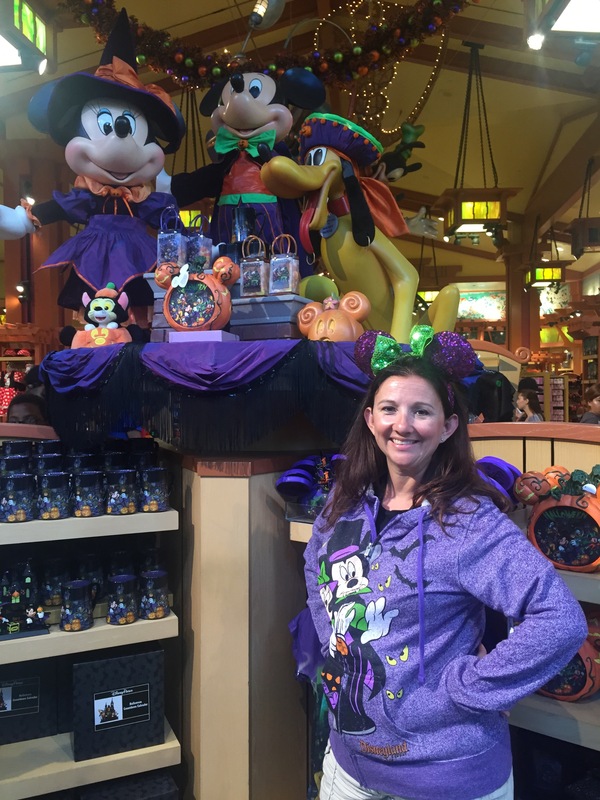 I love this Halloween Hoodie and Mouse ears headband! See, I love it so much I couldn’t resist trying it on! 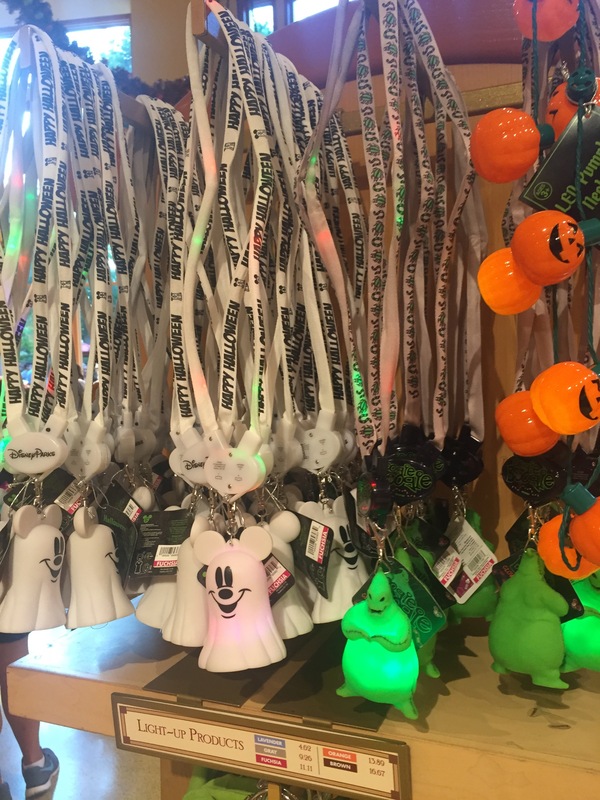 Light up lanyards! 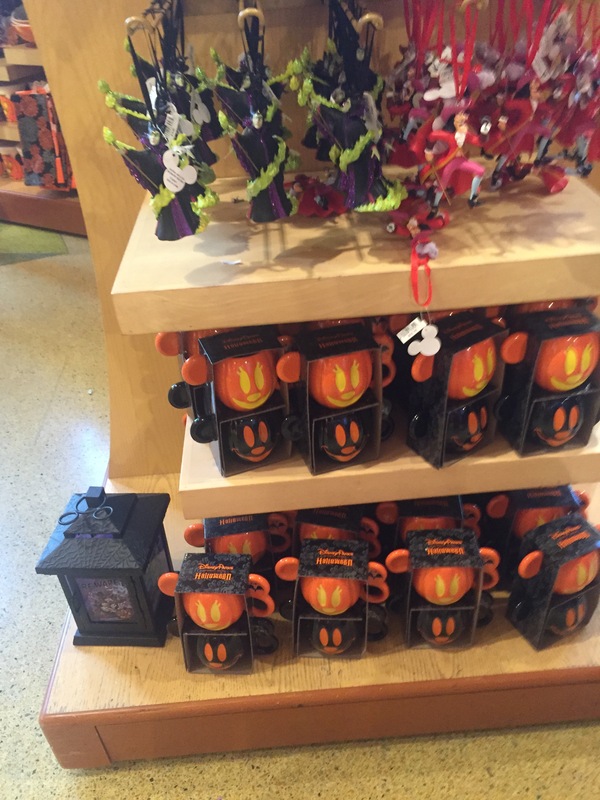 Complete with a Mickey ghost of course! 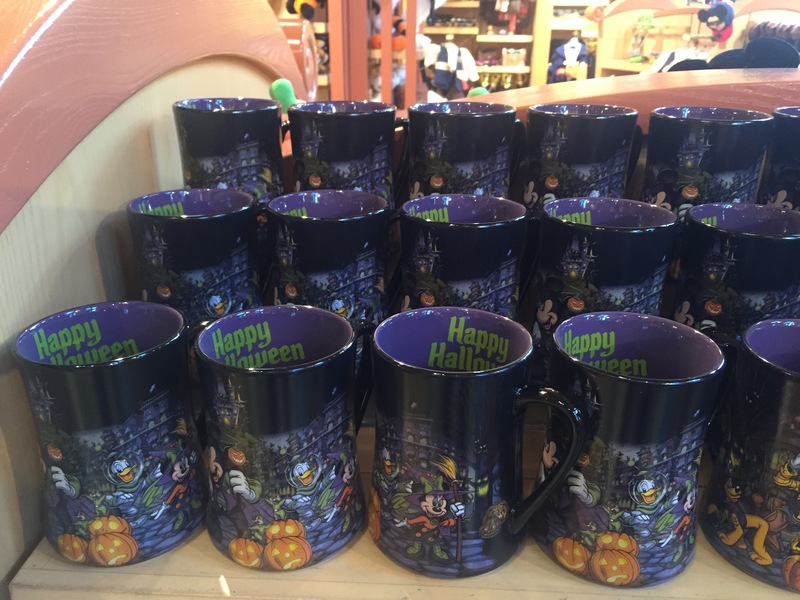 The most adorable stack-able Halloween coffee mugs! I had to buy these for my neighbor!